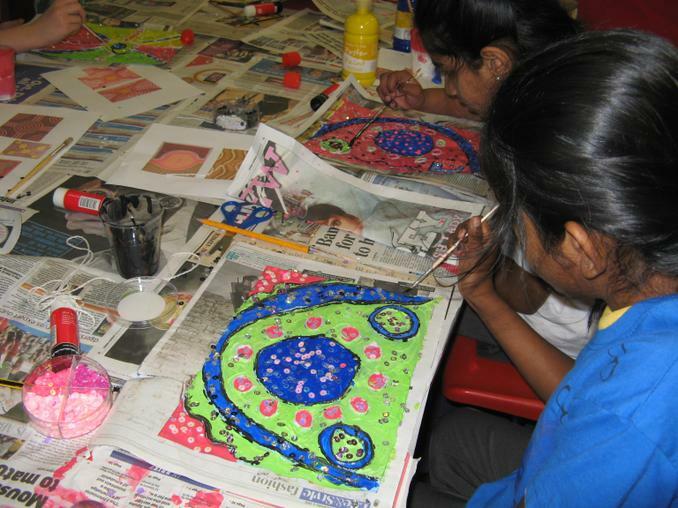 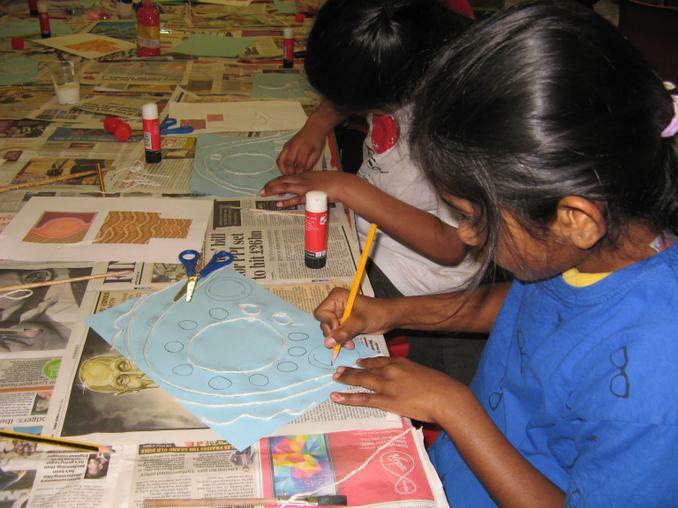 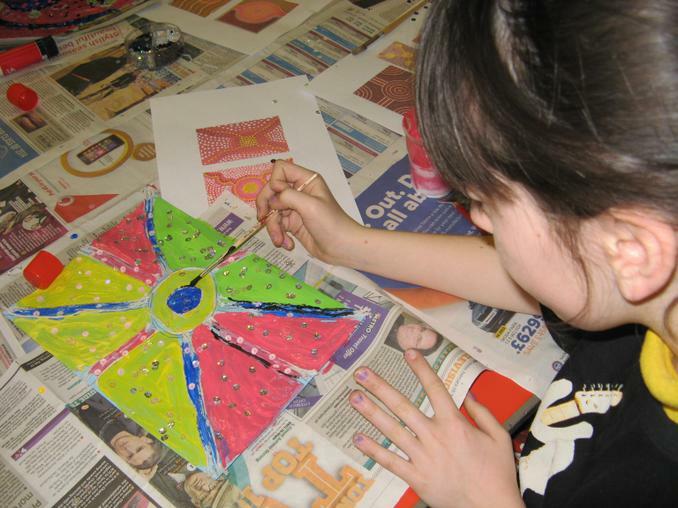 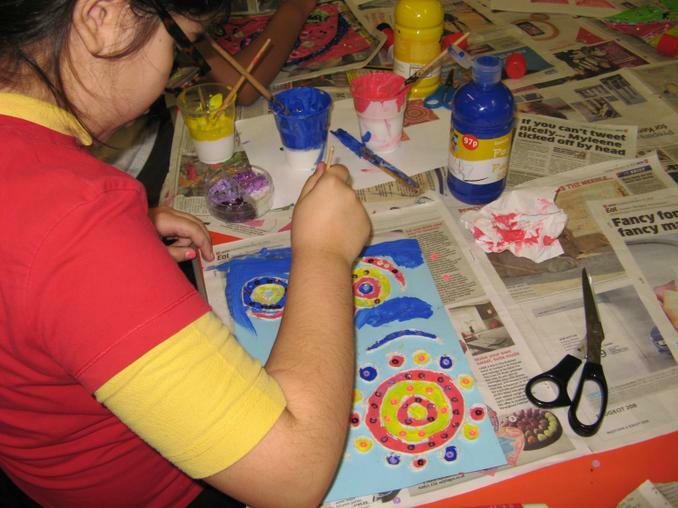 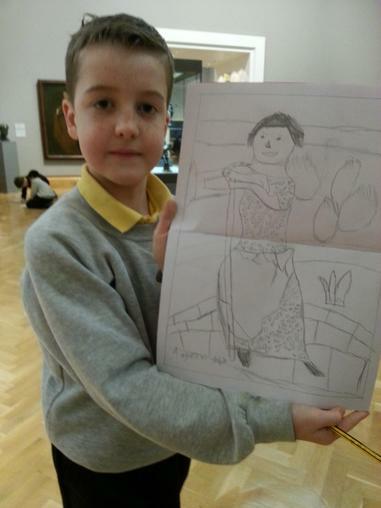 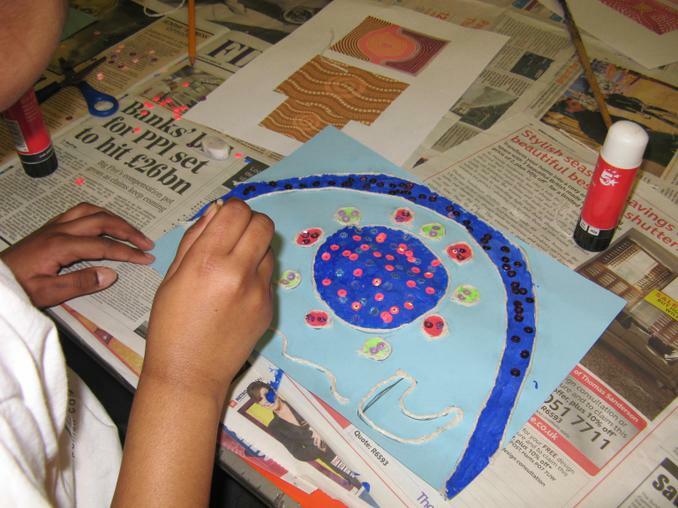 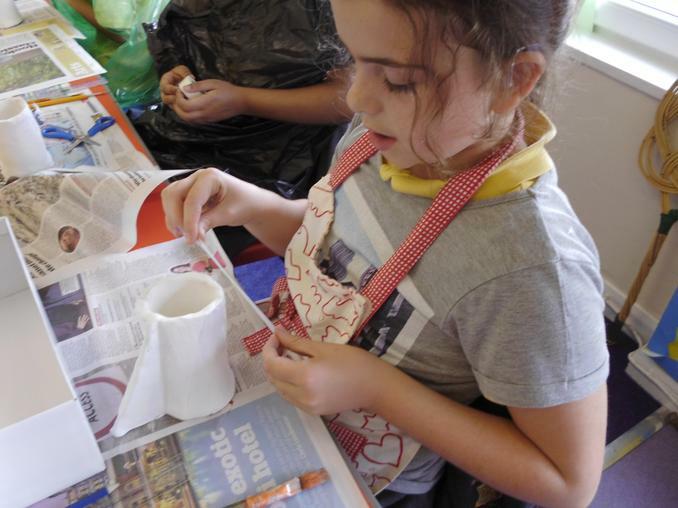 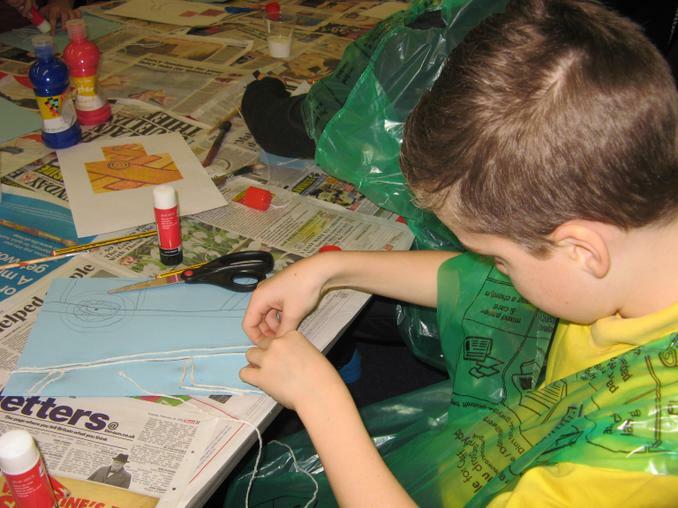 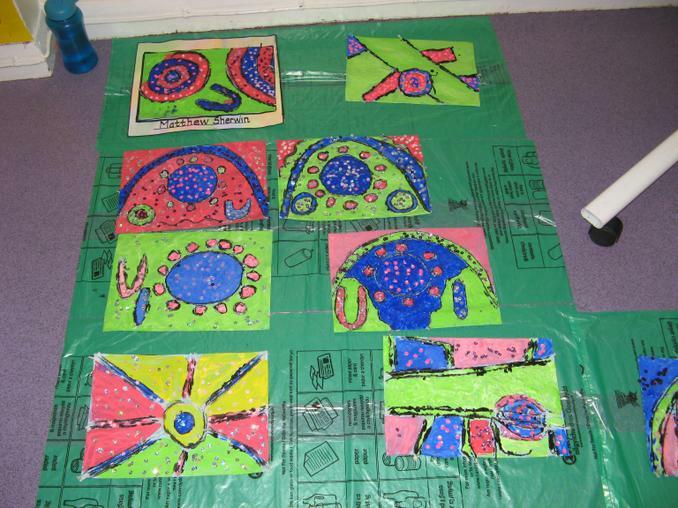 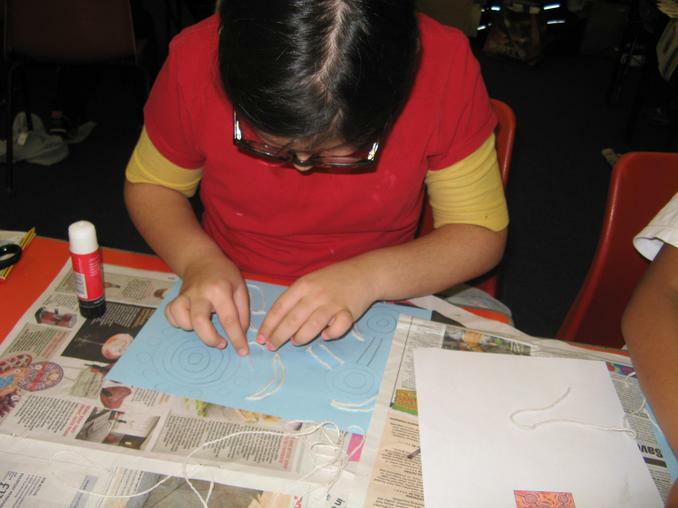 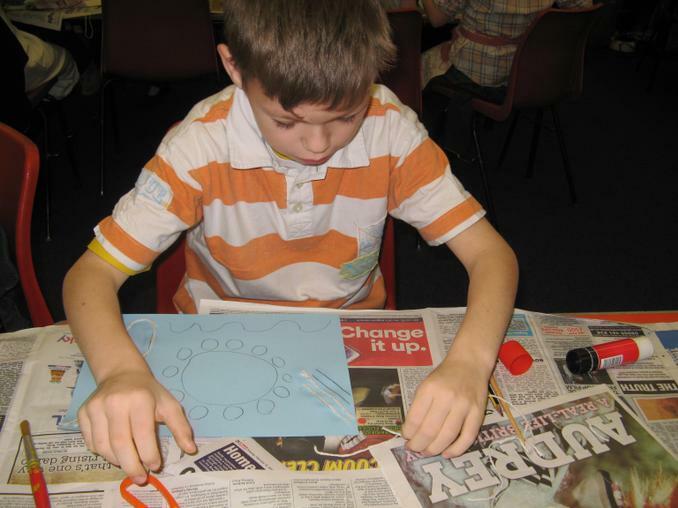 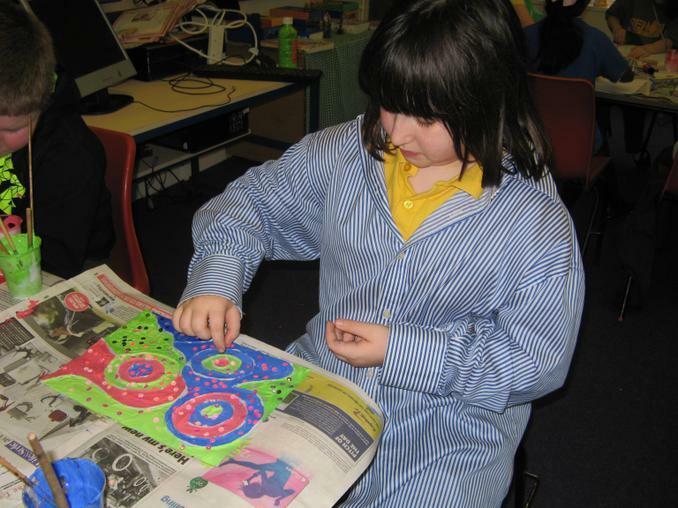 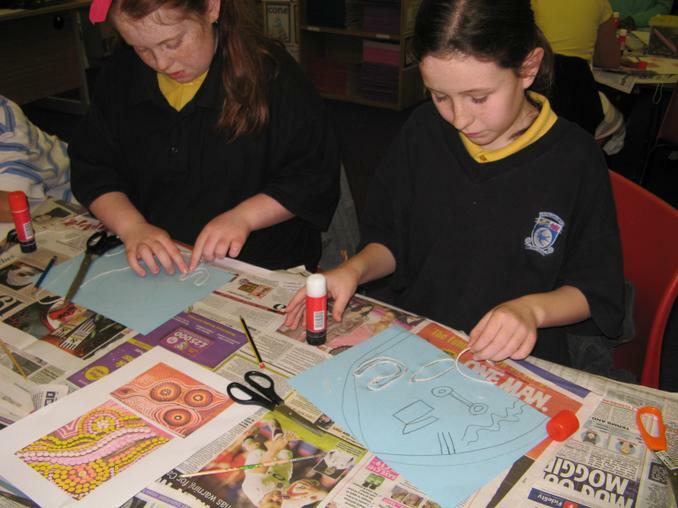 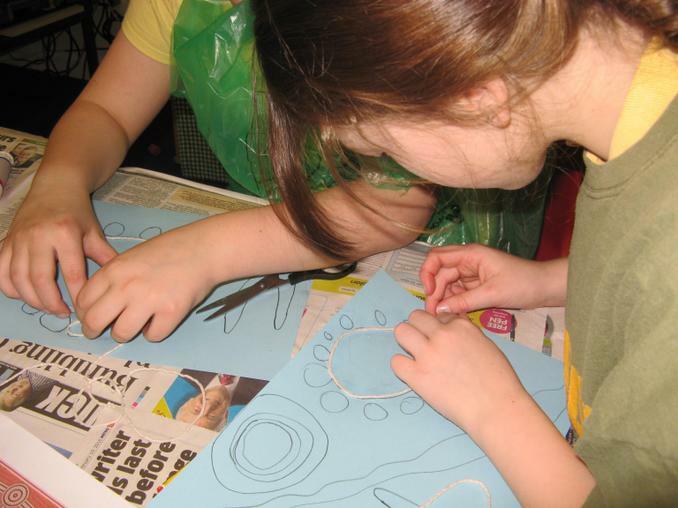 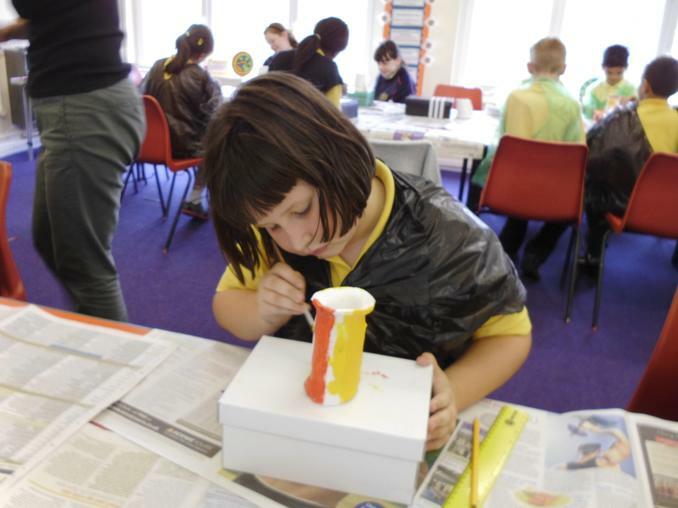 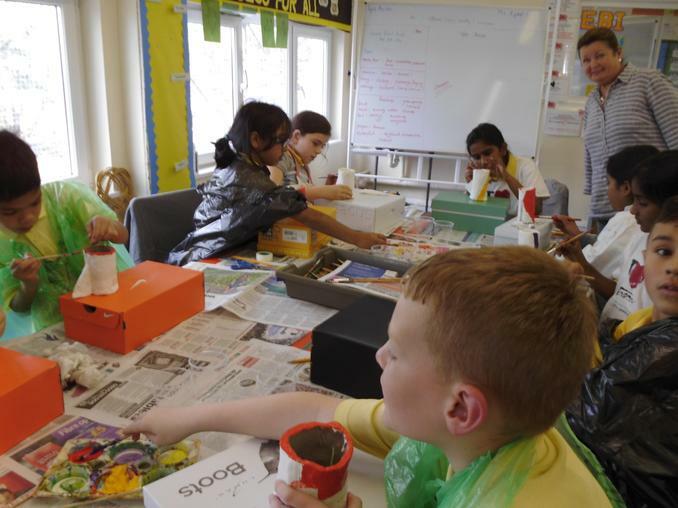 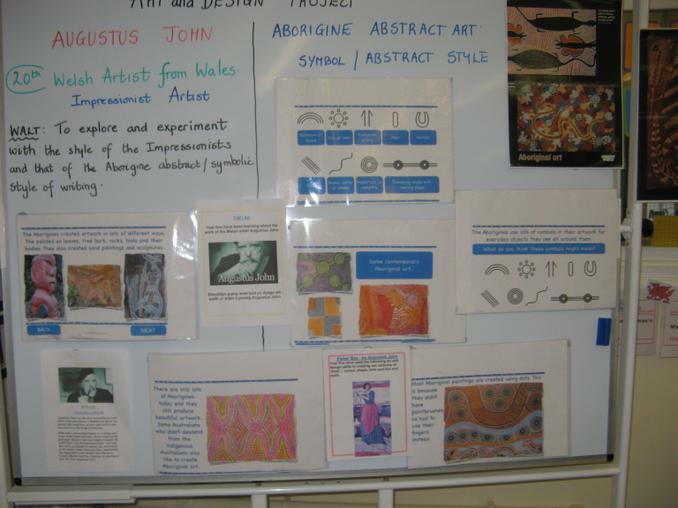 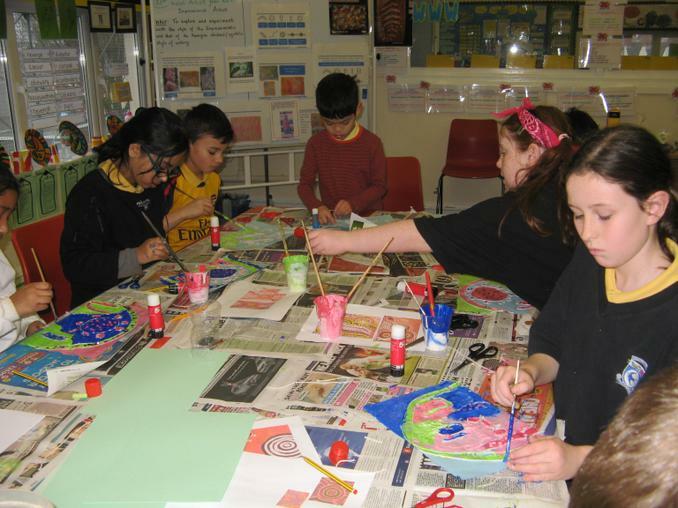 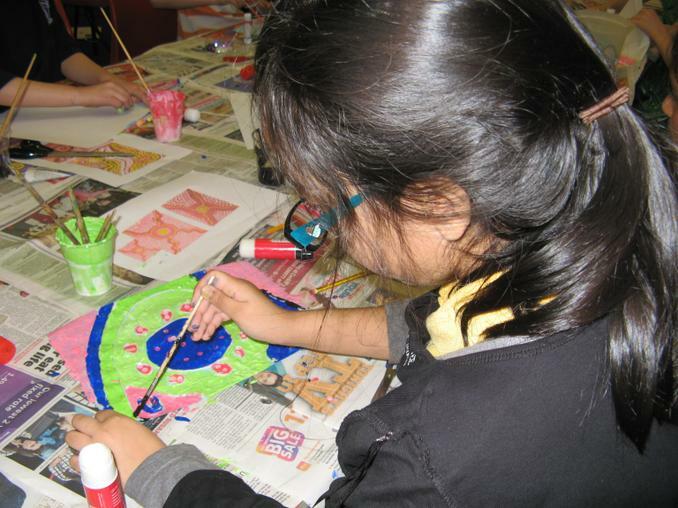 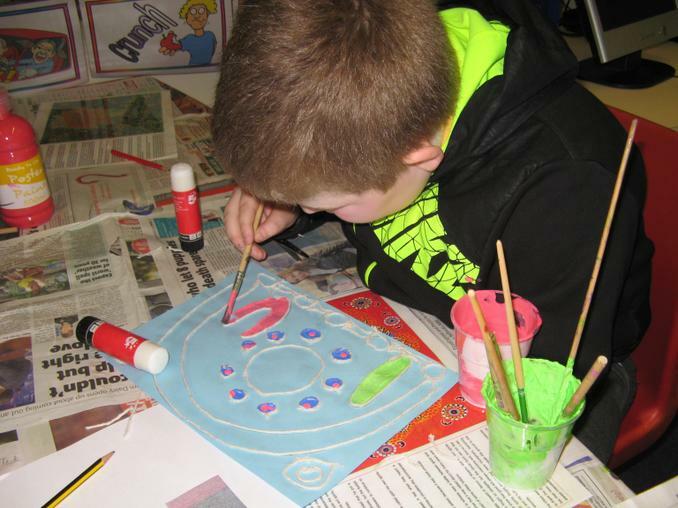 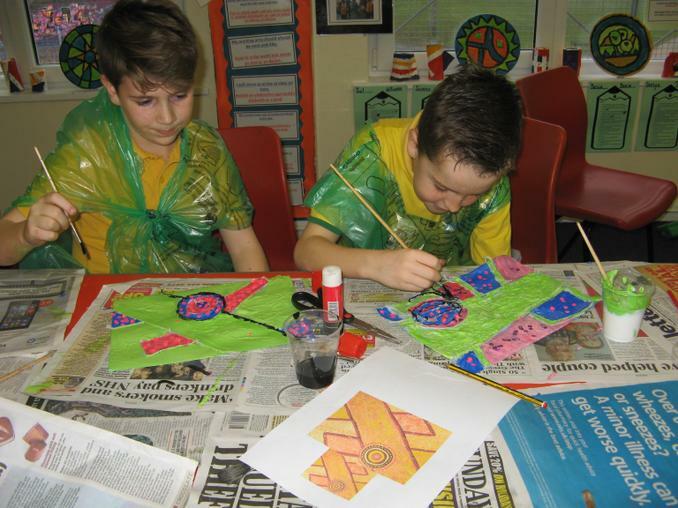 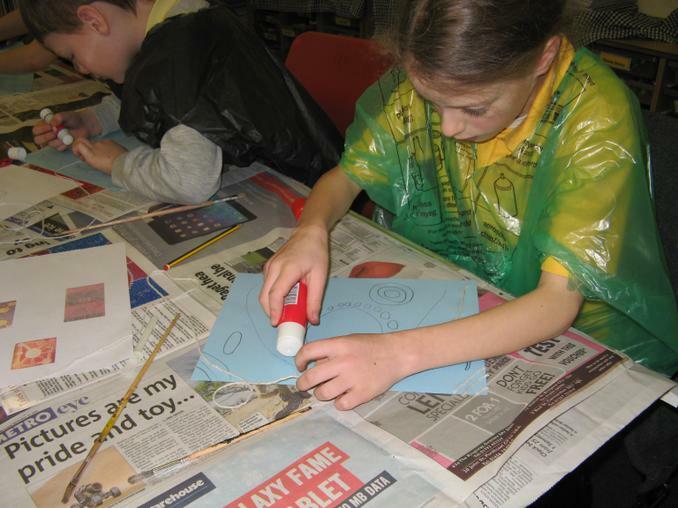 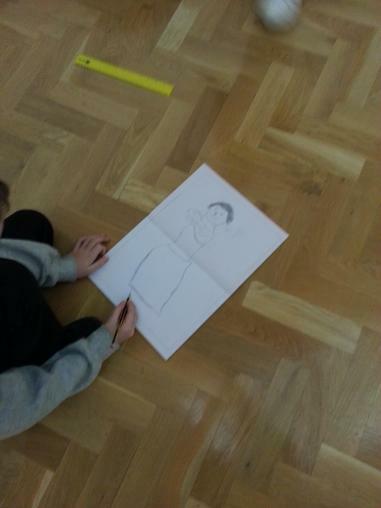 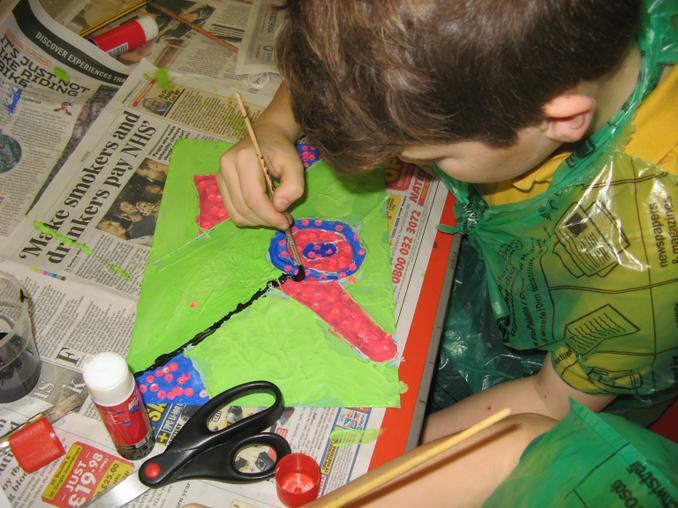 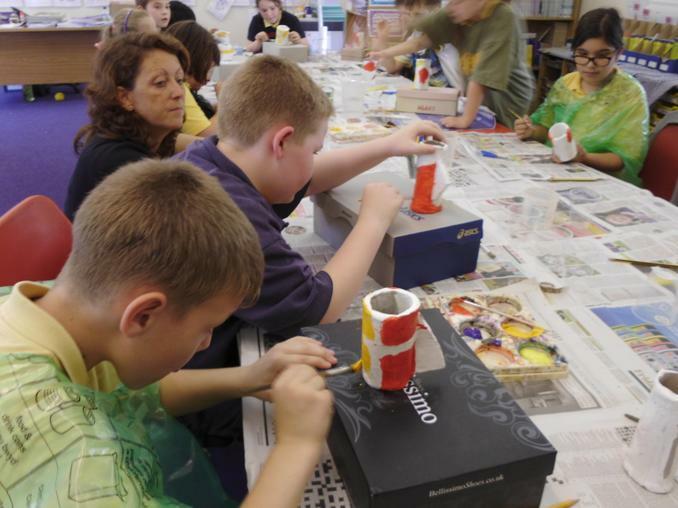 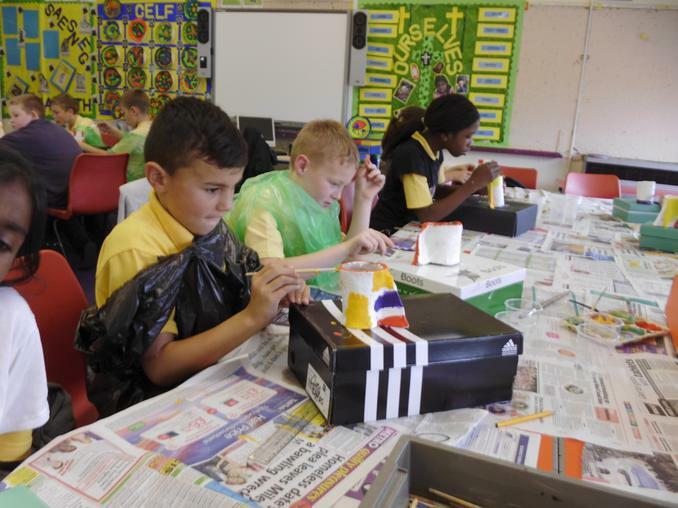 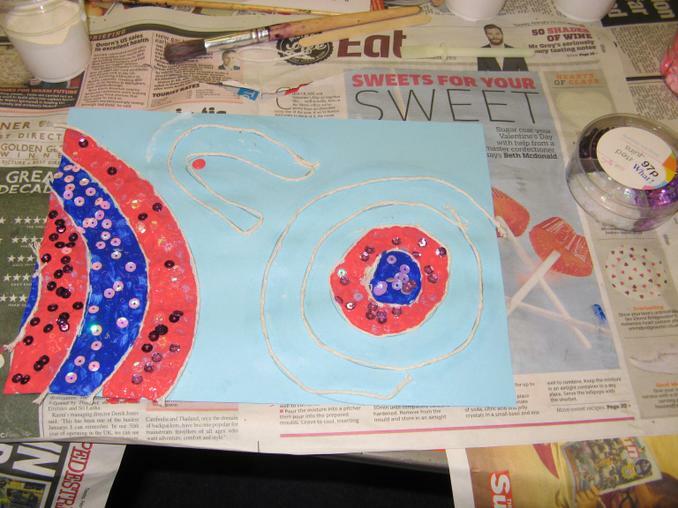 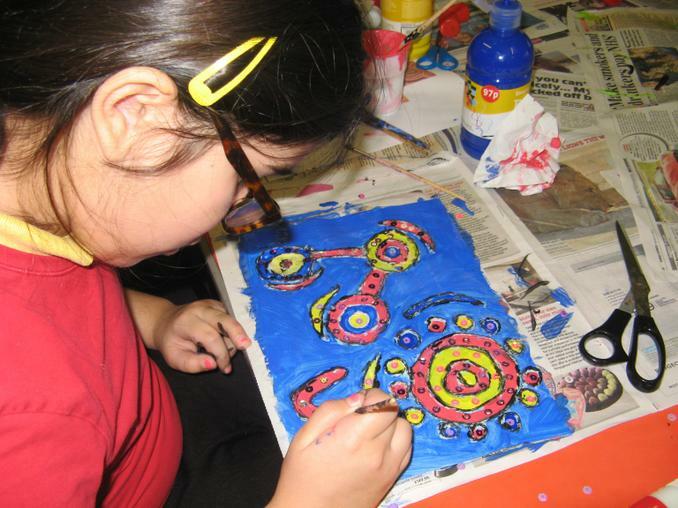 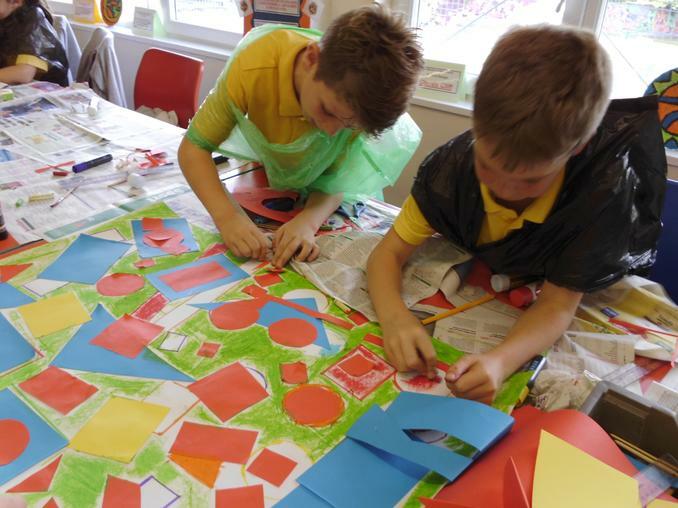 Aborigine Art and Design Project: FOllowing year five's educational rip to the National museum of Wales to study the Impressionist works of the Welsh artists Augustus and Gwen John, the children have studied the abstract dseigns of the Australian Aborigine artists to draw a comparison between two cultures. 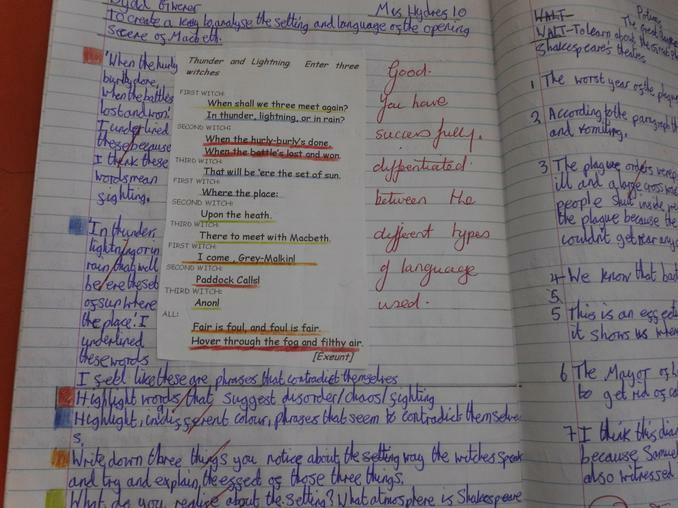 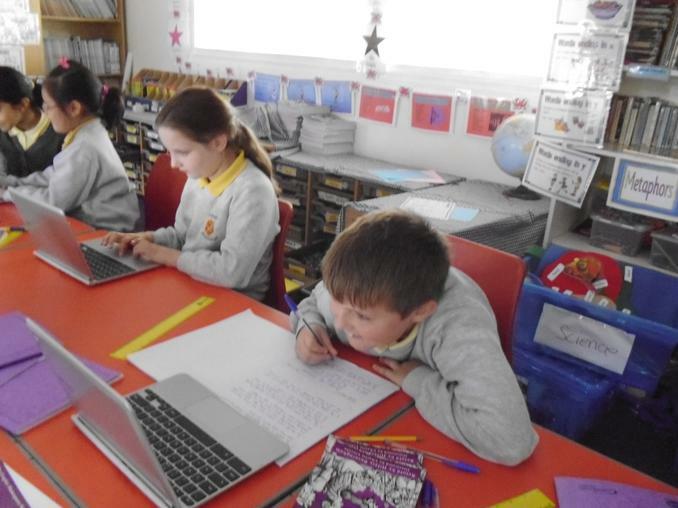 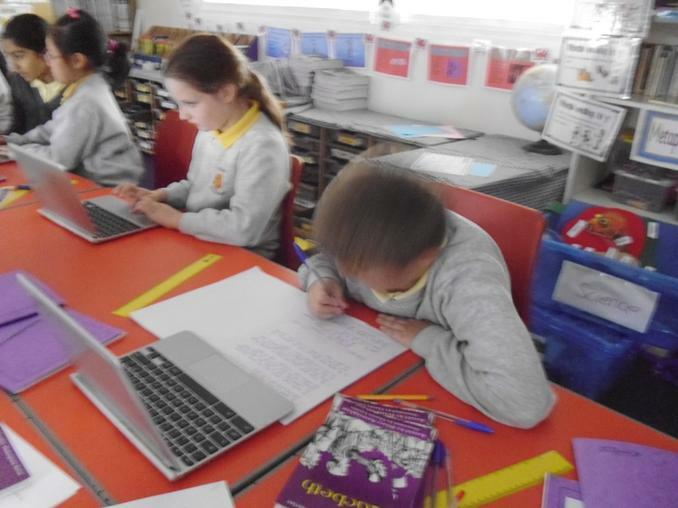 Year Five Homework: The children in year five are required to write a poem 'My land of Wales' The poem can be written or presented using IT skills. 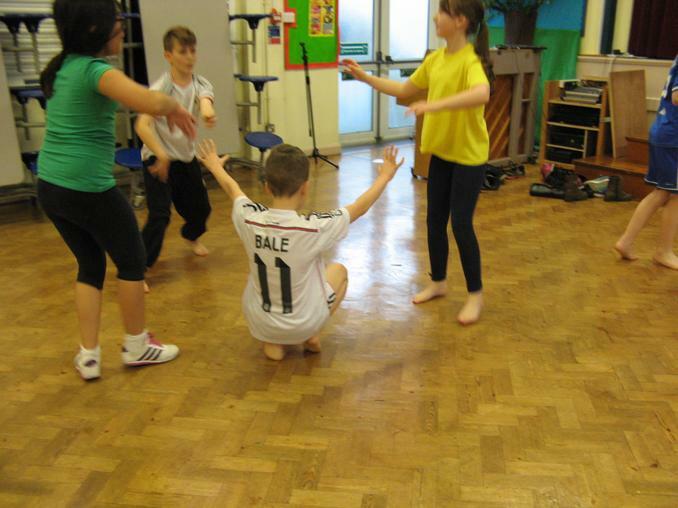 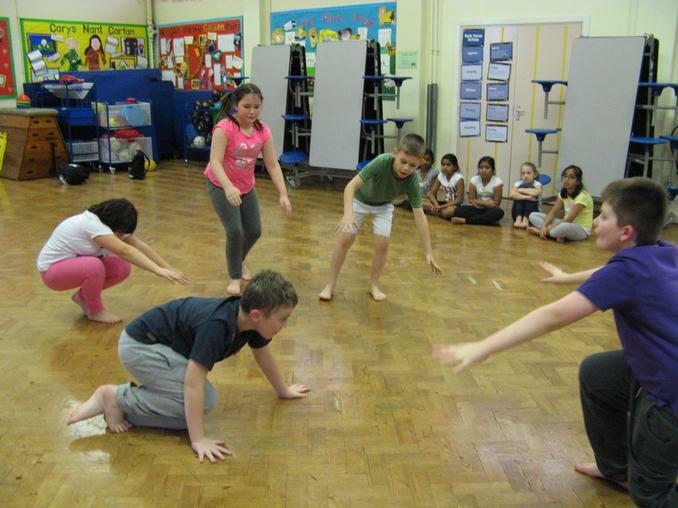 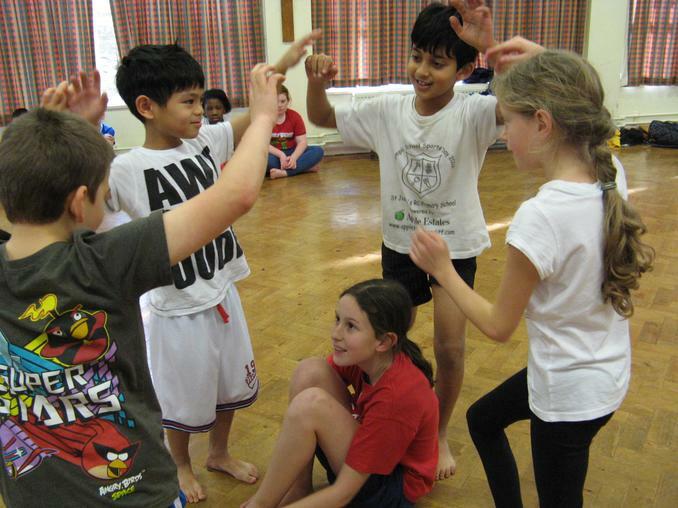 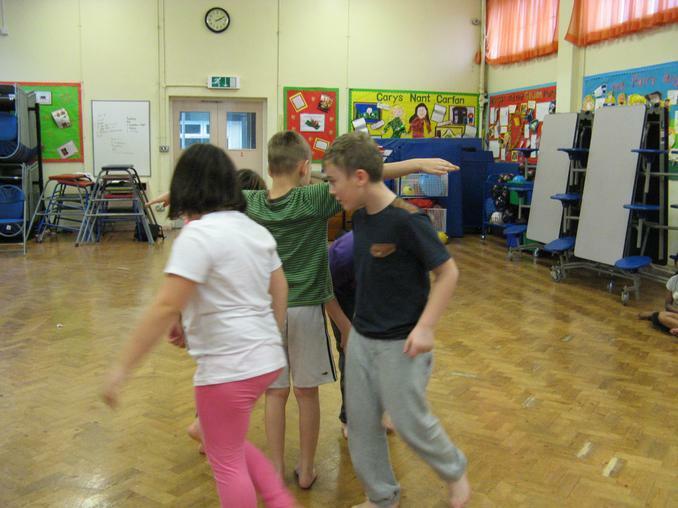 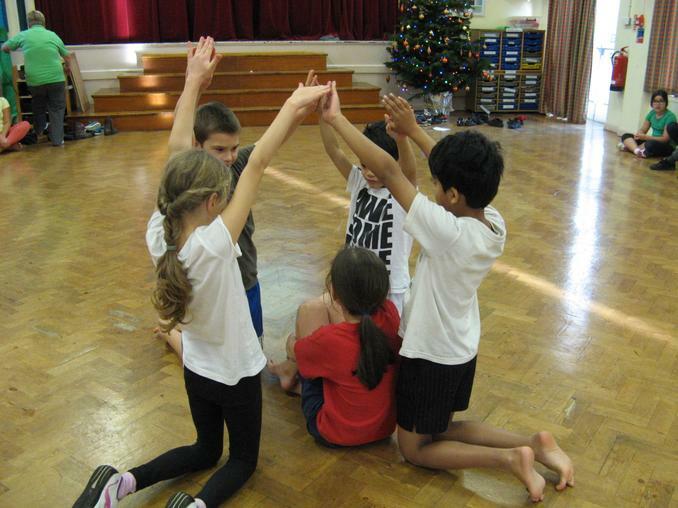 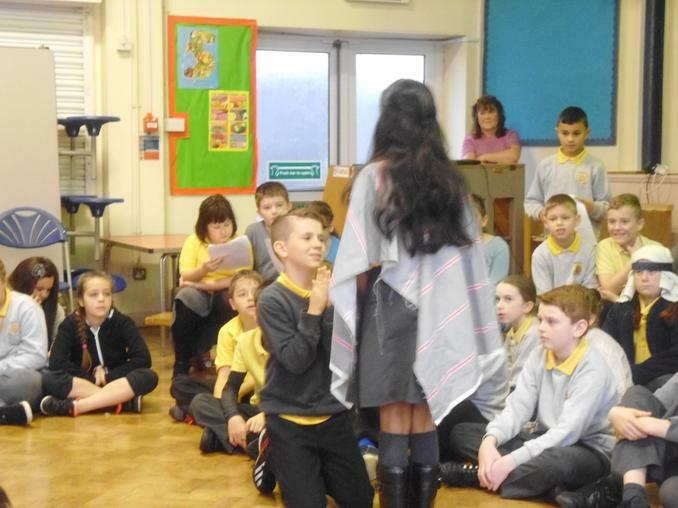 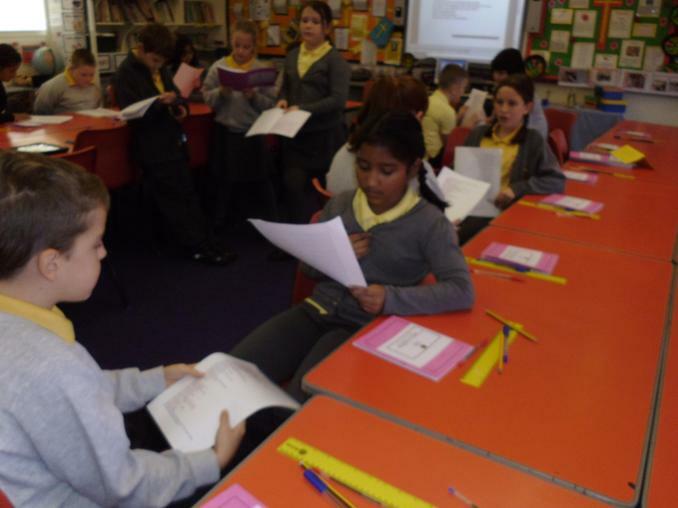 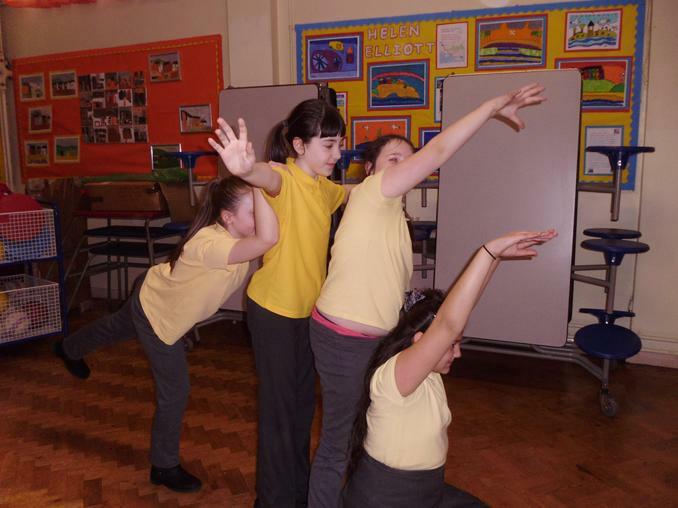 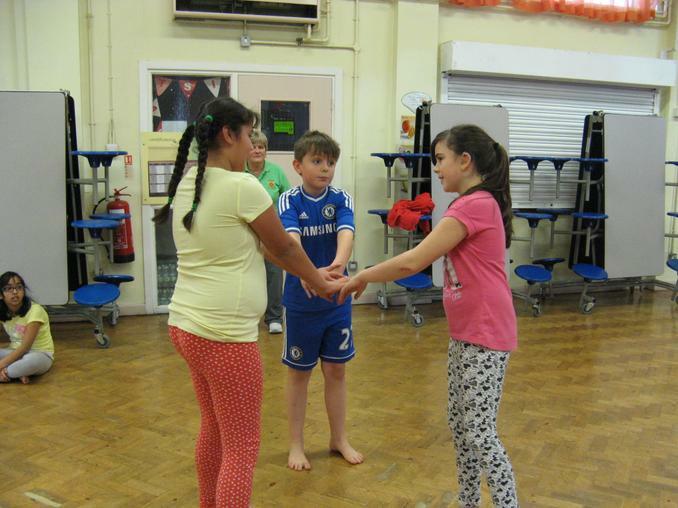 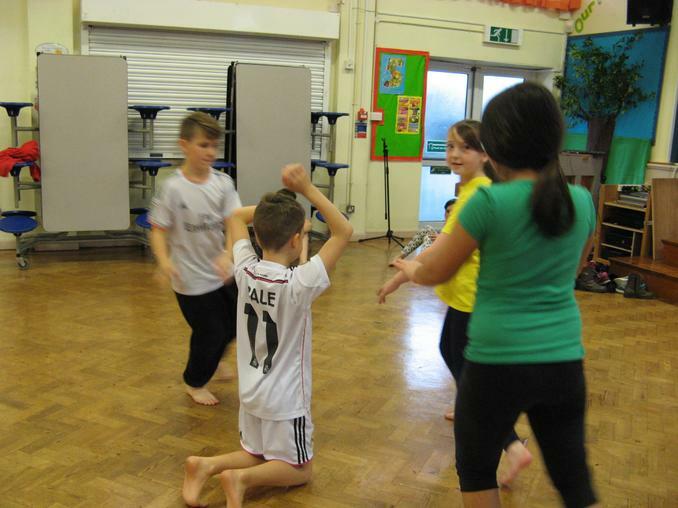 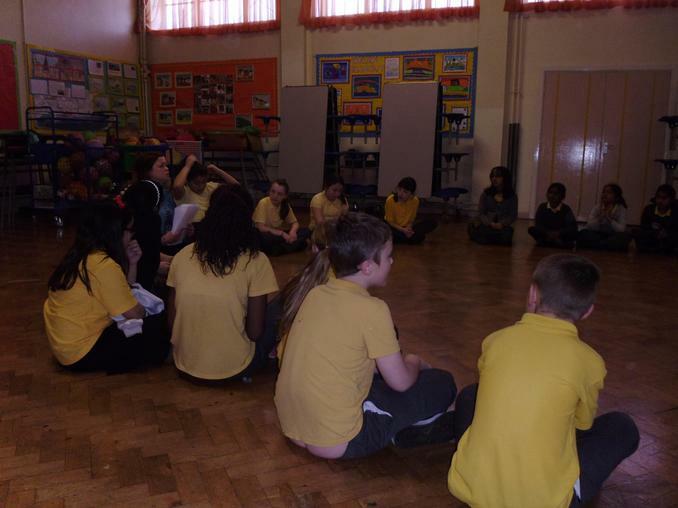 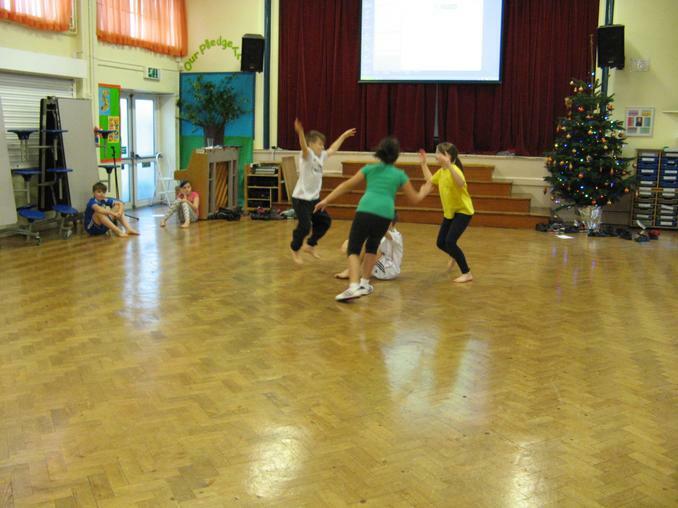 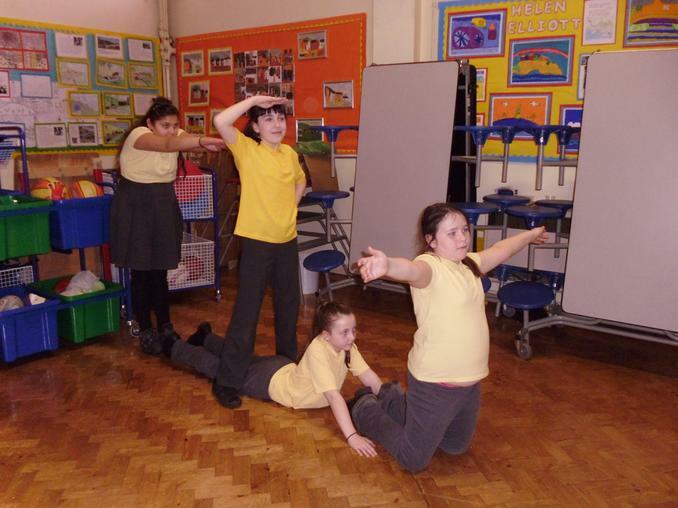 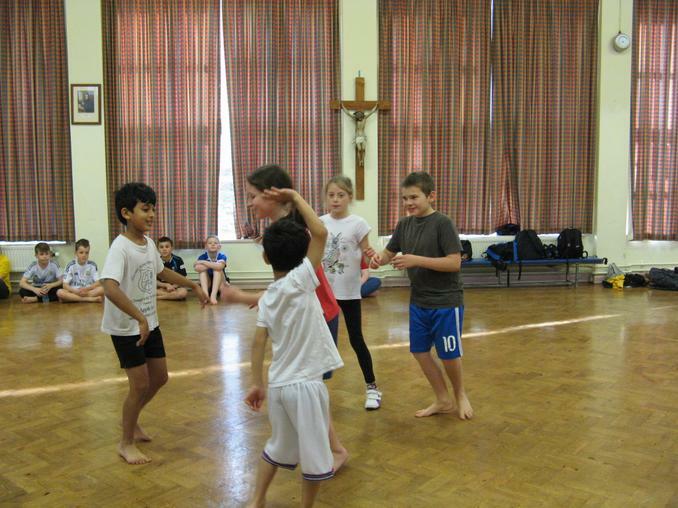 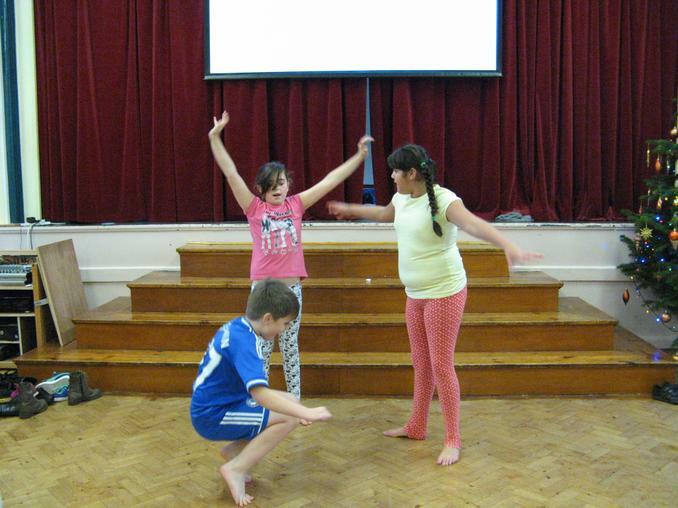 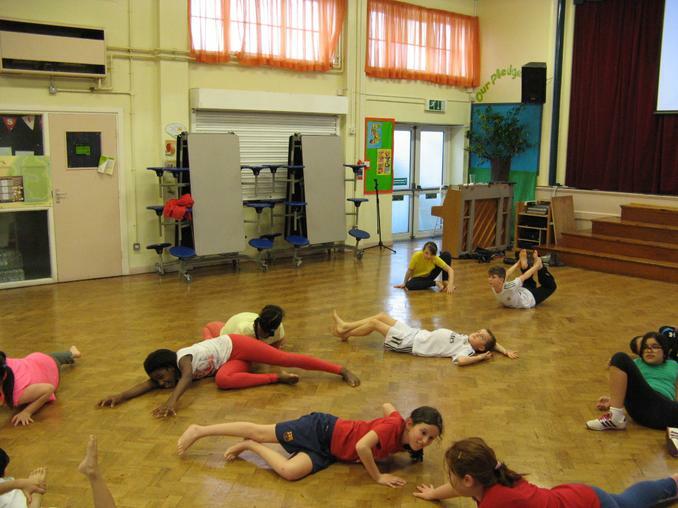 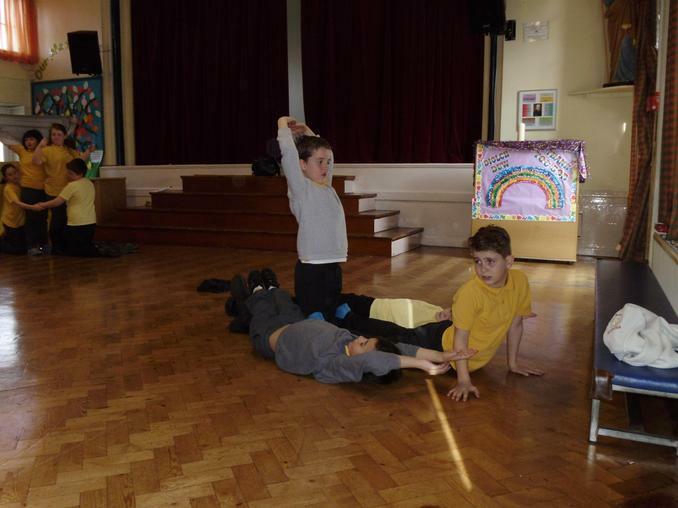 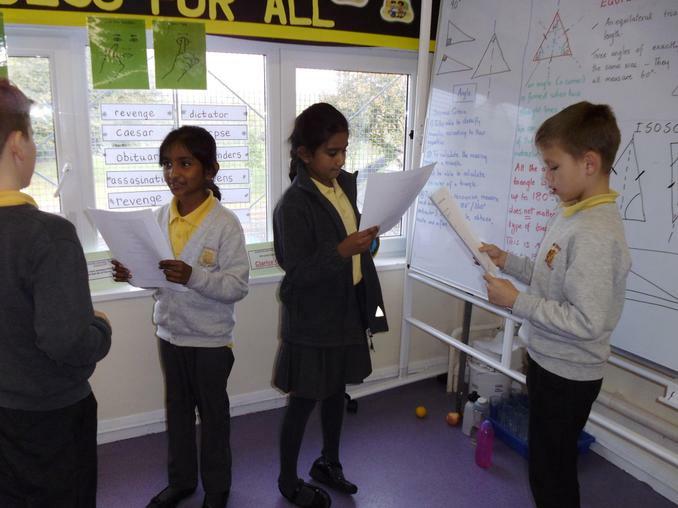 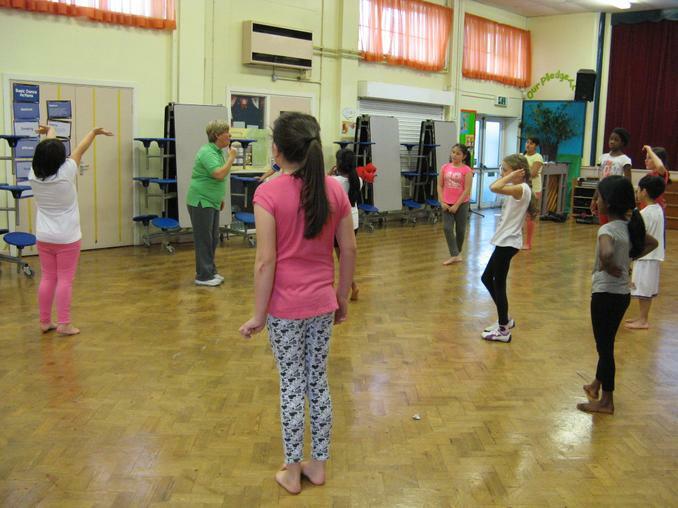 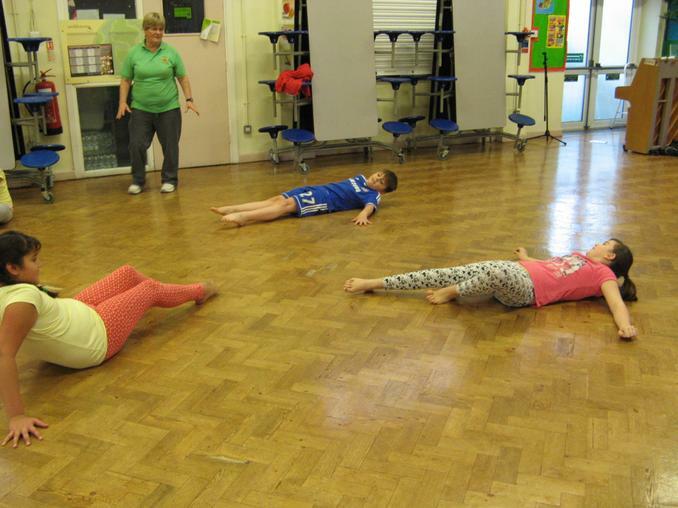 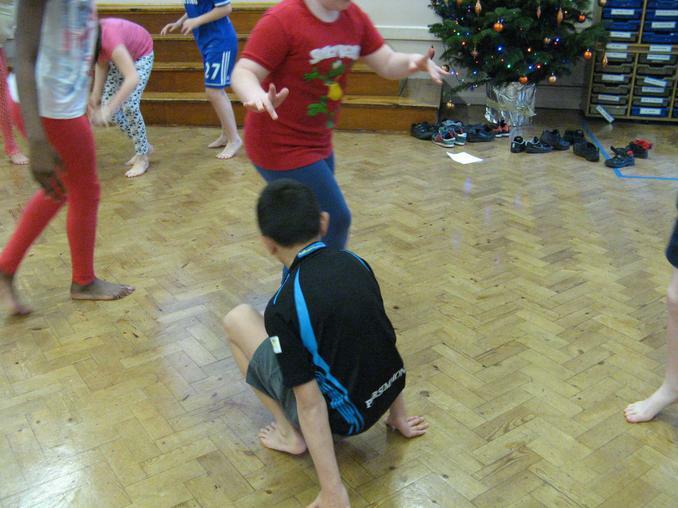 in addition those children who have major roles in the gelert play must learn their lines off by heart. 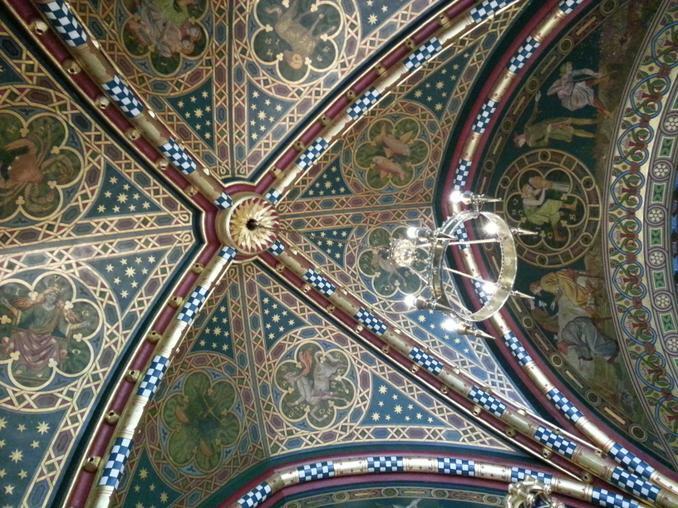 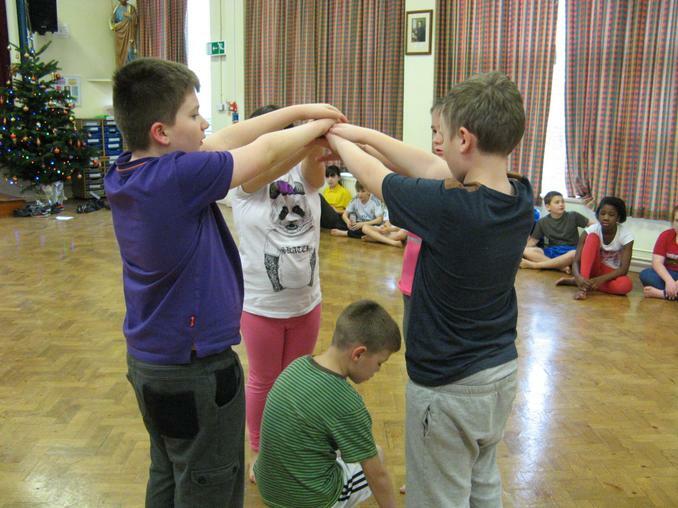 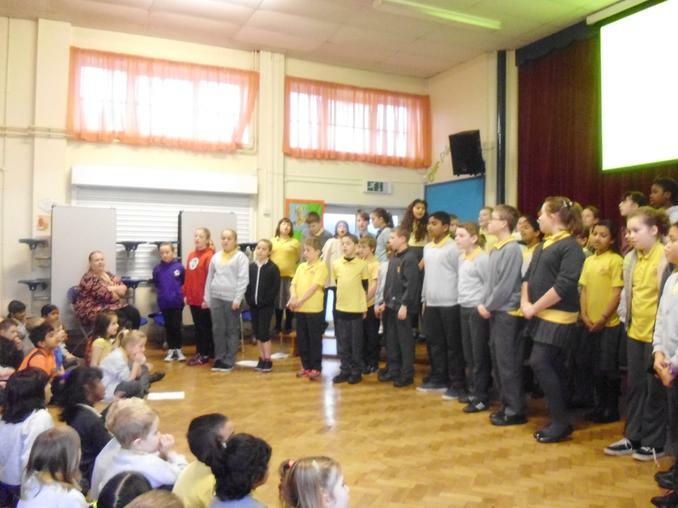 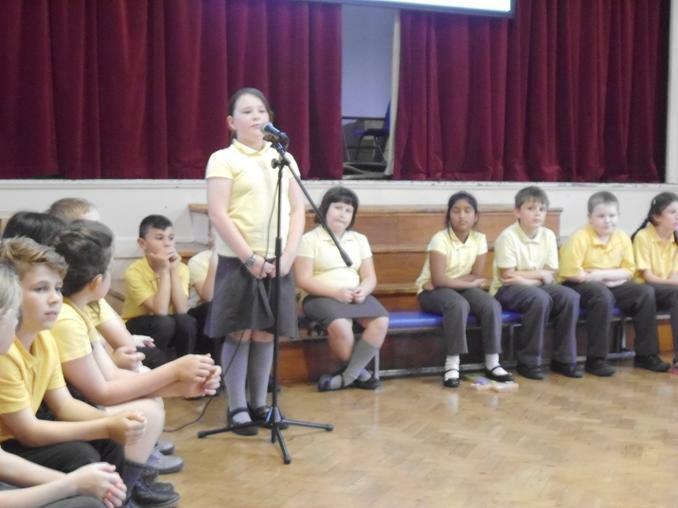 In addition children should learn their choral parts for the choral speaking task for gelert as well as their parts for the class assembly which will now take palce on the 9th march at 3.30. 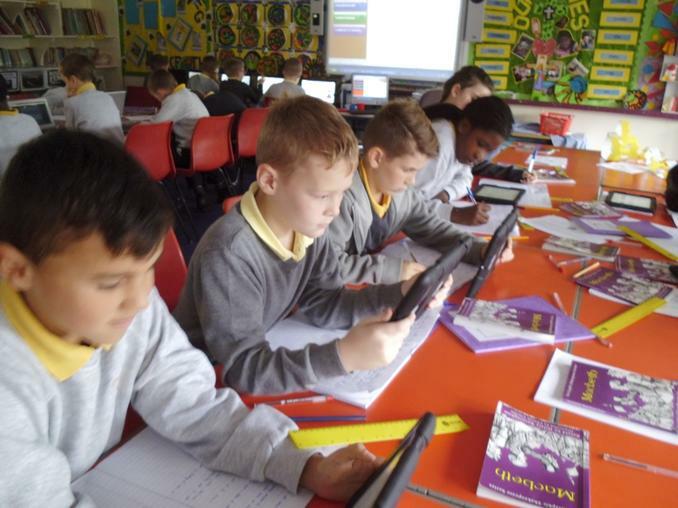 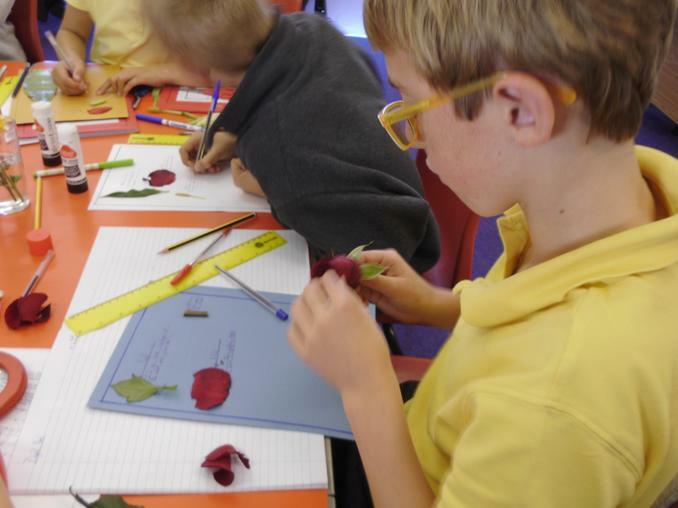 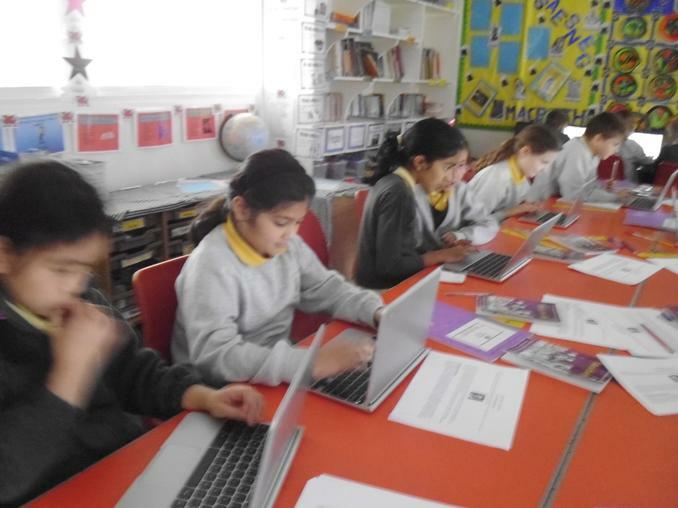 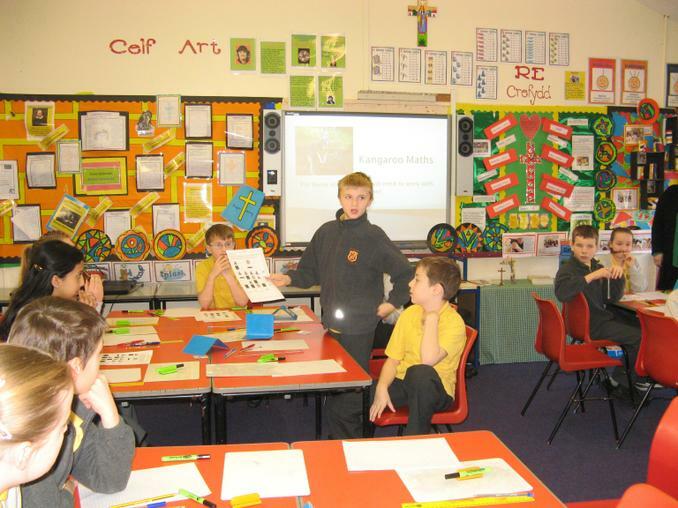 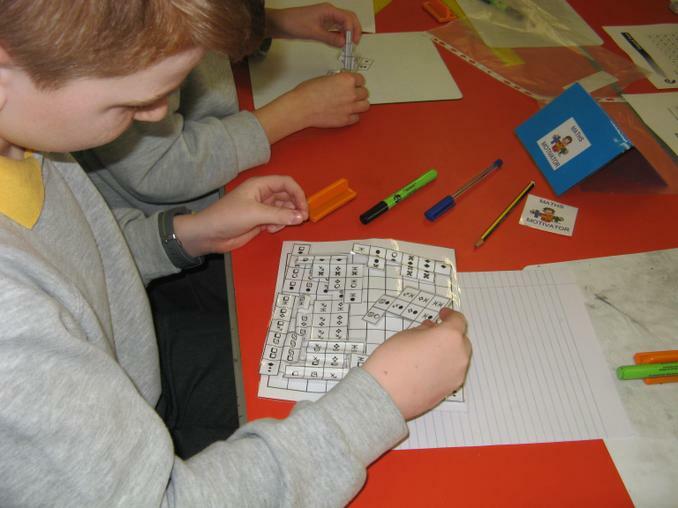 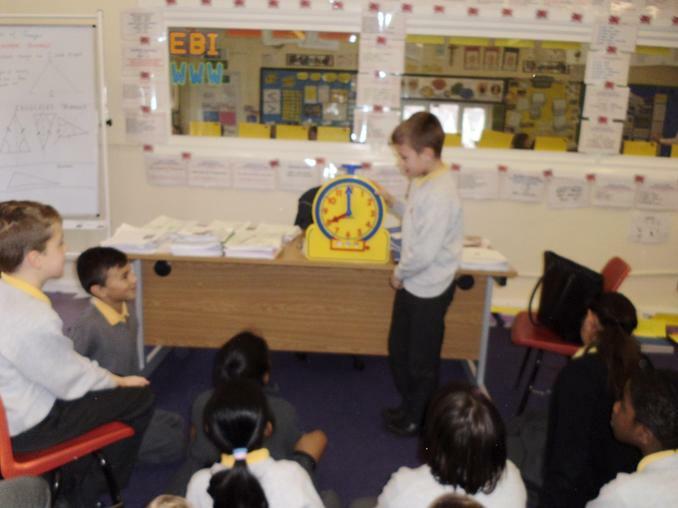 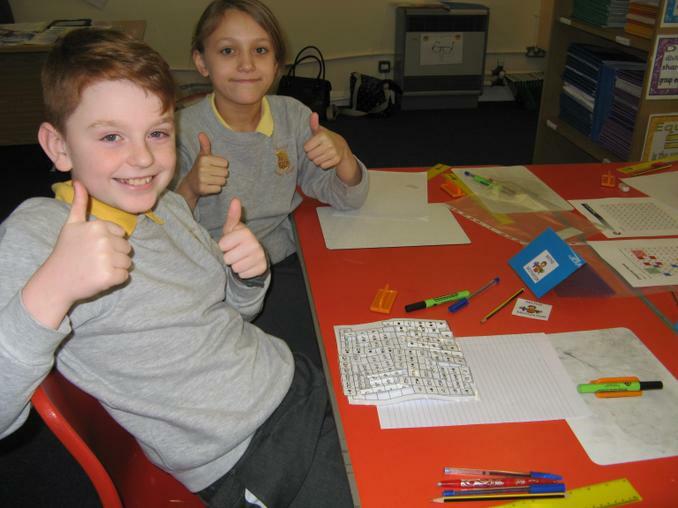 Thank you, Mrs H.
Kangaroo Maths Numerical and shape, data and measure reasoning activities - these tasks have now been covered in class by the year five pupils in ms. houston's class. 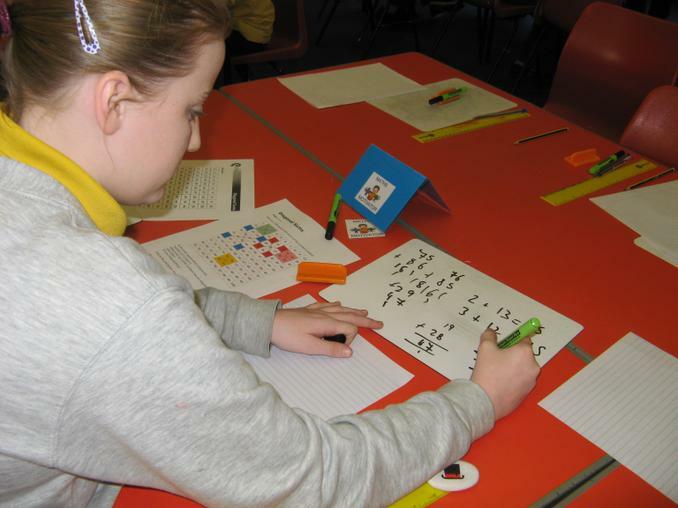 however, they are an excellent resource for parents to assist their children at home with their reasoning skills. 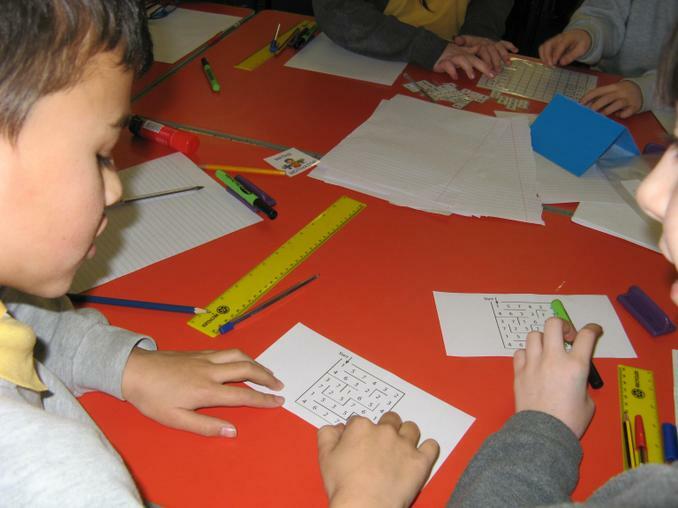 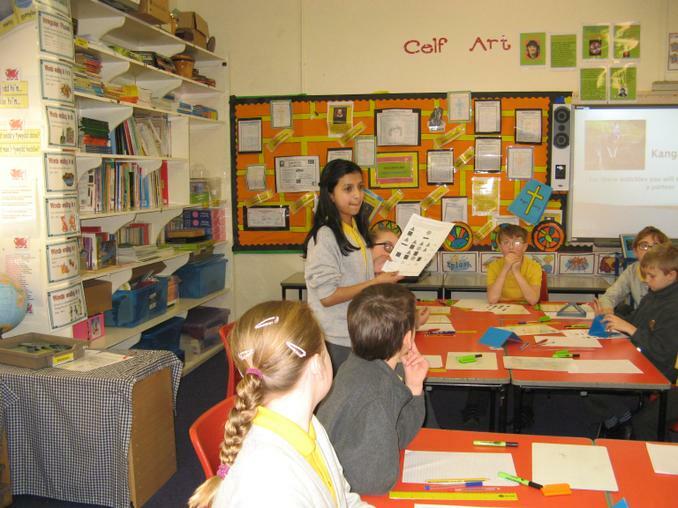 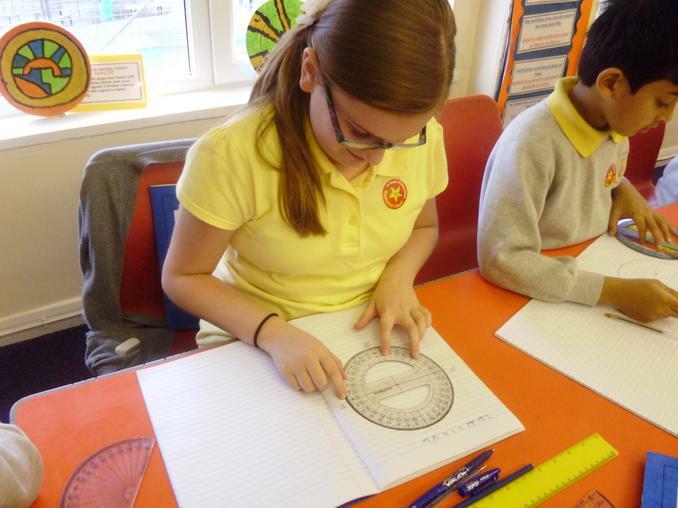 Year Five - Reasoning Paper - the easter holidays the children in year five will undertake a series of three assessments in mathematics. 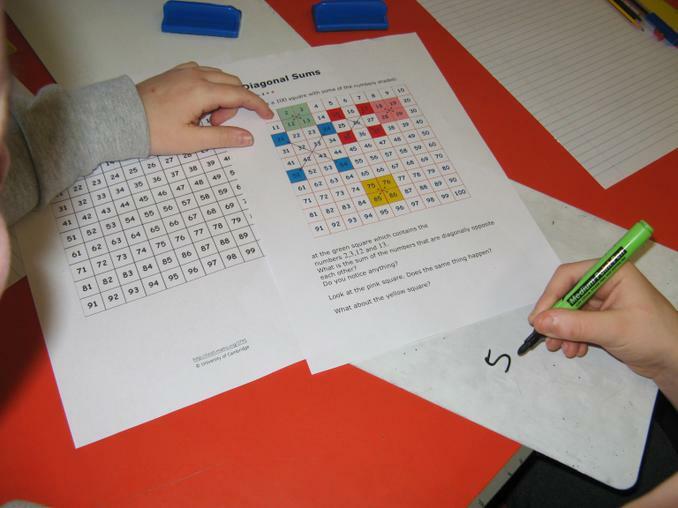 The first of these is the WAG reasoning paper which carries a total of thirty marks. 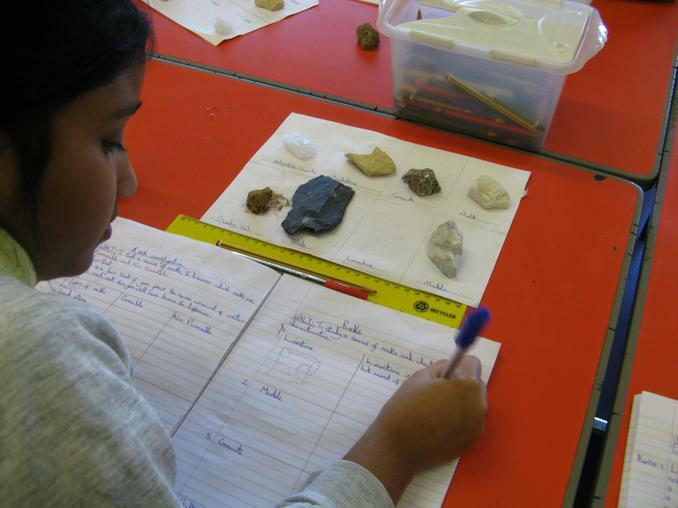 It is very important that the children show their workings out as if they get the answer wrong they can still receive marks for their workings. 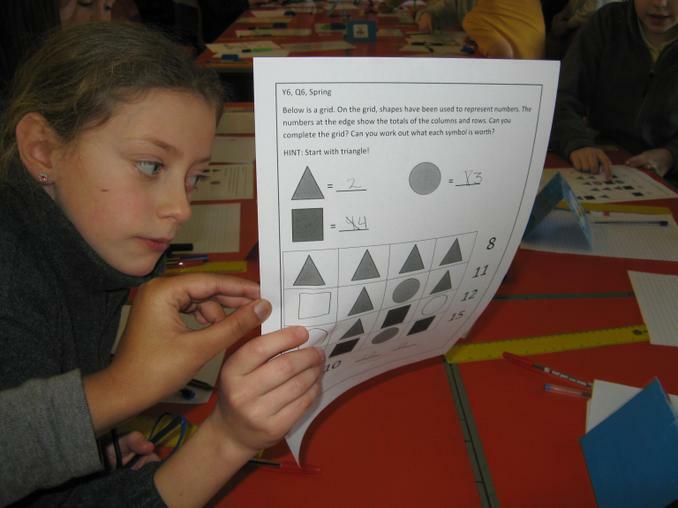 WAG have produced a series of materials to support children and teachers in answering these reasoning papers and the children have engaged in Kangaroo maths, badger maths and the WAG assessment materials this past term as a tool for developing their understanding of how to approach a reasoning question. 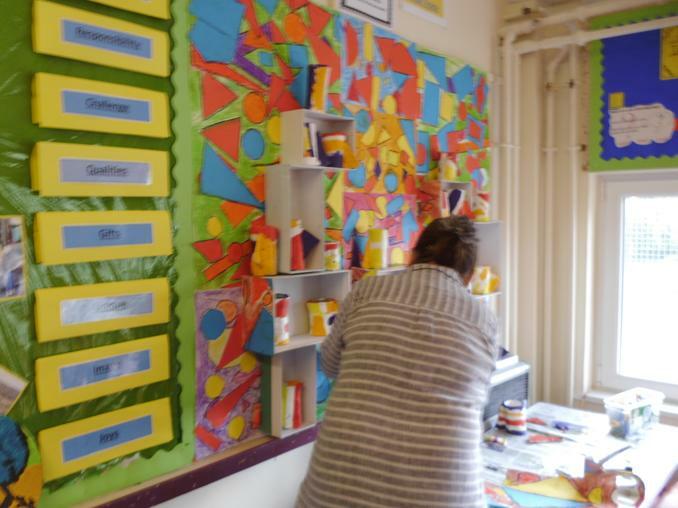 I have attached copies of the exmples produced by WAG as I know that parents are eager to support their children in their learning. 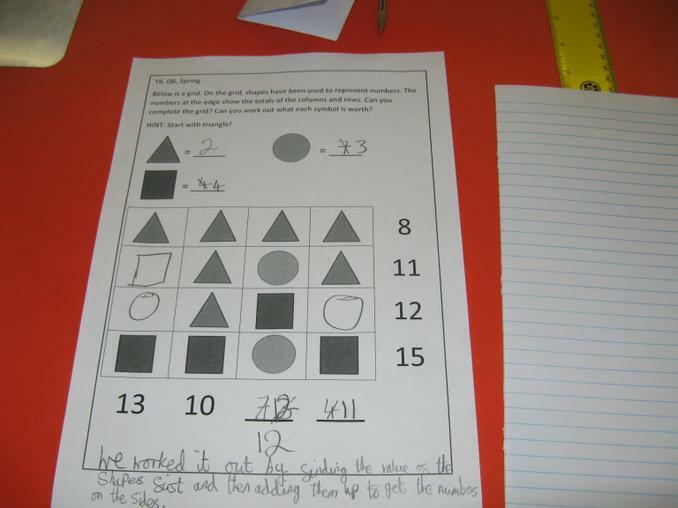 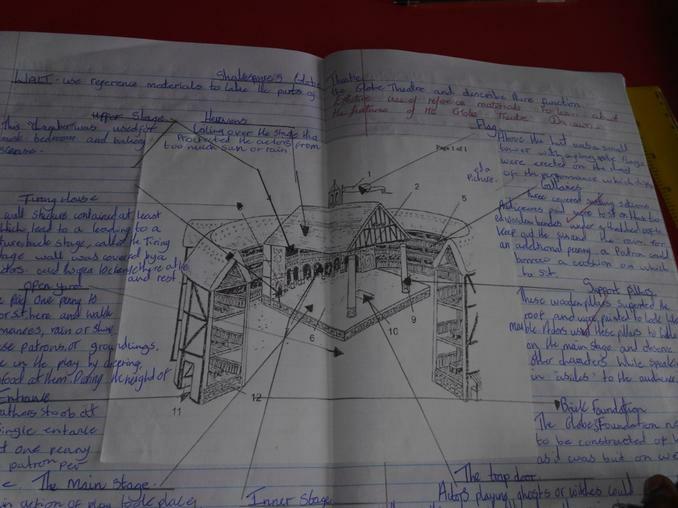 Year Six - WAG reasoning papers. 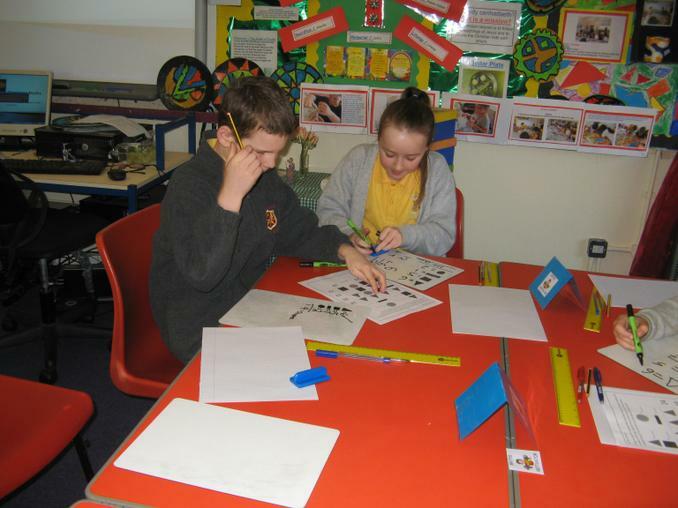 The WAG assessments for year six pupils will determine where the children are placed in Corpus Christi. 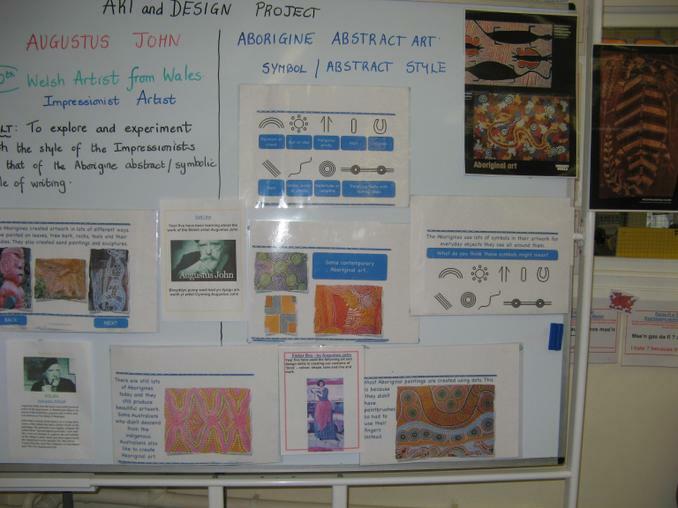 I have attached all the examples that WAG have produced. 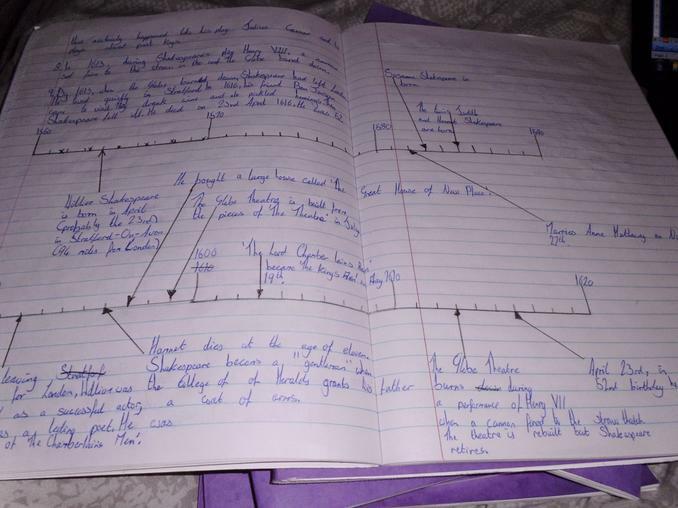 This shoould form part of the easter revision homework. 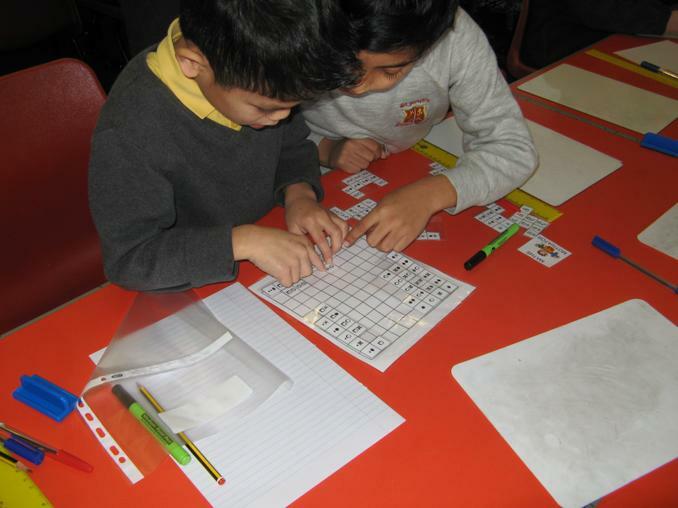 However, the children are working collaboratively in groups on these WAG reasoning asssessments in school. 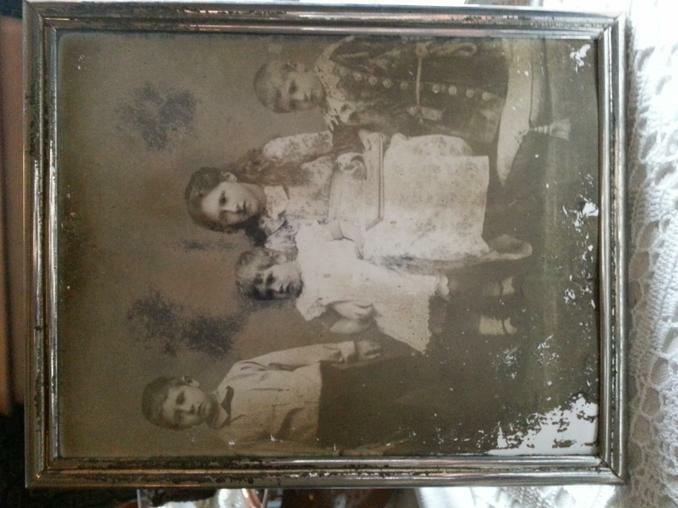 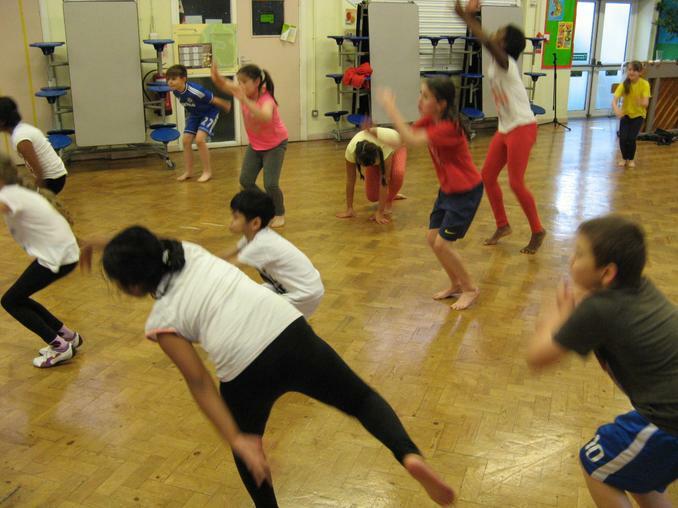 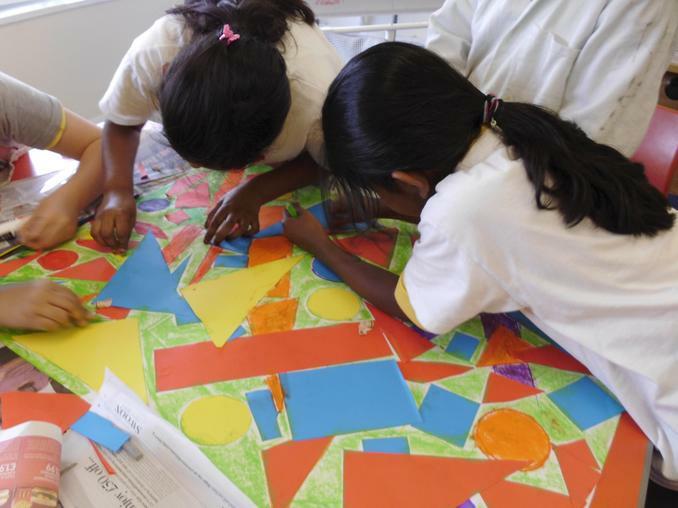 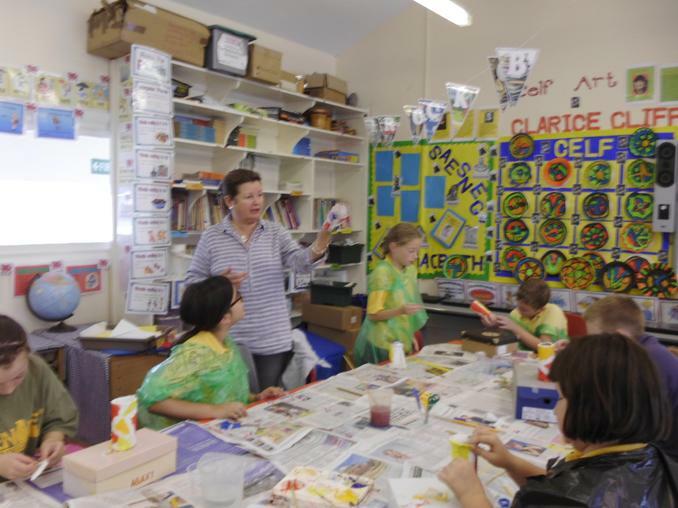 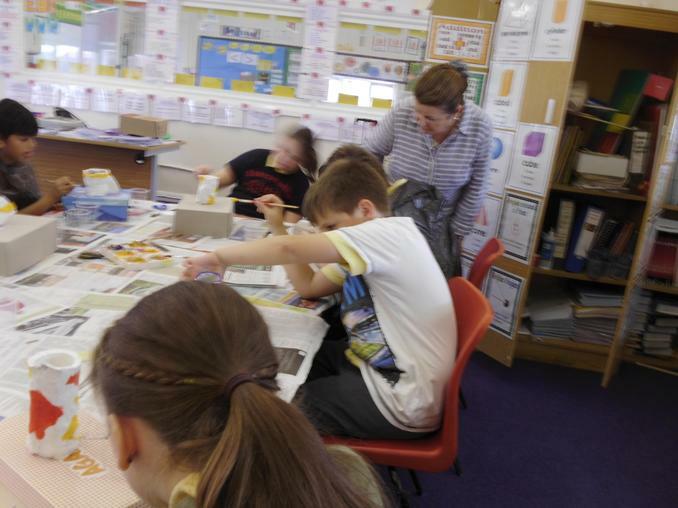 I have placed them on the website as i am concious that parents are eager to support their children in their learning. 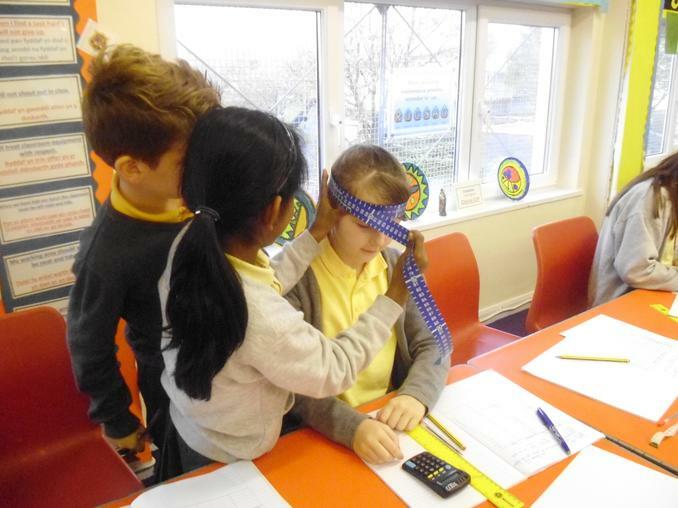 Year Six Problem Solving - To be returmed the Monday after half term. 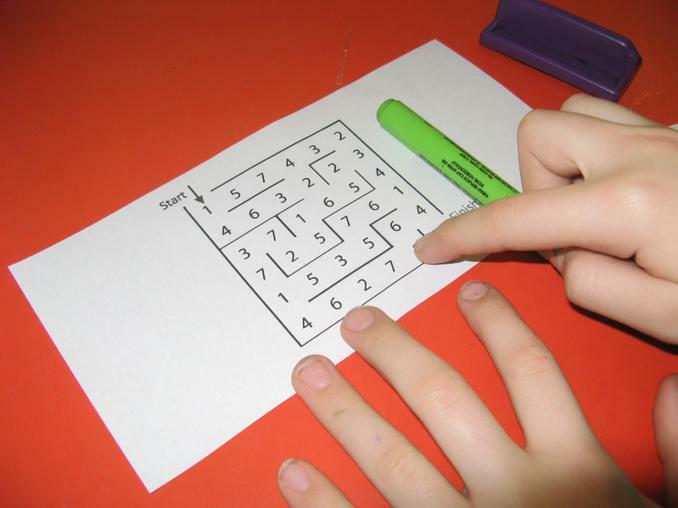 There are a number of problem solving tasks the chiildren will be doing in school next week. 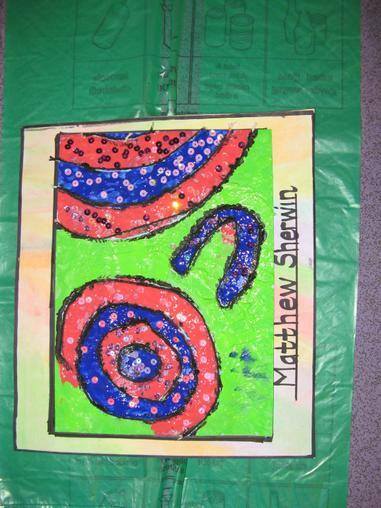 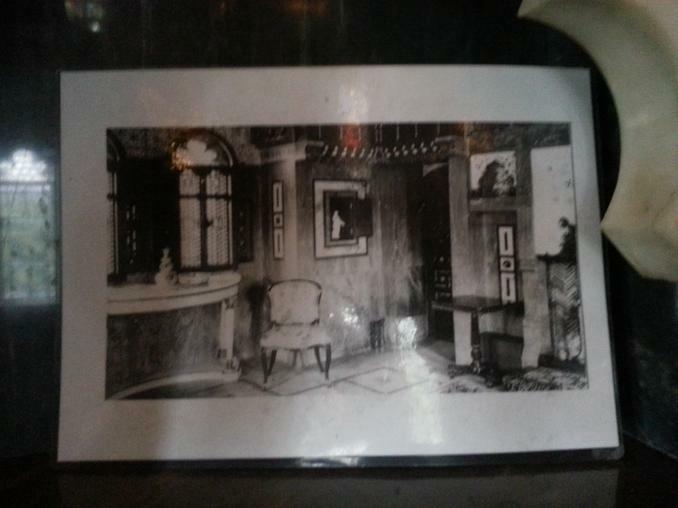 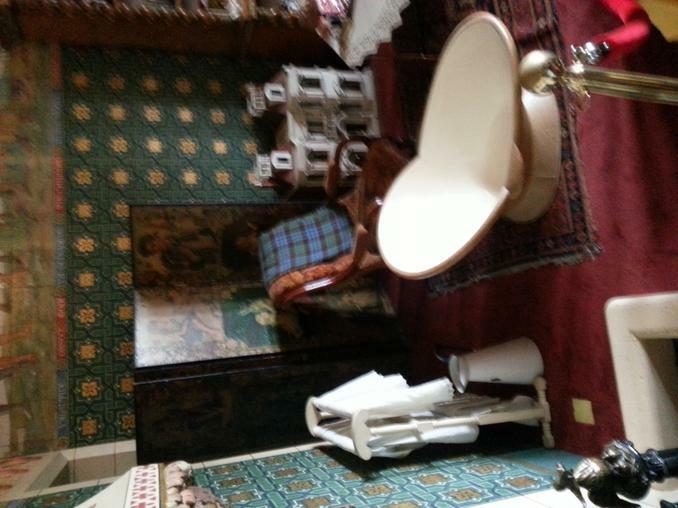 The first of these is now attached. 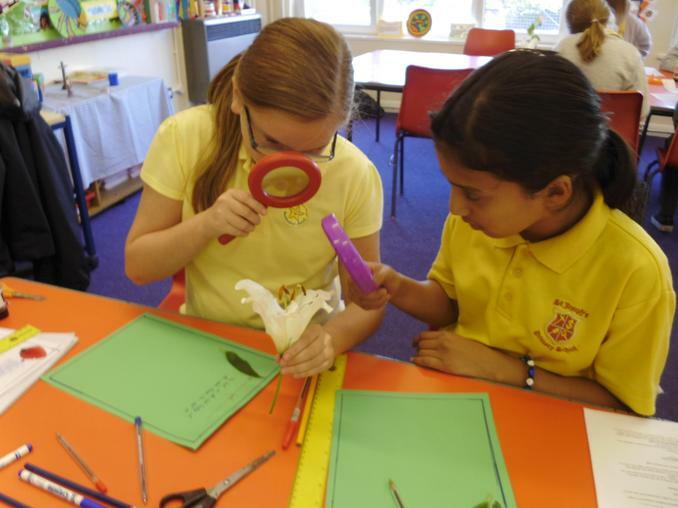 We will be doing these investigations in school in the forthcoming week before half term so that the children can work together to solve the problems and puzzles. 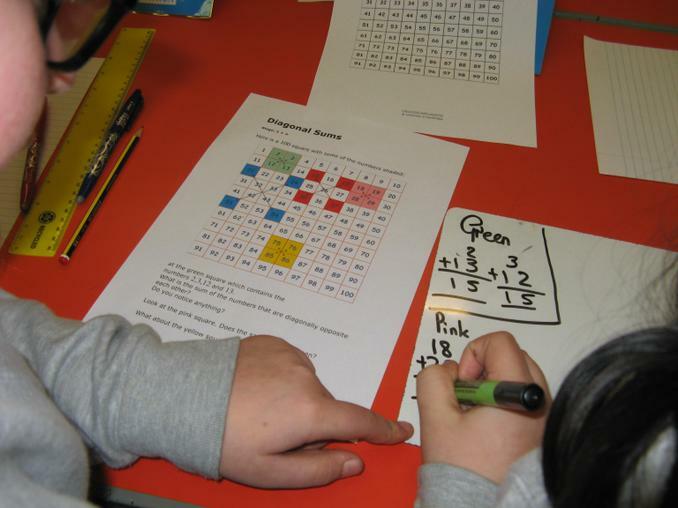 The work included is all new problem solving materials published by WAG in the last few weeks YEAR SIX only. 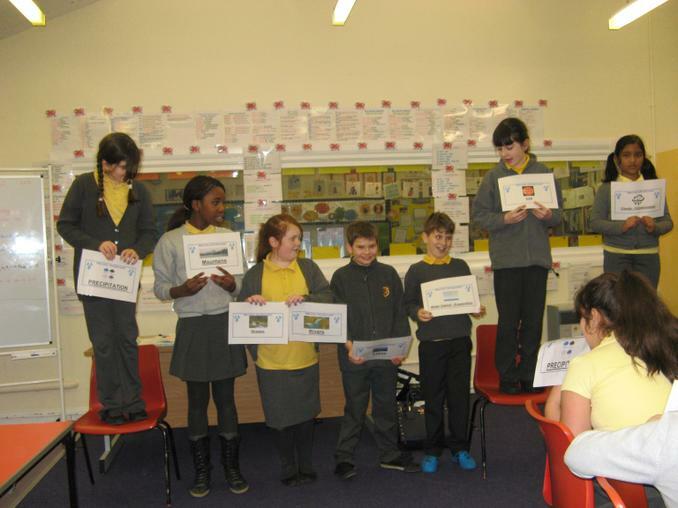 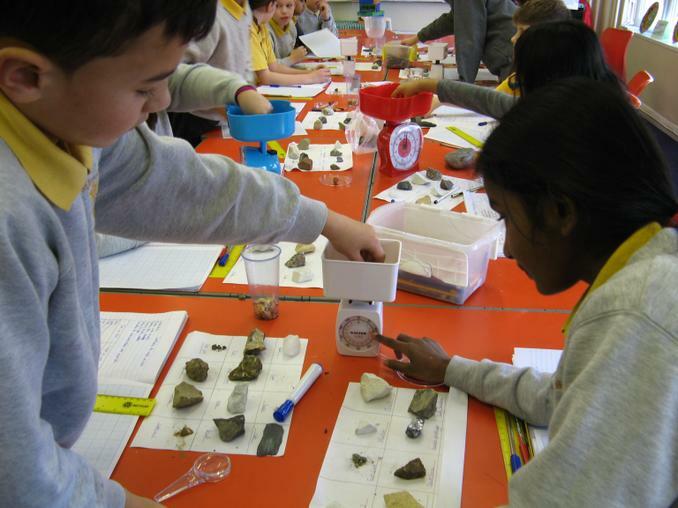 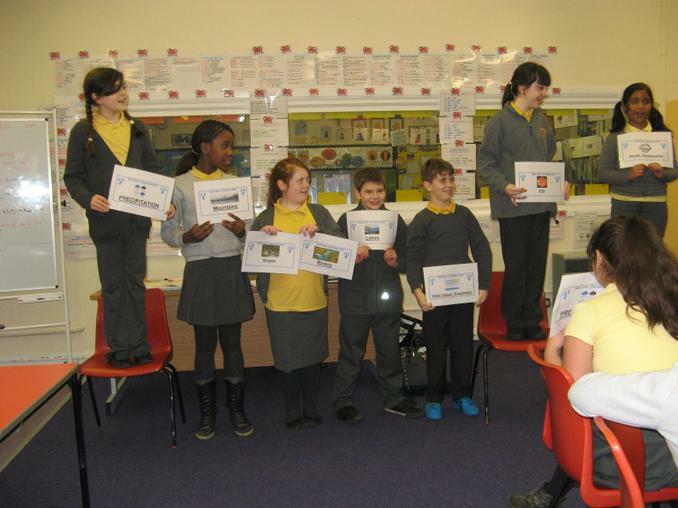 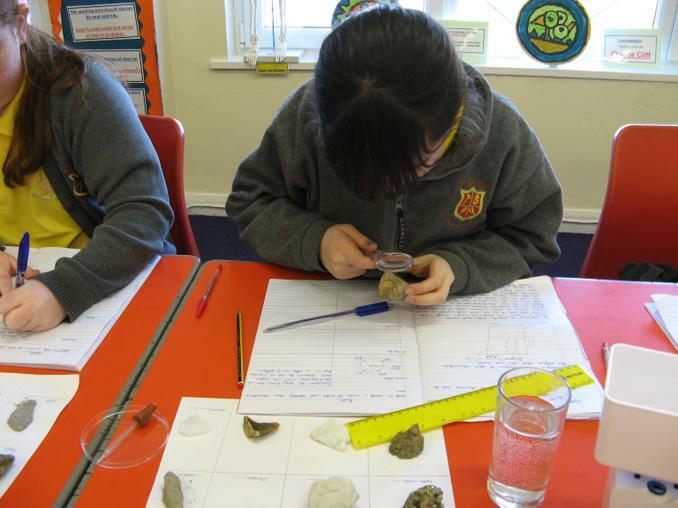 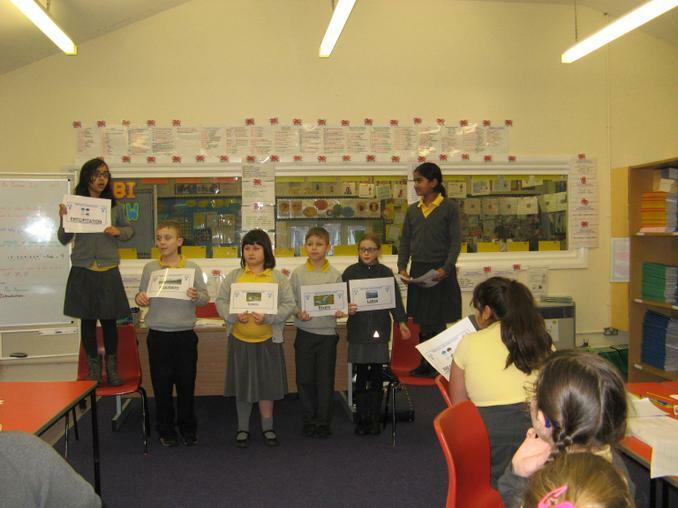 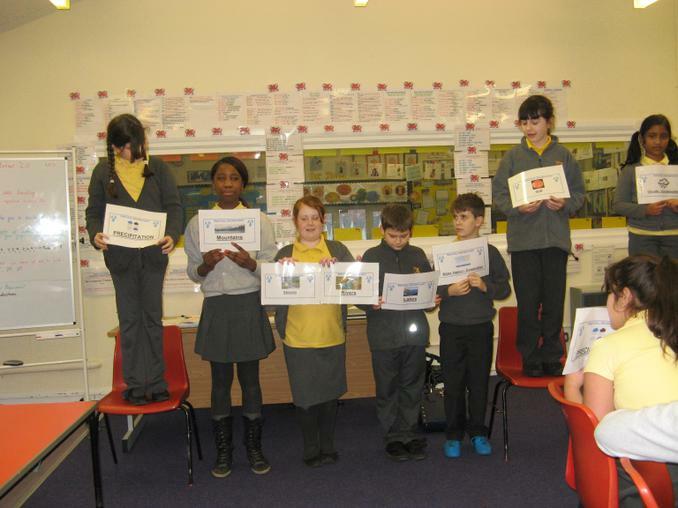 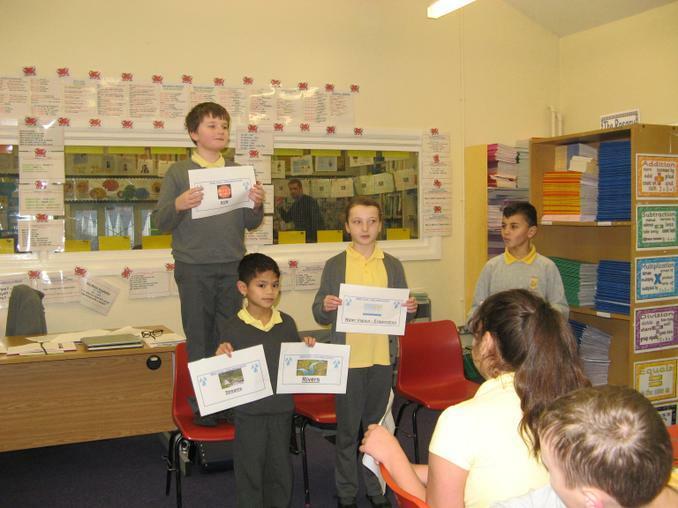 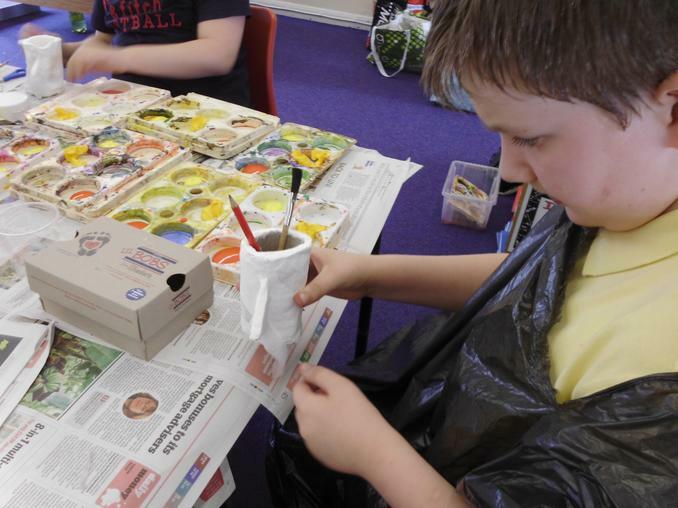 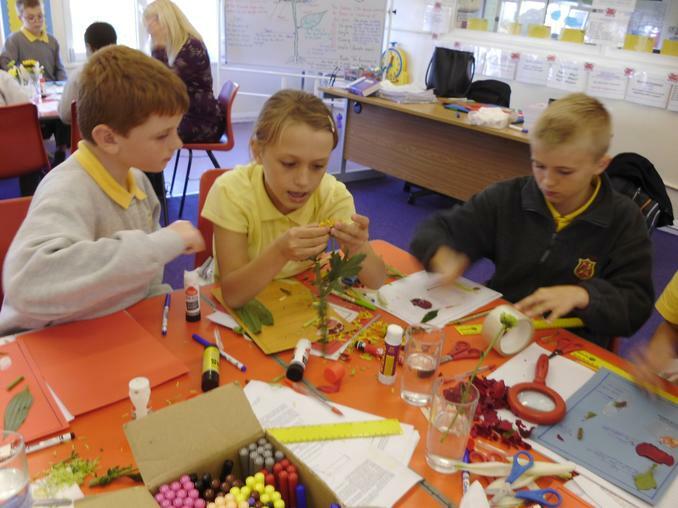 Year five went the 'Evolution of Wales' to compliment Science investigations we have conducted on rocks in class. 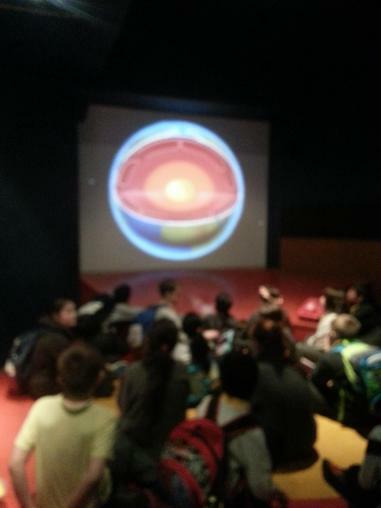 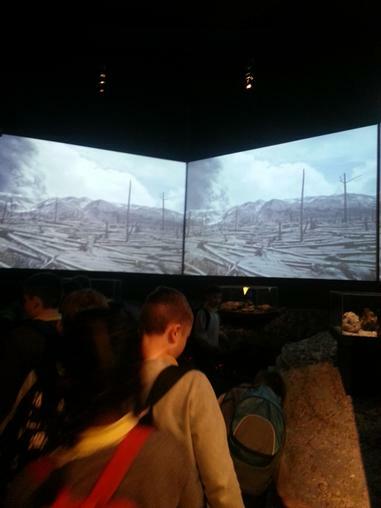 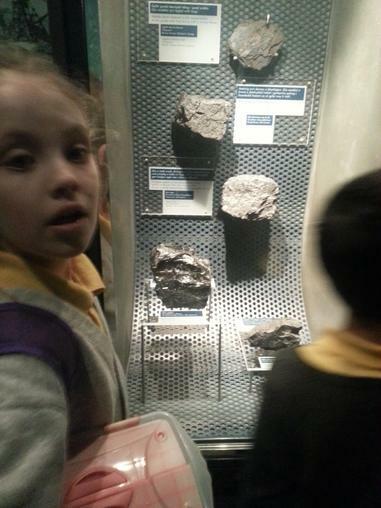 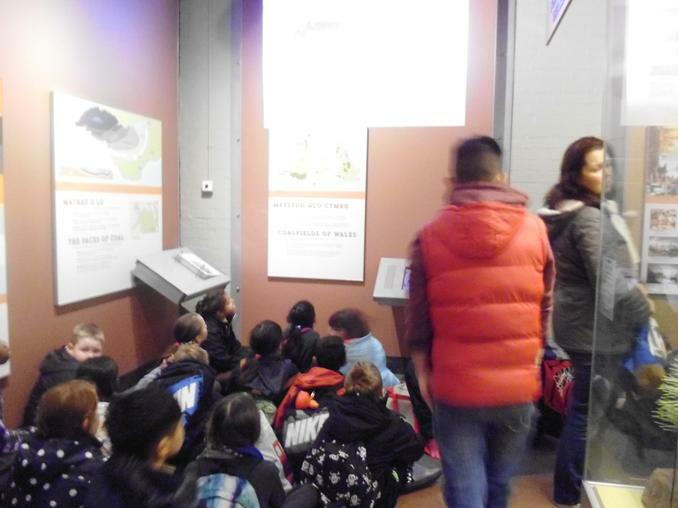 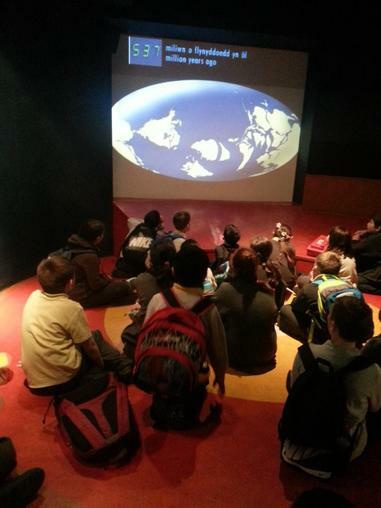 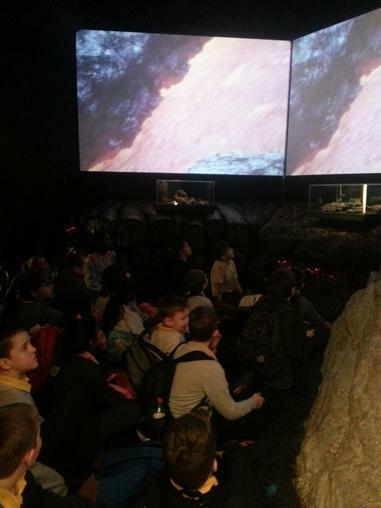 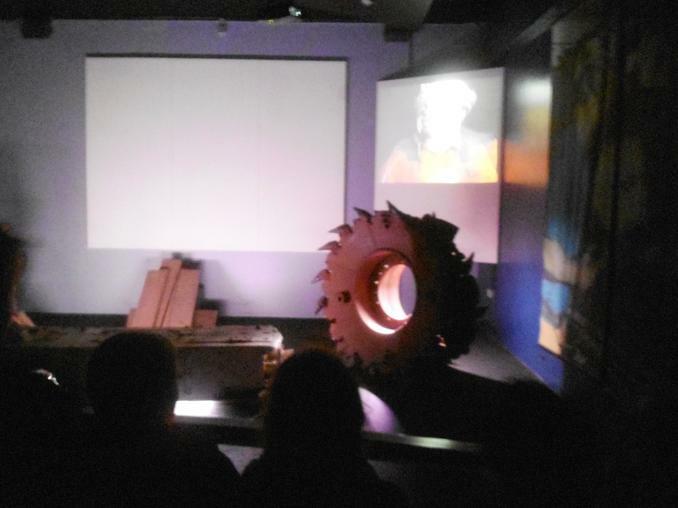 The children watched videos to learn how the landscape has been shaped by volcanic erruptions and extreme cold over the last 600 million years that have led to the physical features of mountains, lakes valleys and fossil fuel deposits such as coal that we have in Wales. 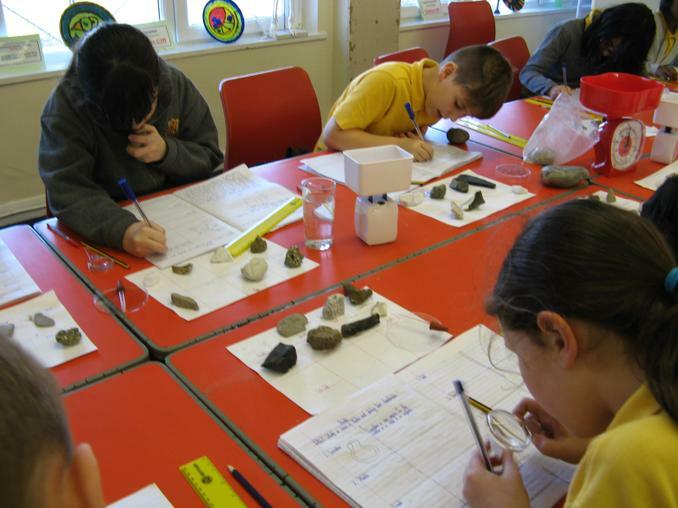 We learnt about the rocks and animals that once lived in Wales. 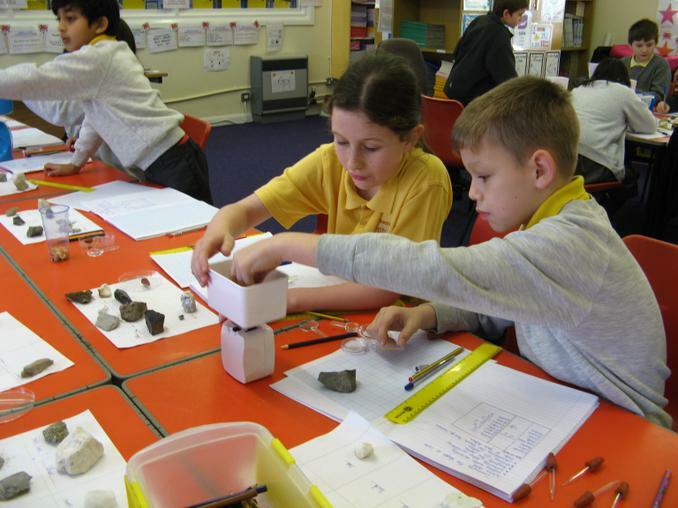 from this visit we have written a summary of our scientific learning and have conducted a mini project to learn how volacnoes are formed and their different features. 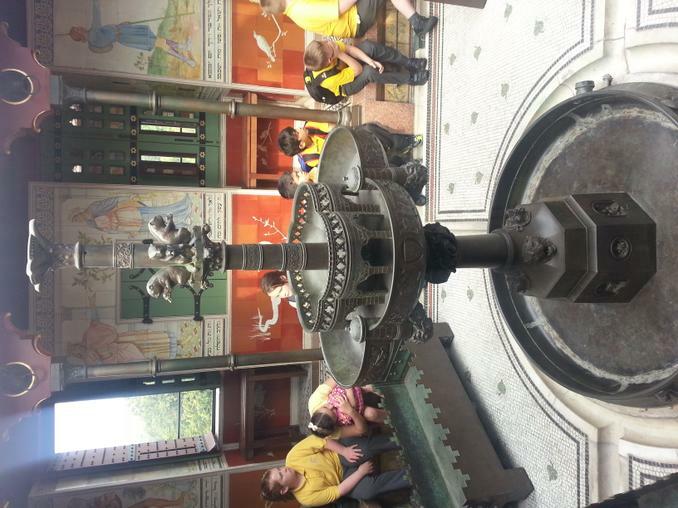 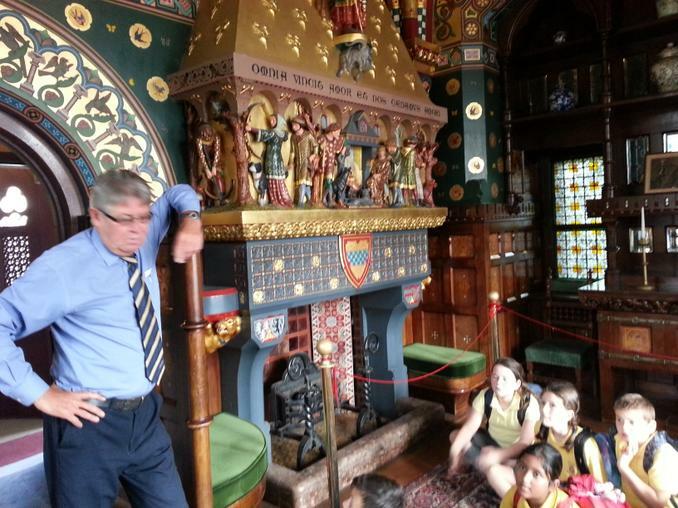 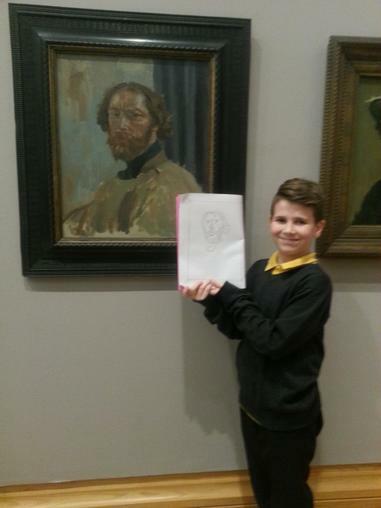 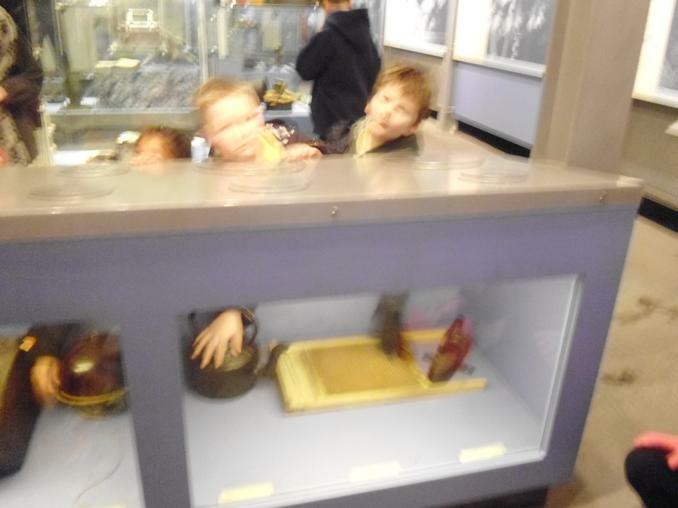 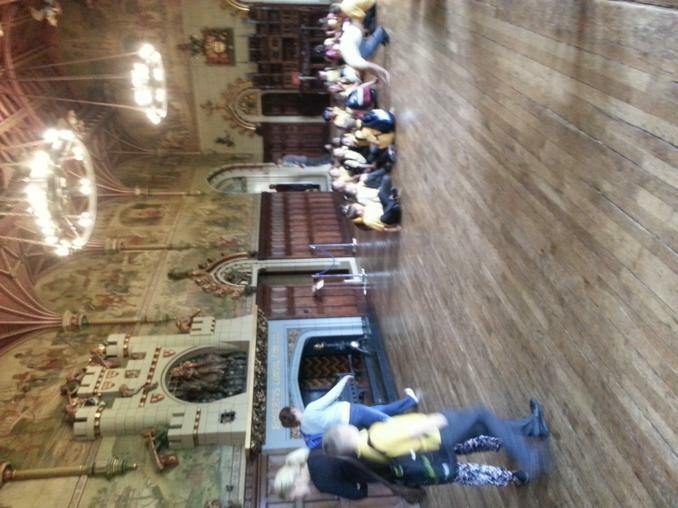 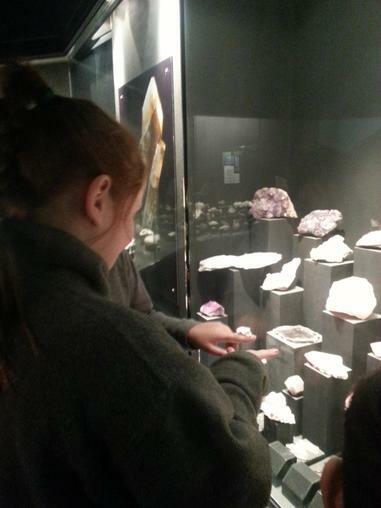 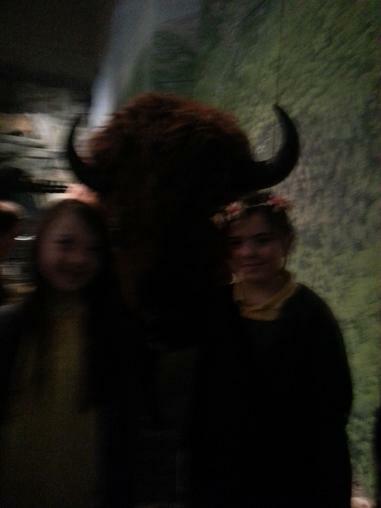 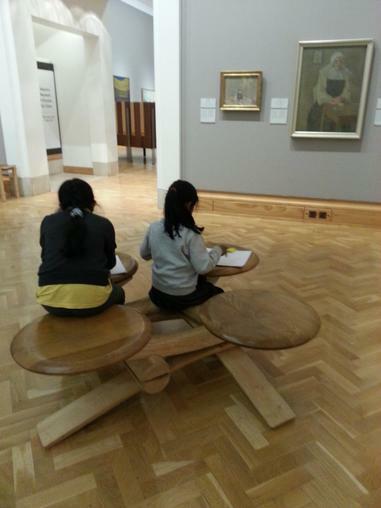 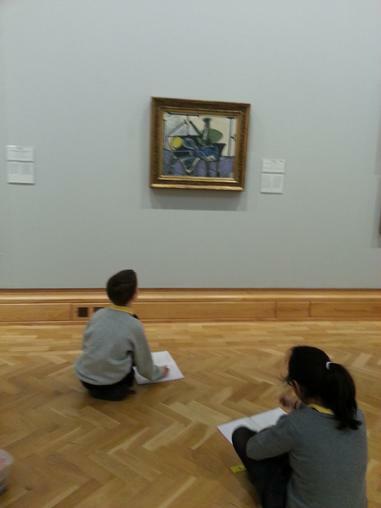 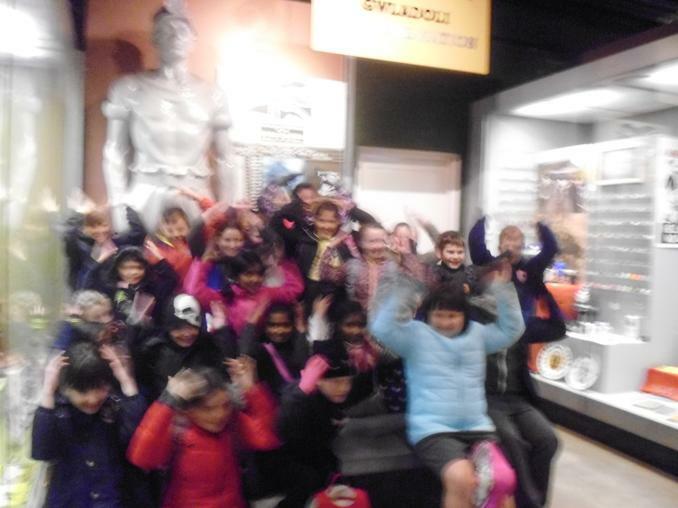 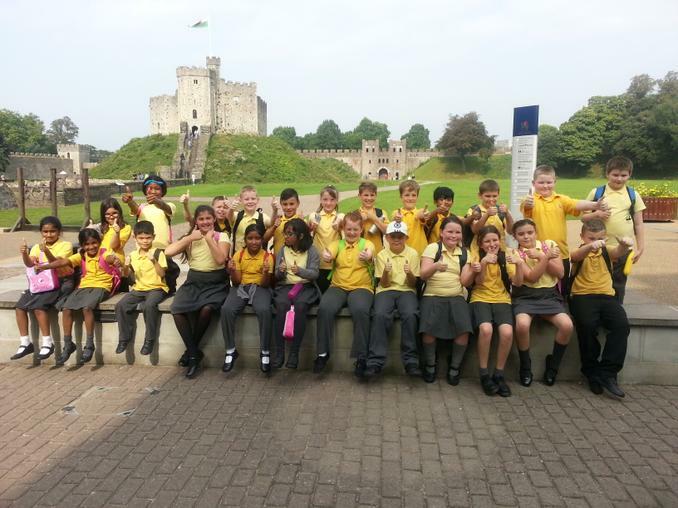 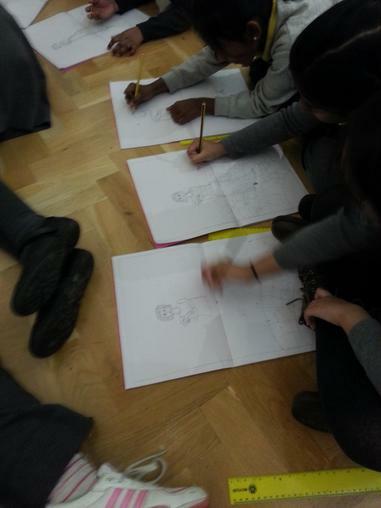 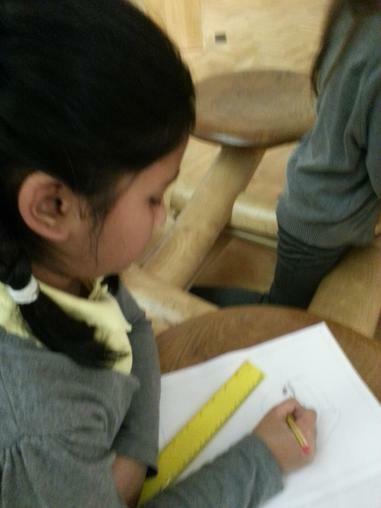 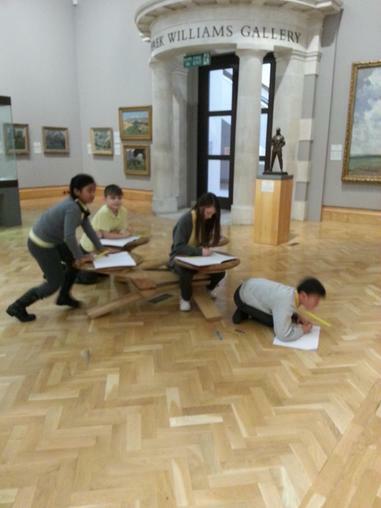 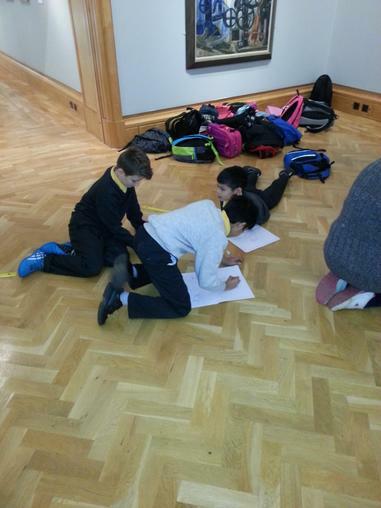 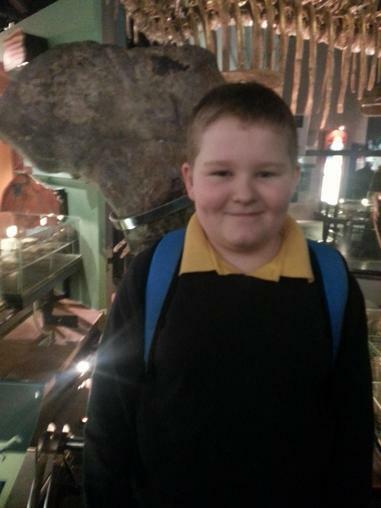 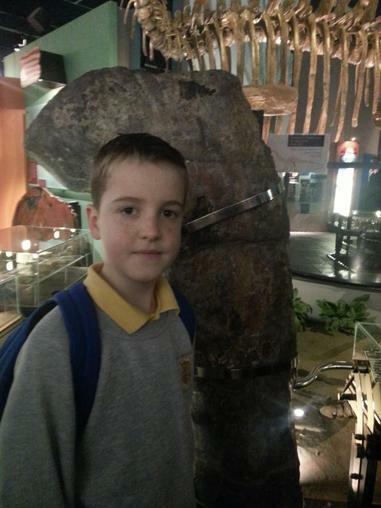 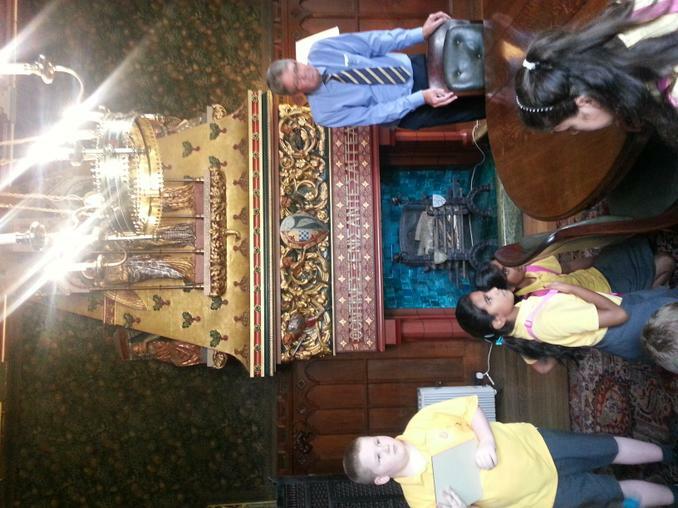 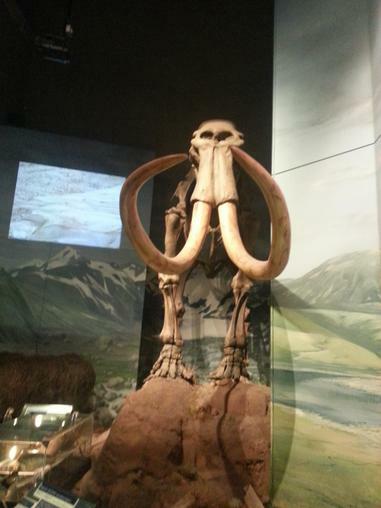 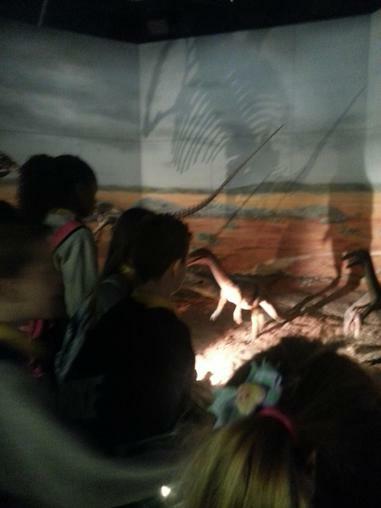 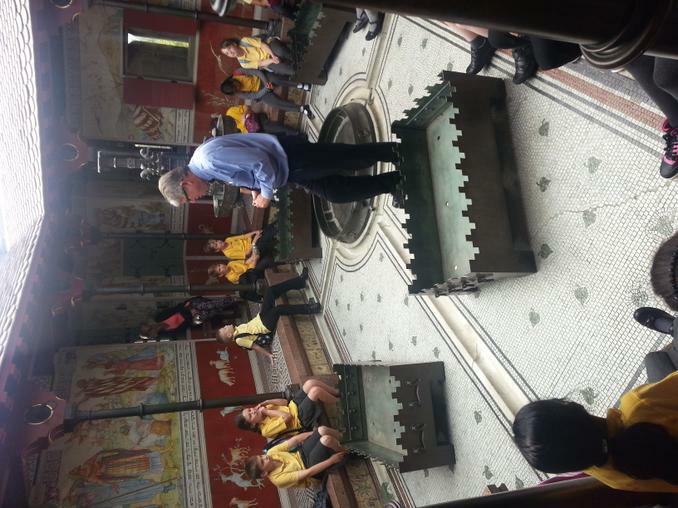 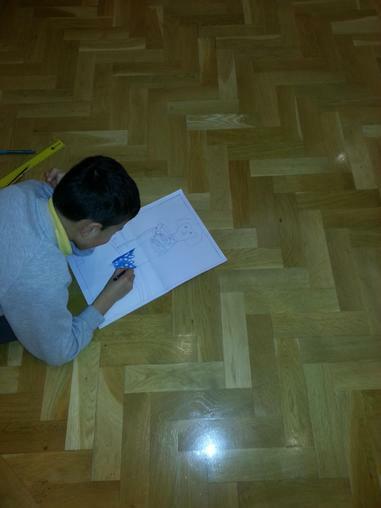 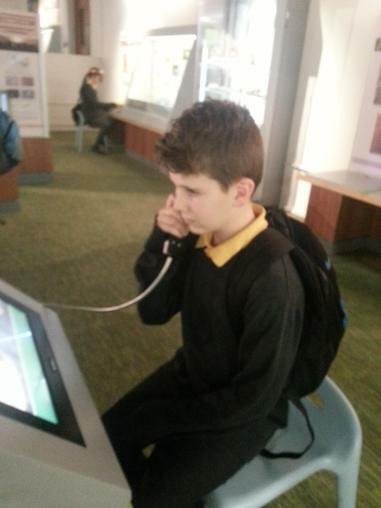 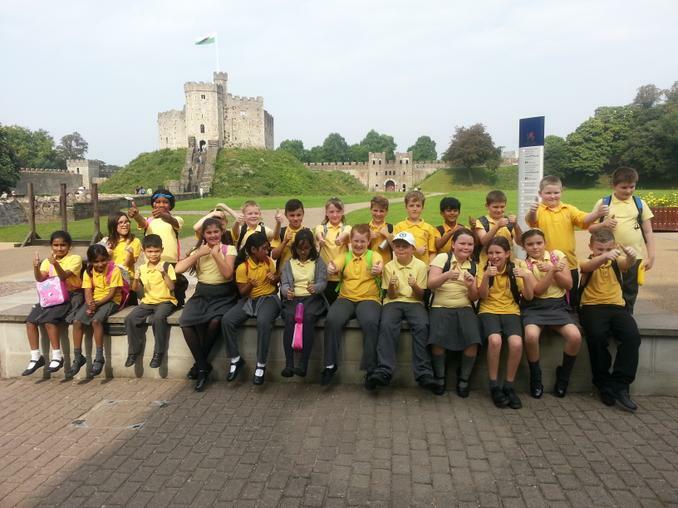 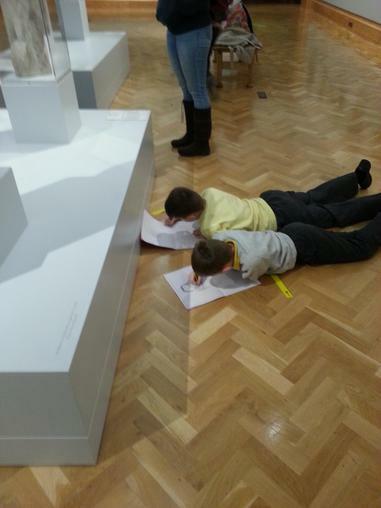 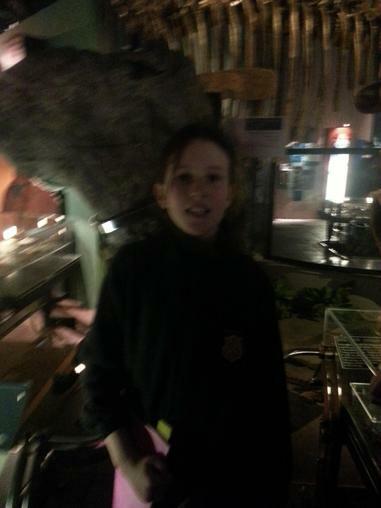 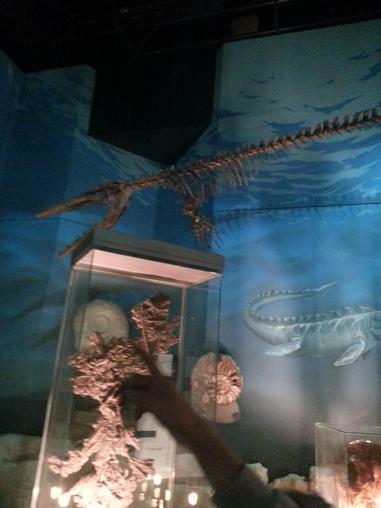 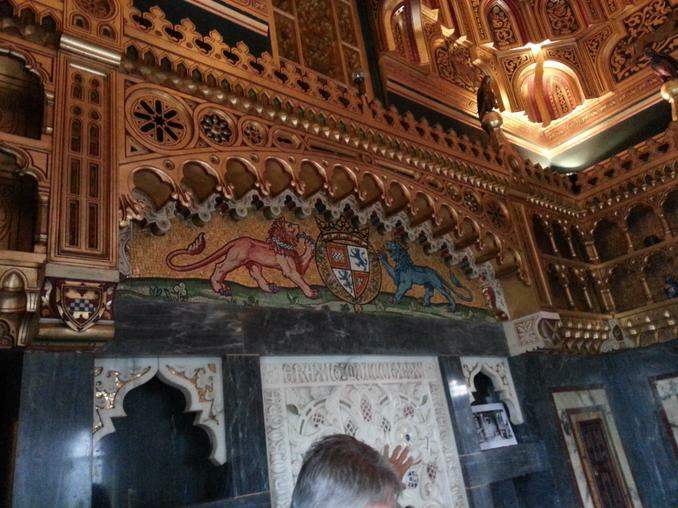 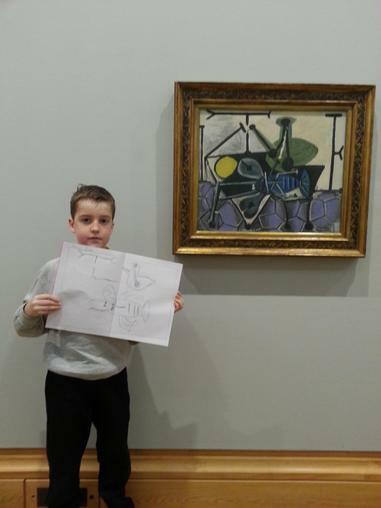 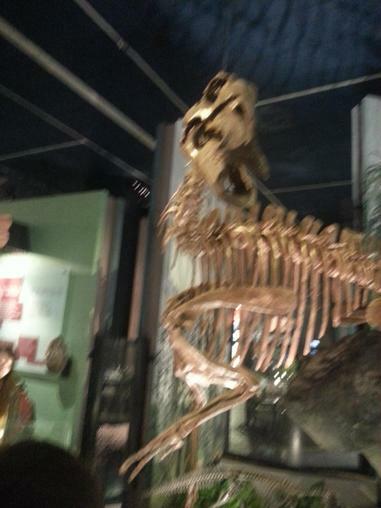 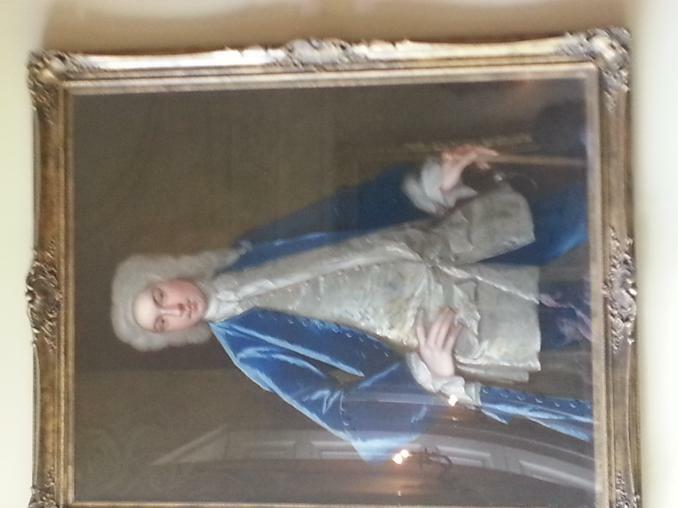 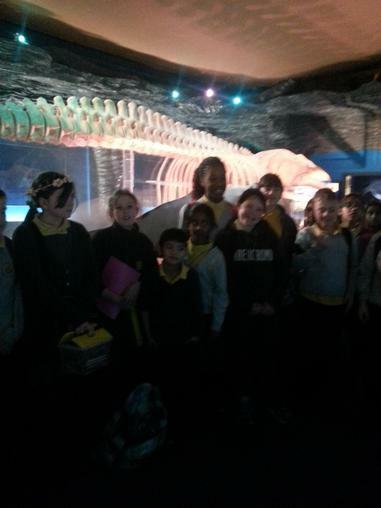 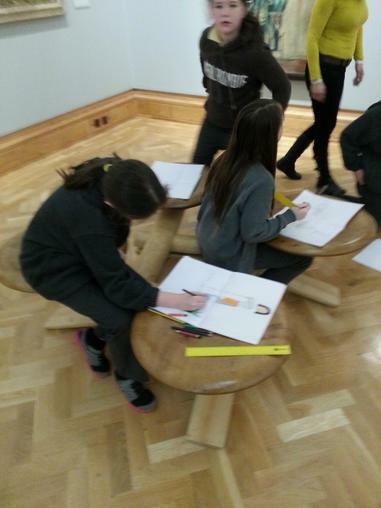 Year Five went to the National Museum of Wales to develop our line and mark skills. 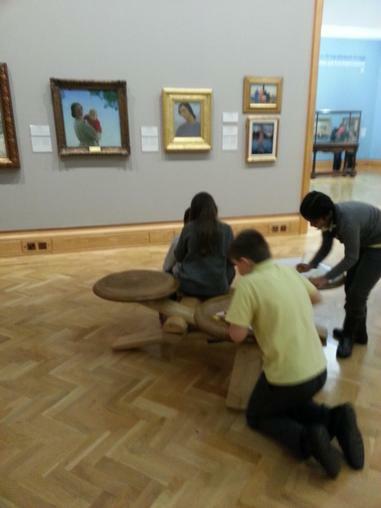 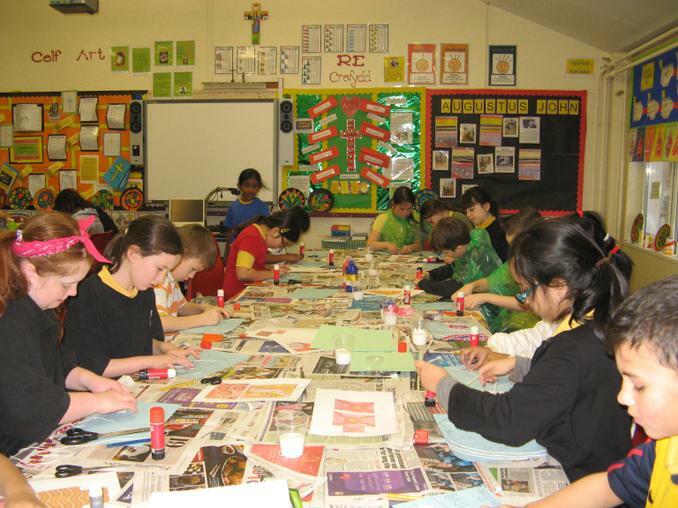 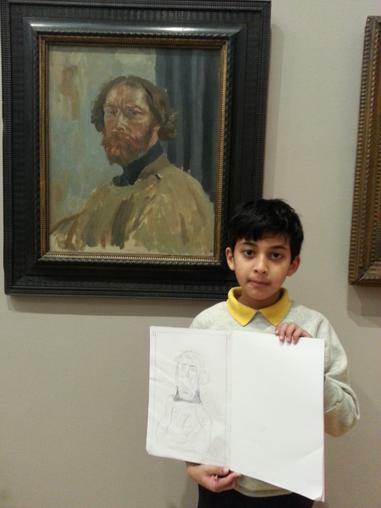 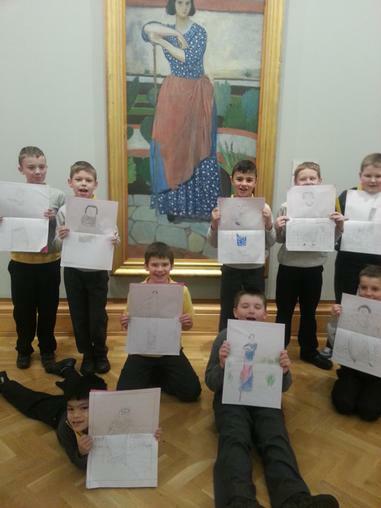 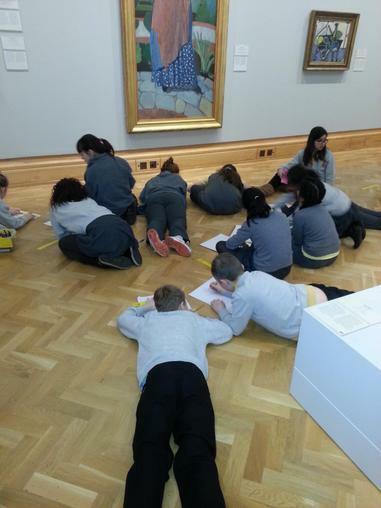 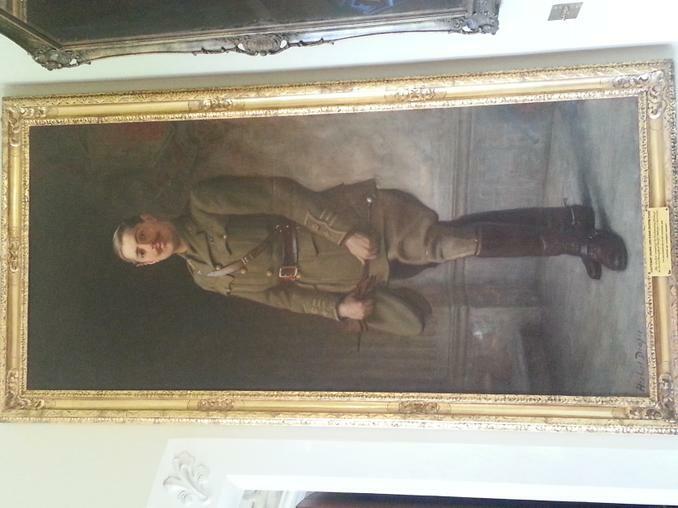 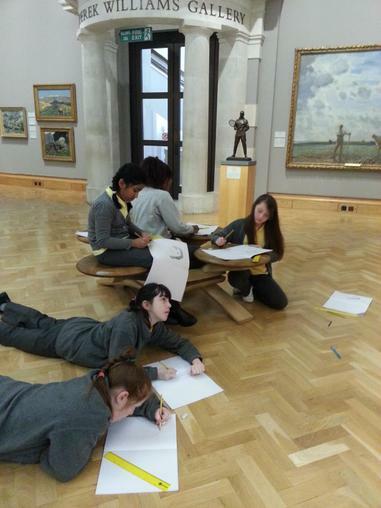 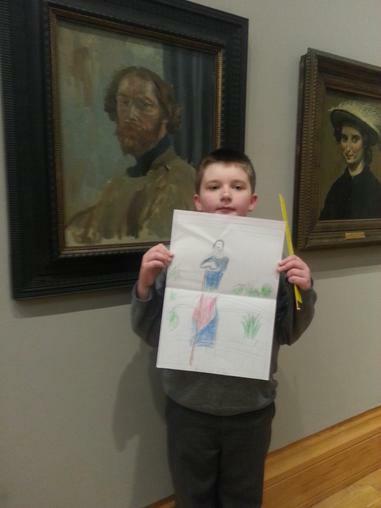 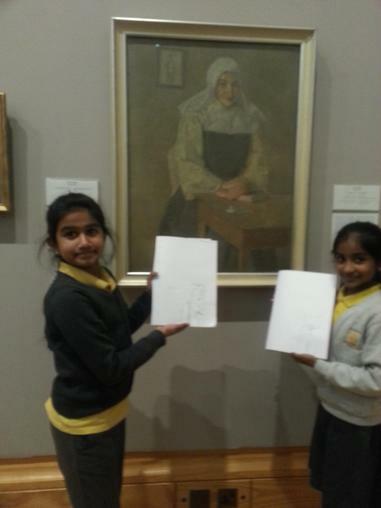 We worked in the Impressionist gallery and focused on the work of the Welsh artist Augustus John. 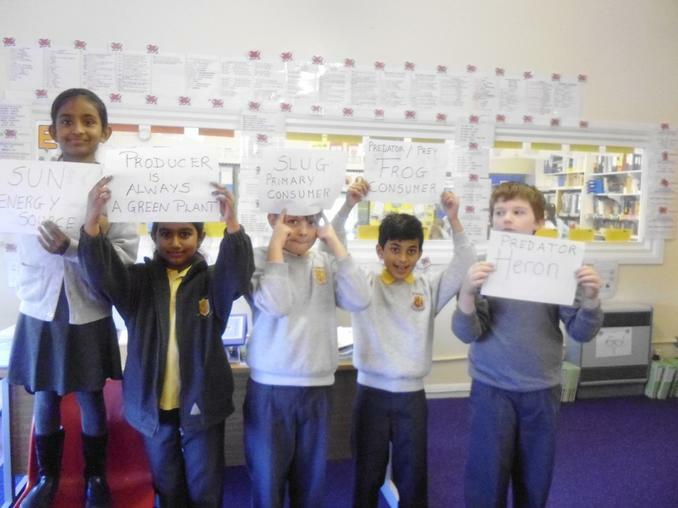 Context for Learning / Science - Using IT and our Independent Research Skills to Learn About Global Warming. 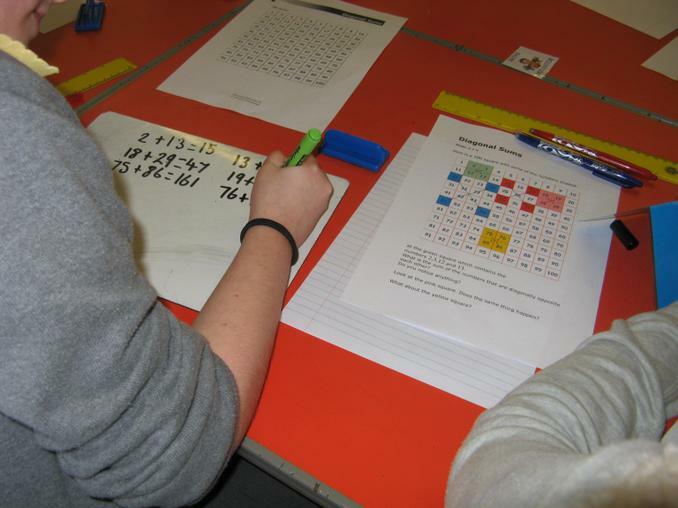 Parental information on how to approach data handling questions. 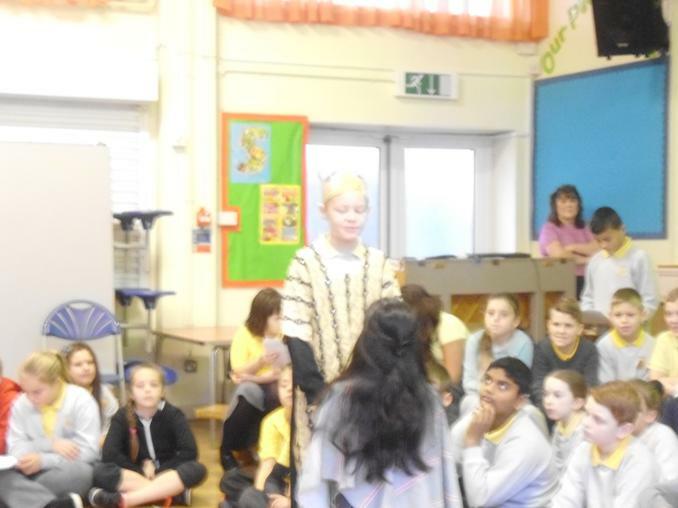 - Golden Rules! 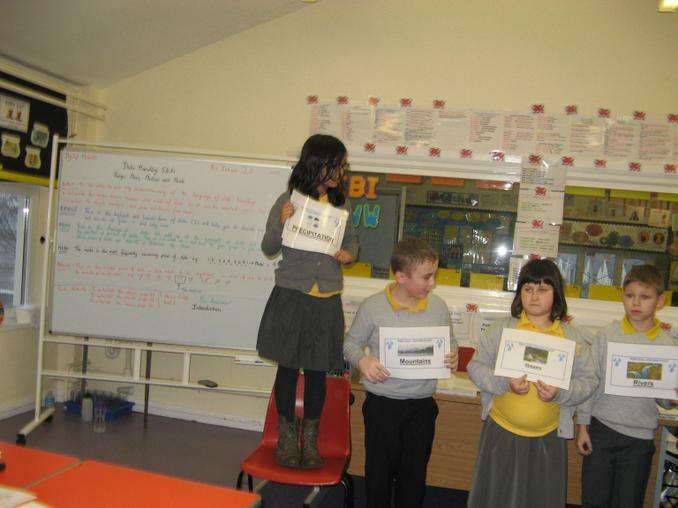 Year Five Bug Club - Information for parents. 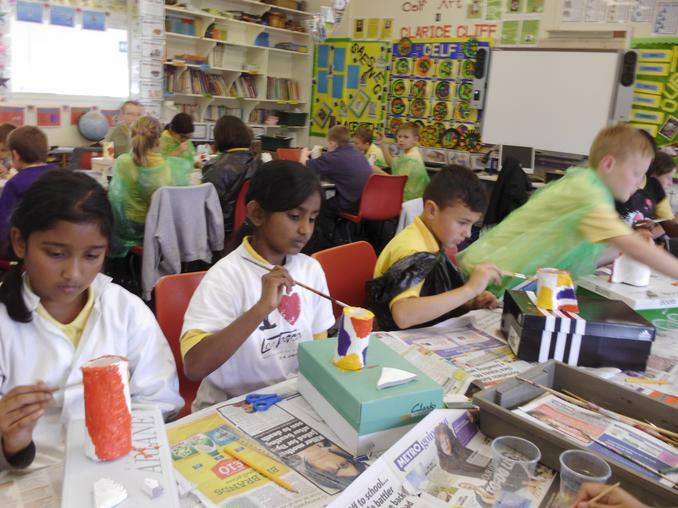 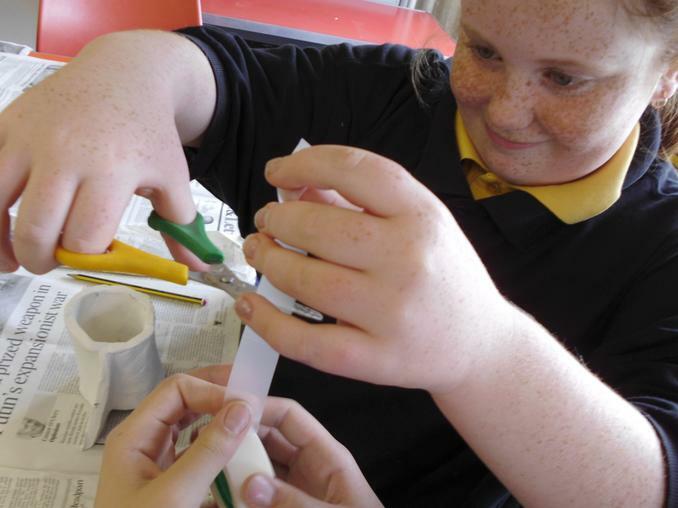 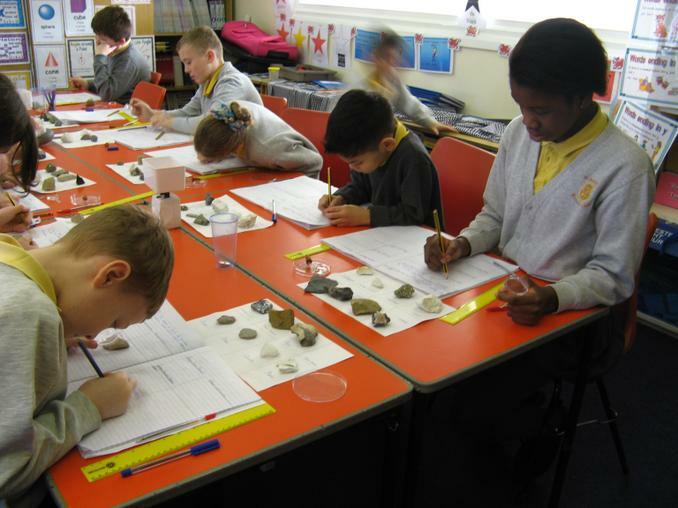 Science Investigations on Rocks: Year five have now commenced their Science topic on Materials and their Properties. 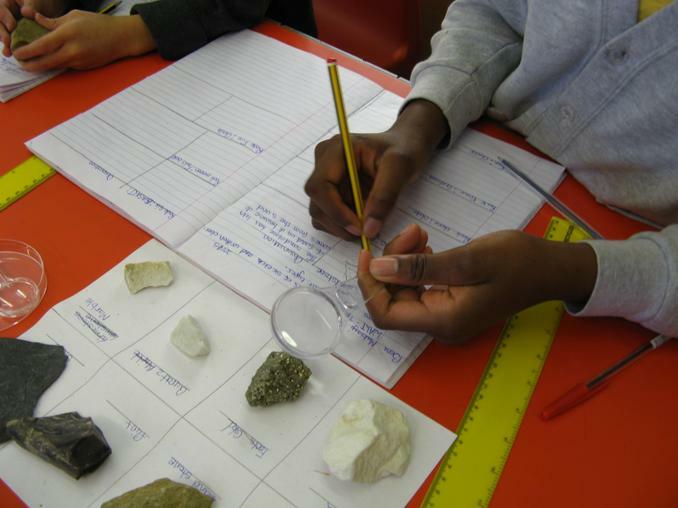 The children have used their observation skills to draw and describe a variety of rocks, they have investigated whether their rock samples are permeable or non permeable, durable, whether they float or sink and have used their data handling skills to gather independent data about the wight of their rock samples and have plotted the data and analysed it. 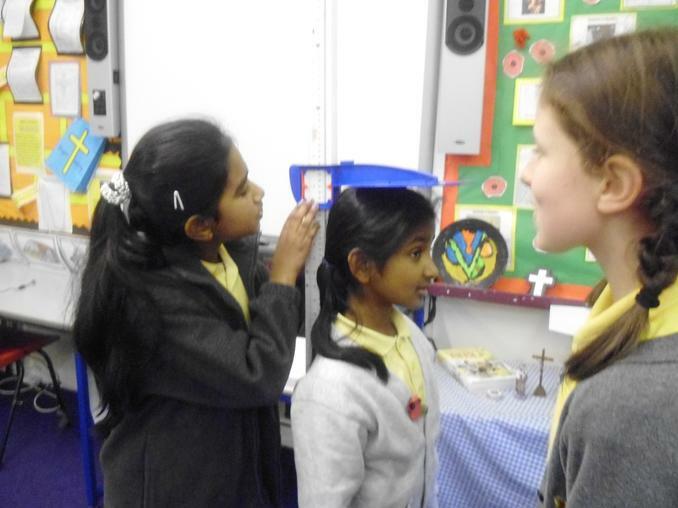 Year Five Class Mass 22nd January: All parents and family members are warmly invited to attend year five's class mass which will take place at 10.00am in Mrs Houston's classroom. 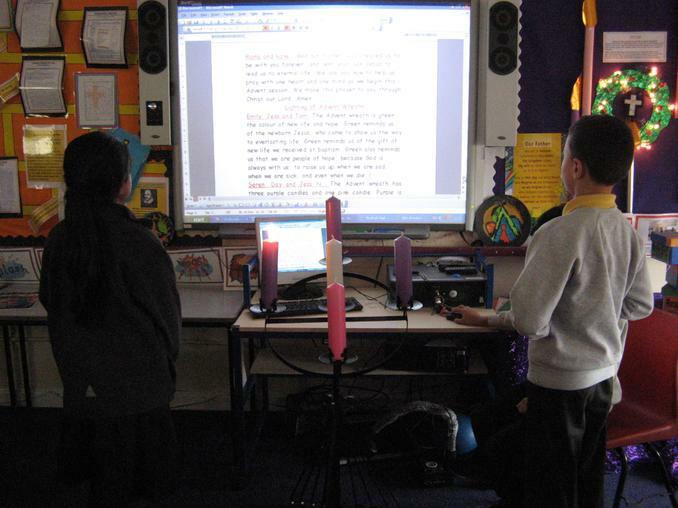 Could parents ensure that their child is familiar with their reading well in advance of the Mass please. 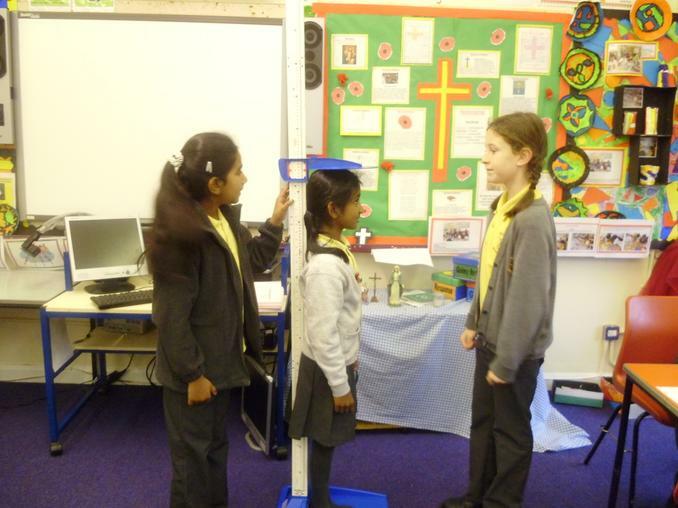 Science Week Assembly 20th March: The children will have a lot to learn for this assembly and parts need to be known off by heart. 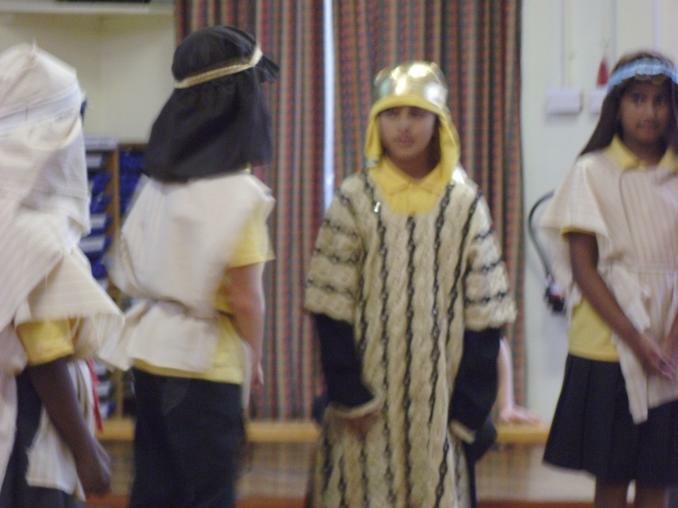 In the final two pages of this document some children will be required to have a costume and by putting this assembly up in plenty of time it is hoped that the parents of the children concerned can organise this. 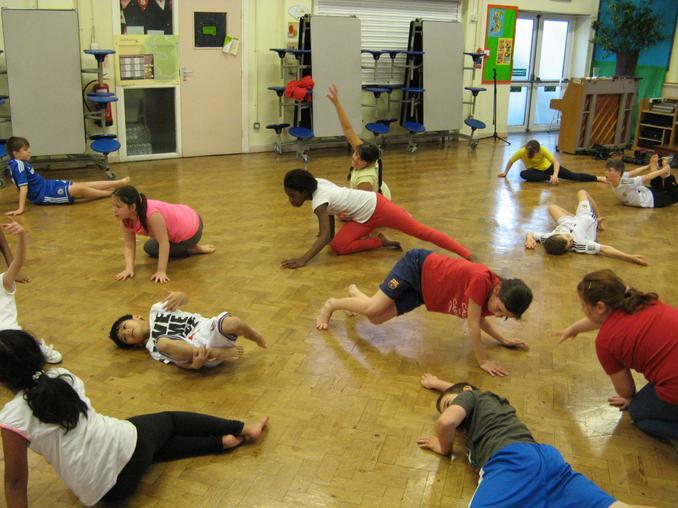 Thank you, Ms Houston. 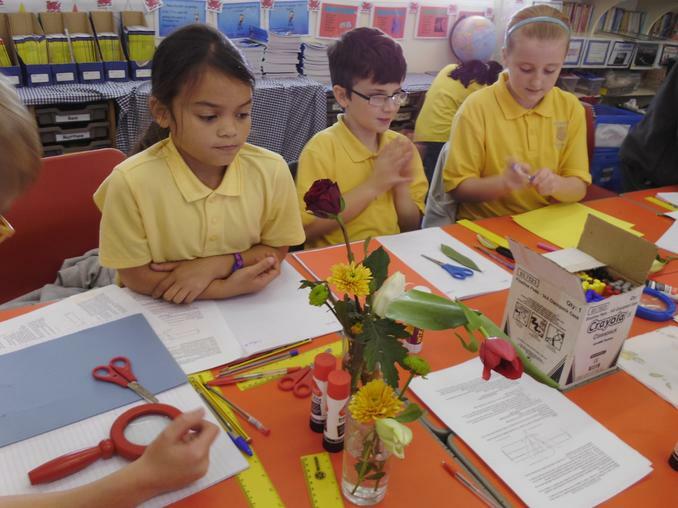 Year Five's final topic in RE this Autumn Term is centred on the theme of 'Hope'. 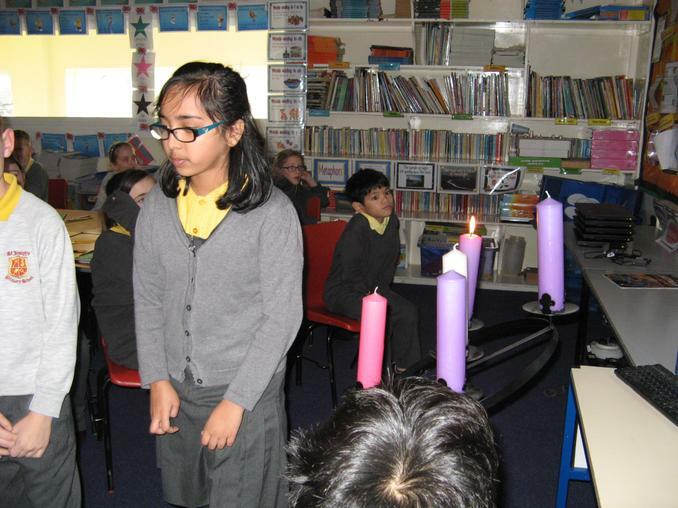 The first learning focus in the topic is to learn about Advent being a time of waiting and preparing for the birth of our Saviour at Christmas. 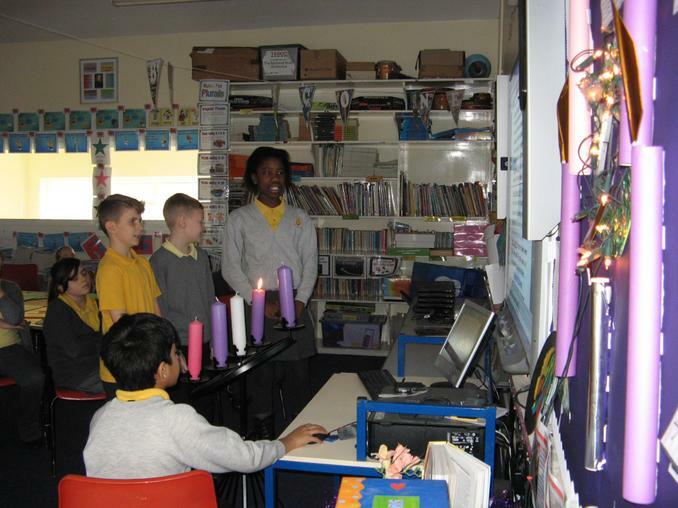 To this end the children participated in a class act of worship. 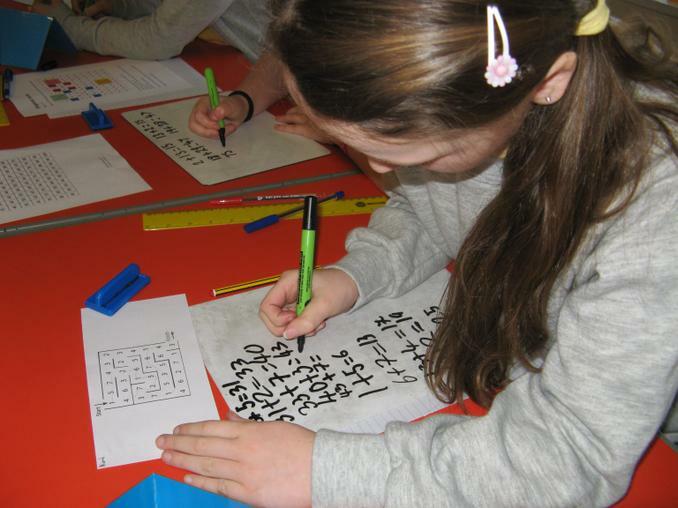 Year Five Homework: WAG Numeracy assessment for year five. 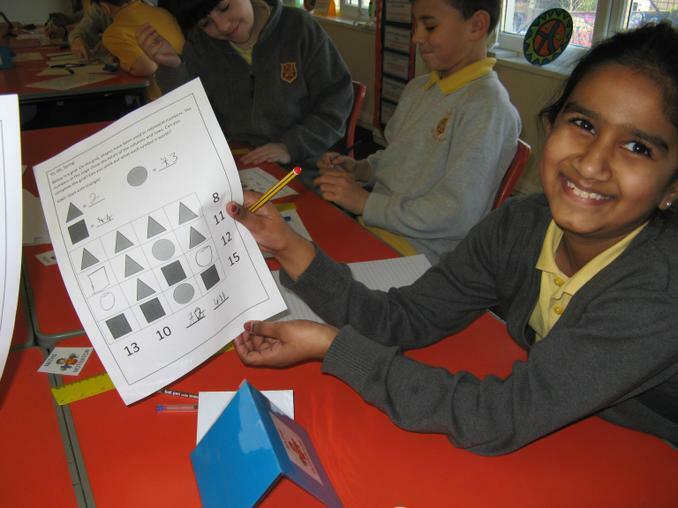 All aspects of the maths topics included in this paper have been covered this term. 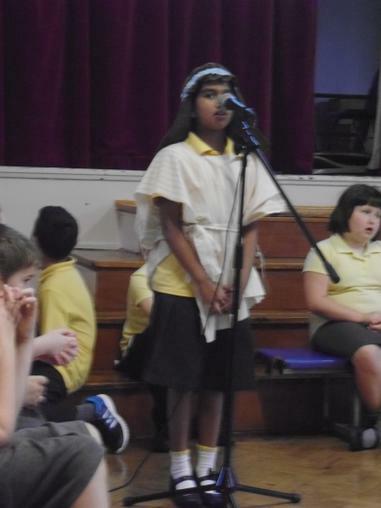 Riona: My Advent promise is to not want things other people have and to not begin arguments when there is no reason to. 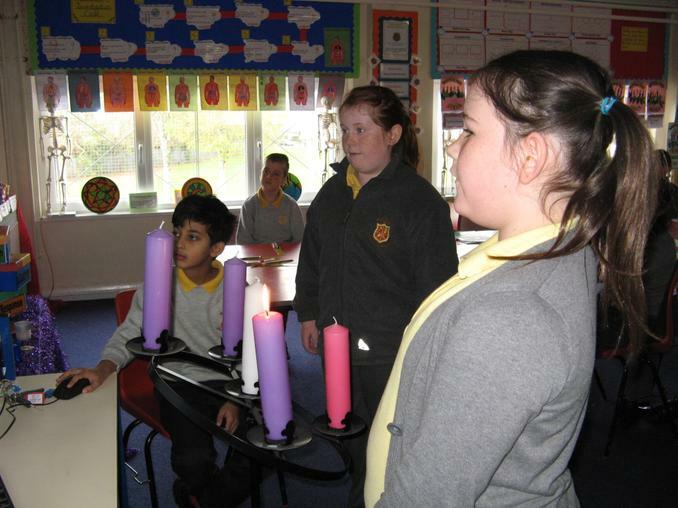 Jessica: my Advent promise is to be thankful for what I have and not be selfish and think of other people through advent. 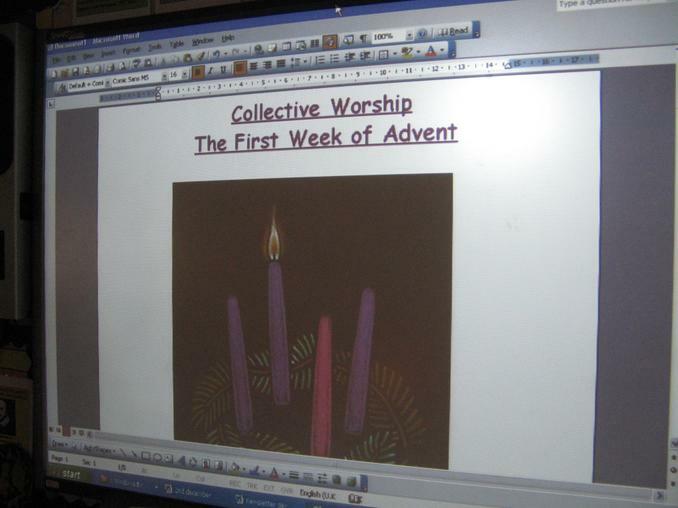 Kane: My Advent promise is to be obedient to my family, friends and teachers. 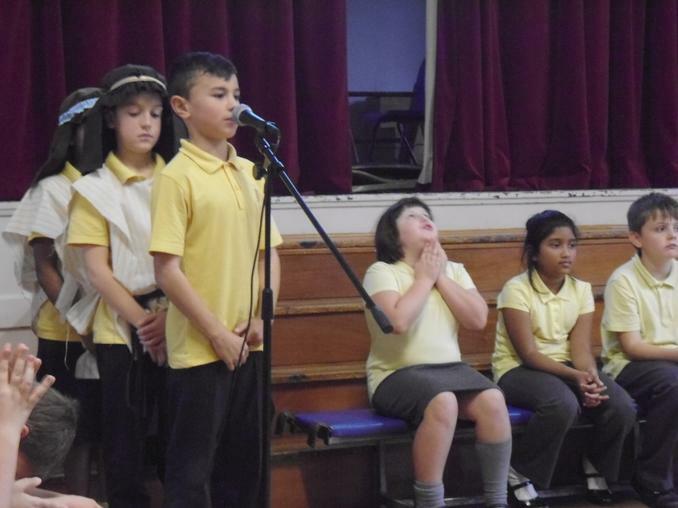 Charlie: My Advent promise is to be grateful for what I’m given off my family and friends and not be jealous of other people. 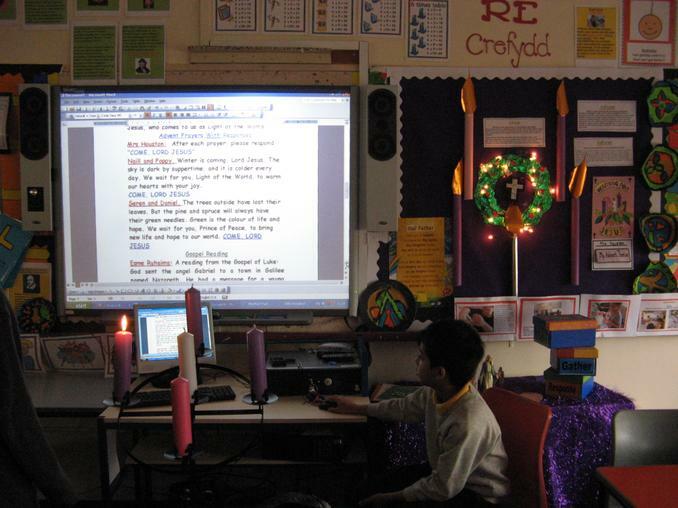 Vesare: My Advent promise is than I will be helpful and kind to other people everywhere where I go and I do and always in this Advent. 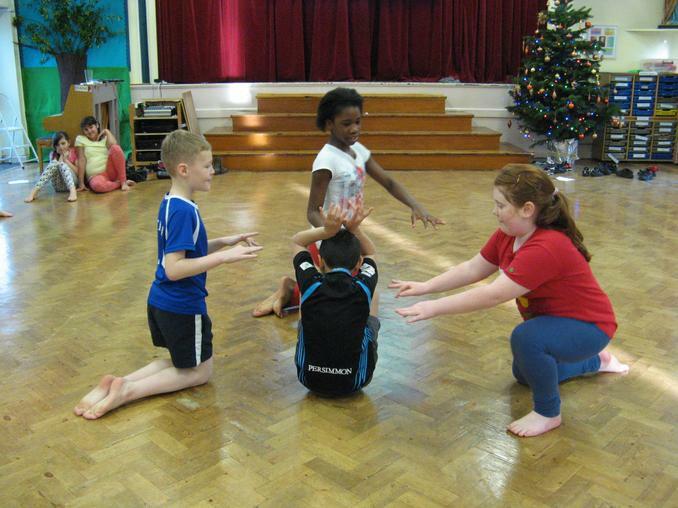 Day: My Advent promise is to guide my brother when he grows up. 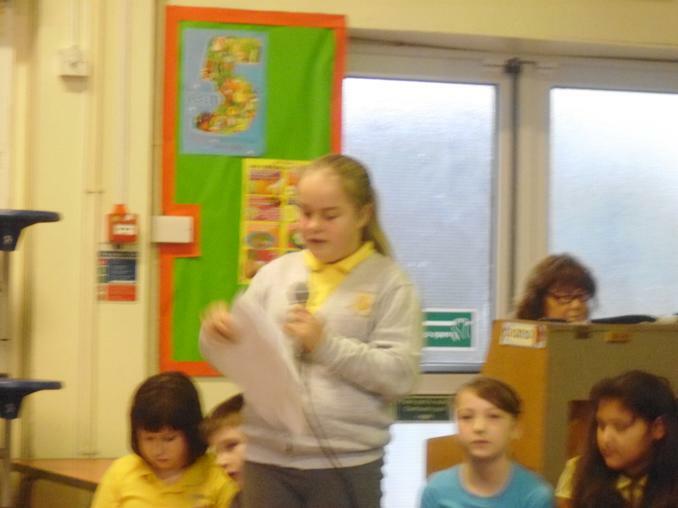 Poppy: My Advent promise is to stop being mean to my brother and sister at home. 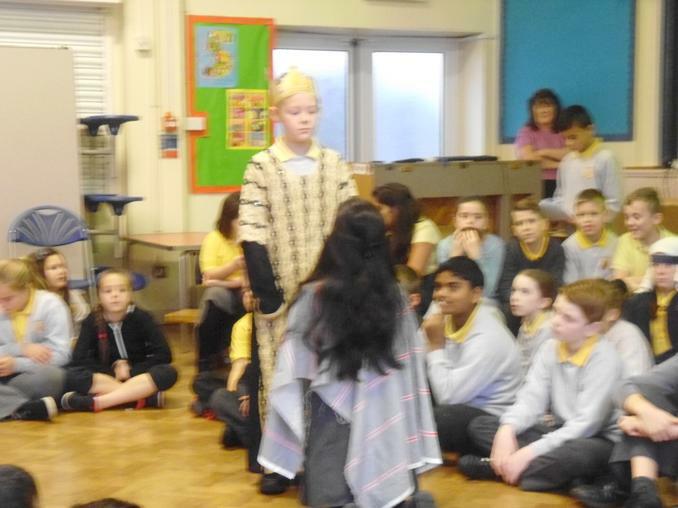 Matthew: My Advent promise is to be kind to my brother either if I am temped to hit him, if he hits me I will not hit back I will calm down and tell its wrong and be thoughtful to my family to listen. 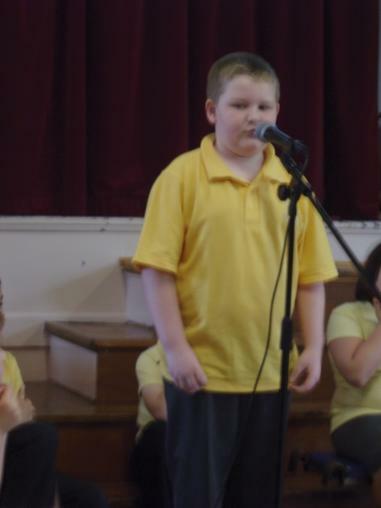 Jamie: My Advent promise is to be eco friendly and be good to my mother and go to church more often including Christmas Eve. 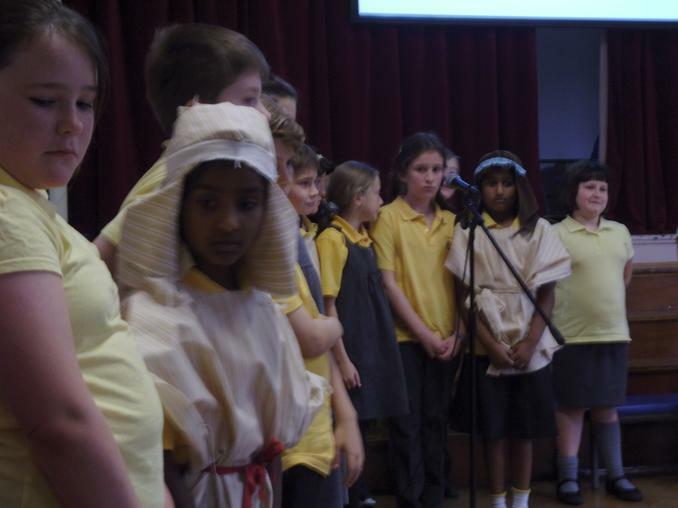 Luke: My Advent promise to always be full hearted. 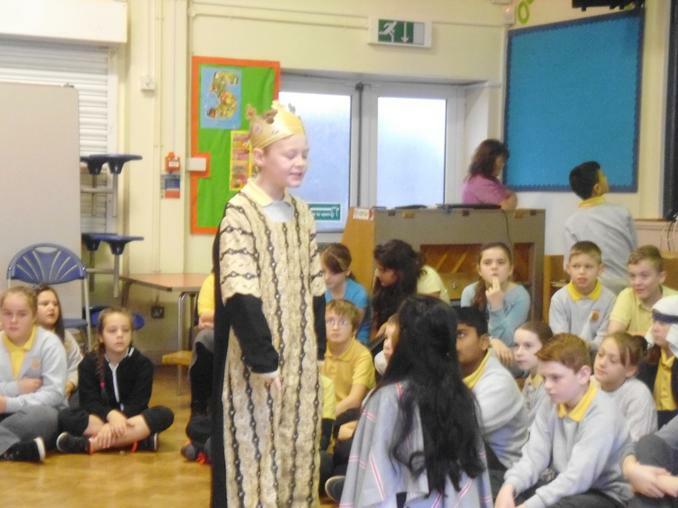 Kristoff: My Advent promise is to always be kind to my brother and sister. 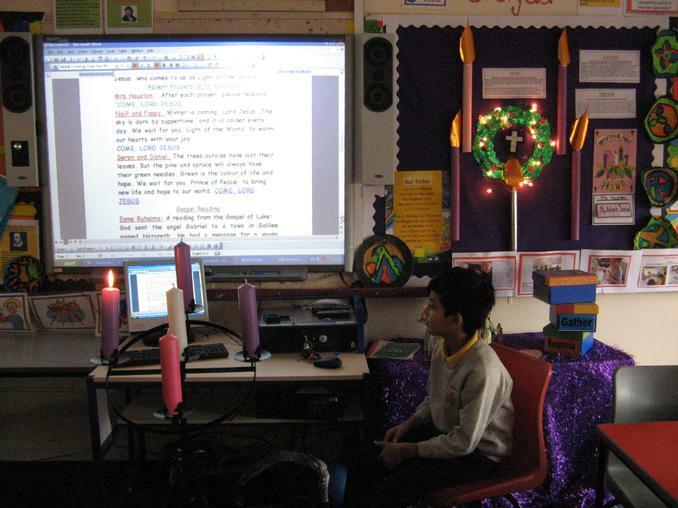 Angelo: My Advent promise is to be to be obedient to my parents and teachers. 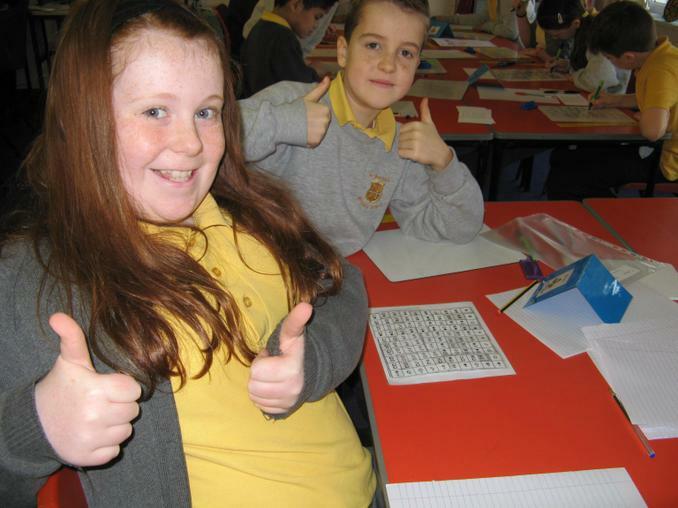 Esme: My Advent promise is to be very organised with school work, like doing all my homework and bringing it back on time. 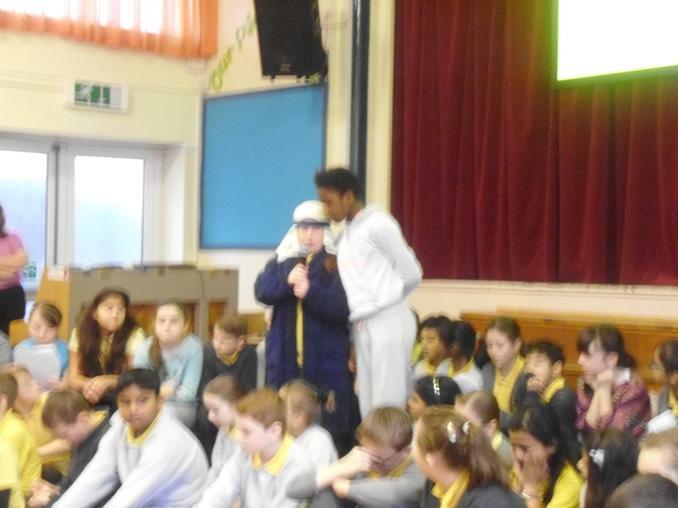 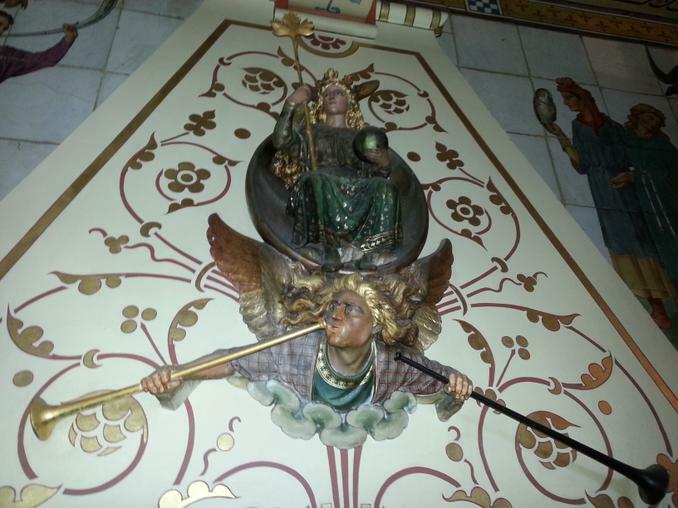 Ruhaima: My Advent Promise is to help my mum, dad and my two sisters with their chores. 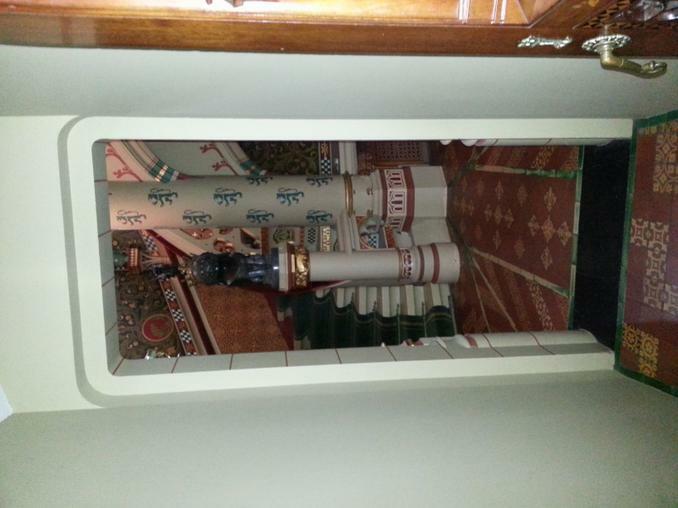 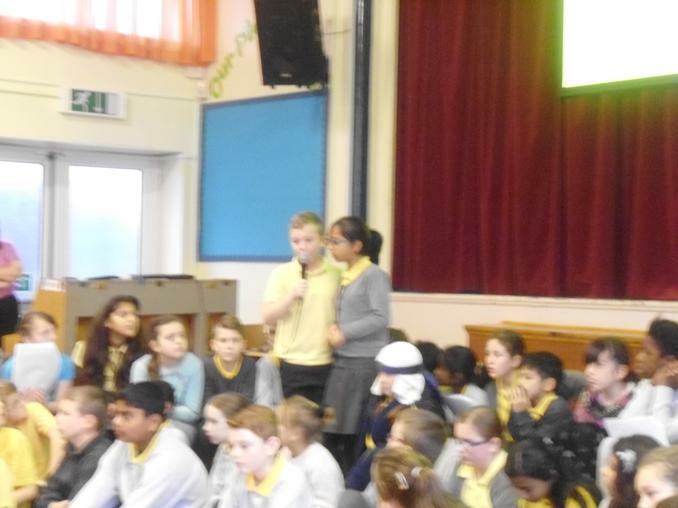 Sania: My Advent promise is to not fight with my brother or sister and will love everyone at advent I also will tidy my bed room when my mum or dad asks me to. 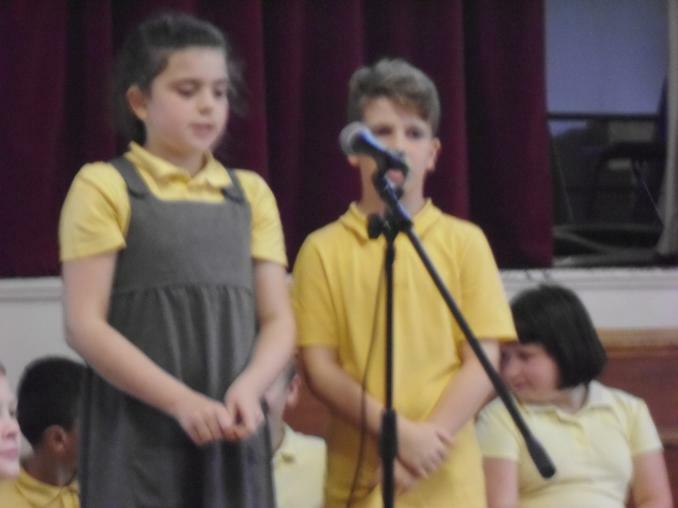 Seren: My Advent promise is to not be mean to my brother and sister and to do what my mum asks me to do. 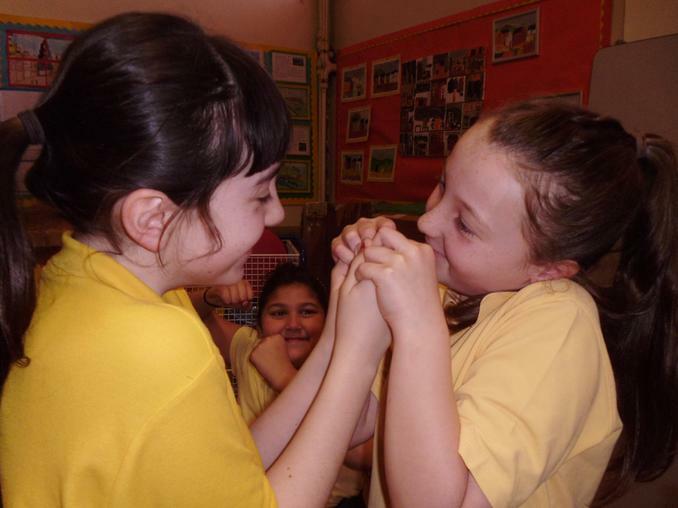 Emily: My Advent promise is to try not to argue with my brother. 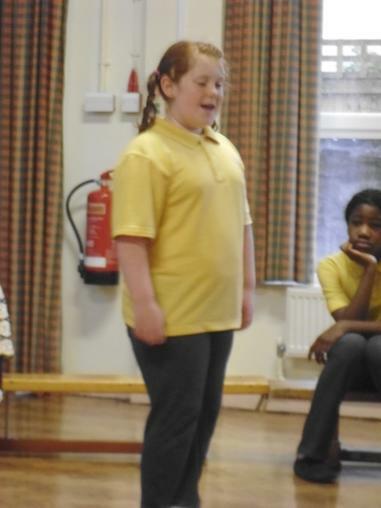 Niamh: My Advent promise is to do what my mum tells me straight away. 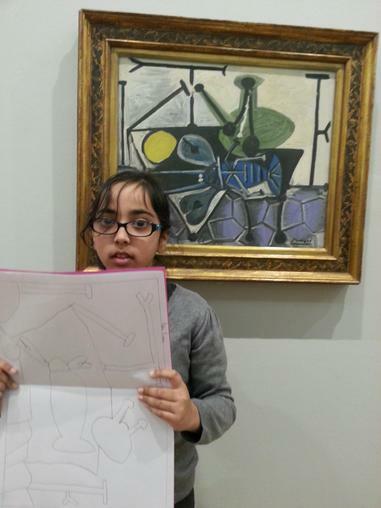 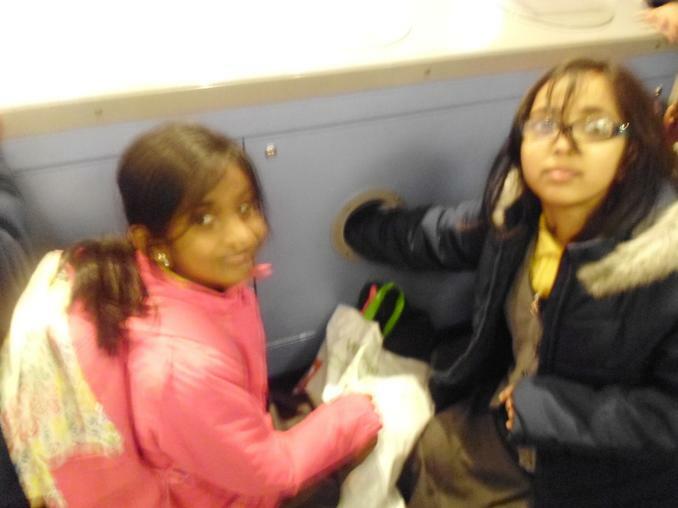 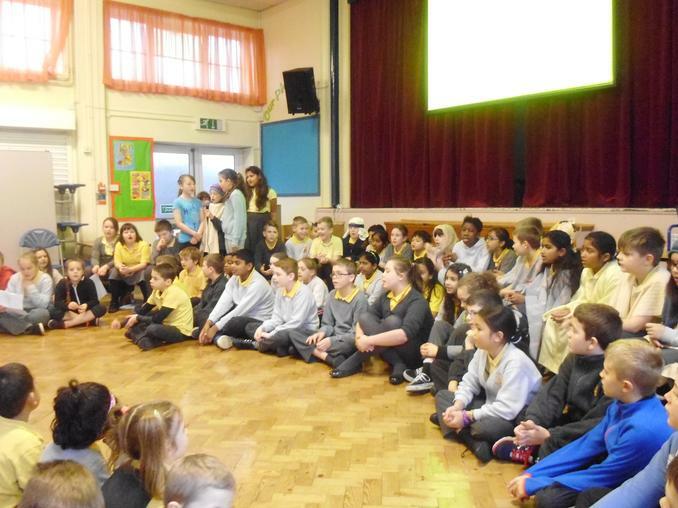 Reeha: My Advent promise is to do what my mum tells me to and look after my brother and sister. 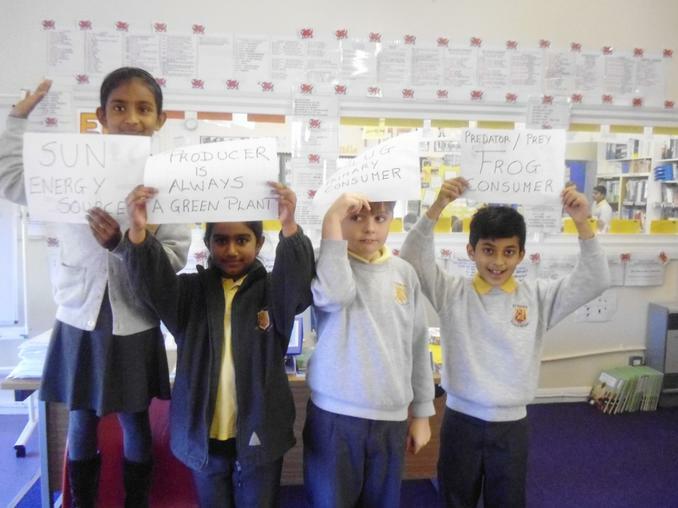 Food Chains: Year five have been learning about how all living things are dependent on one another within an ecosystem to ensure the survival of each species. 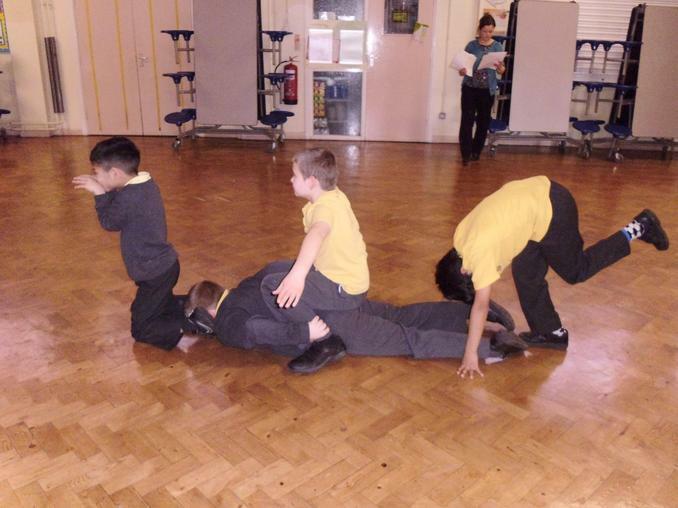 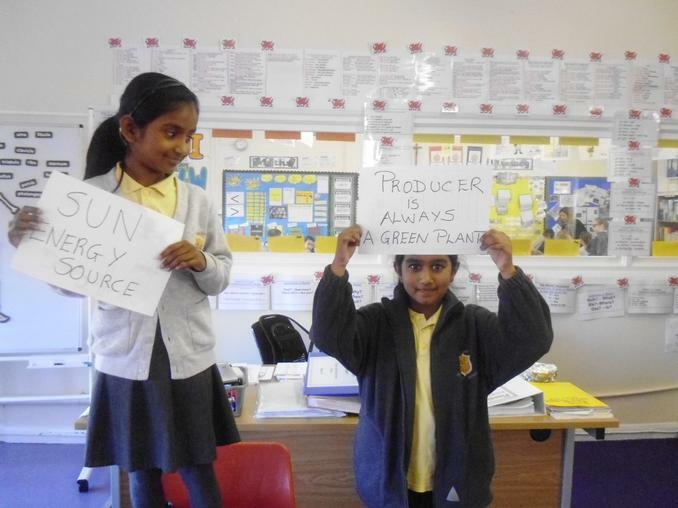 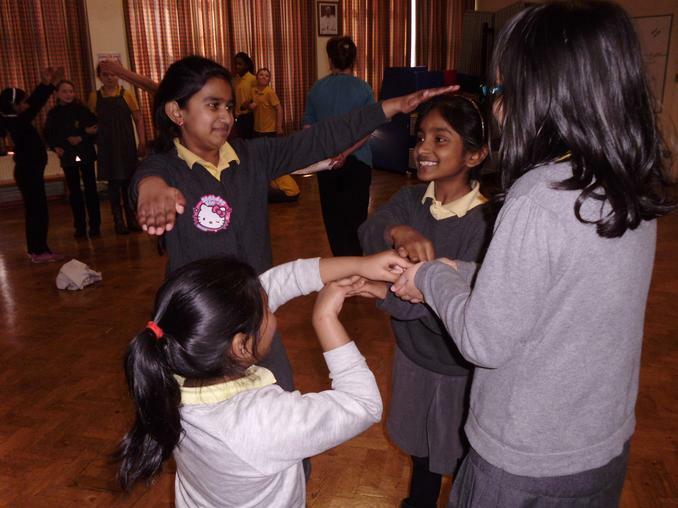 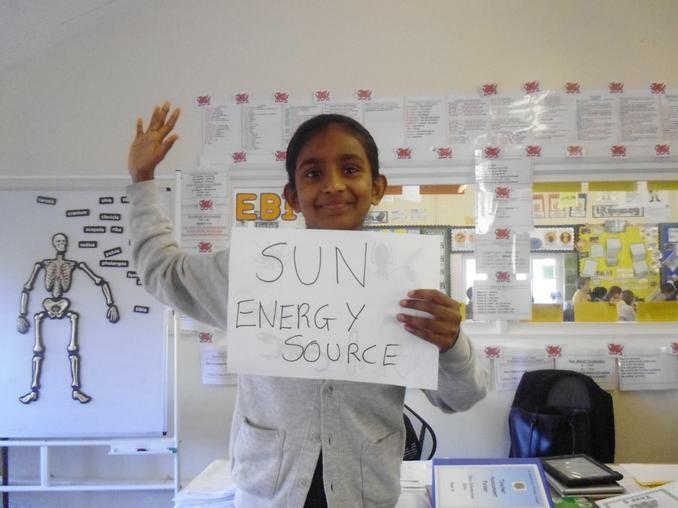 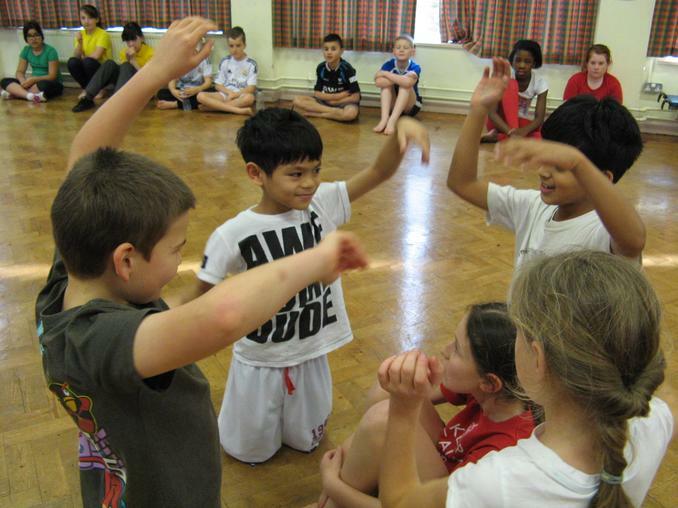 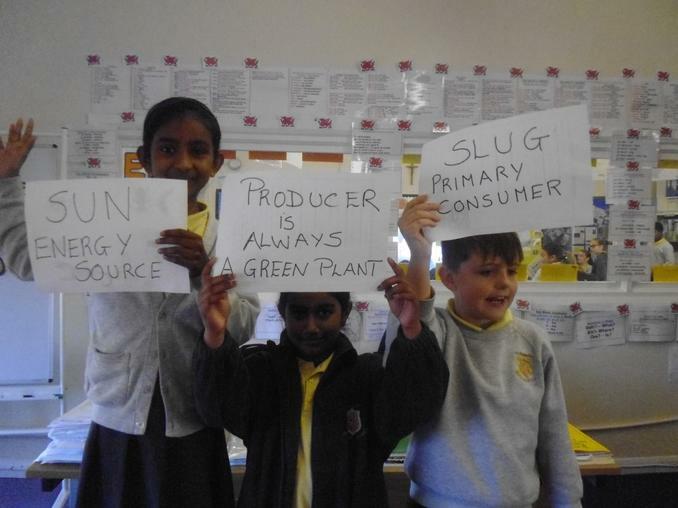 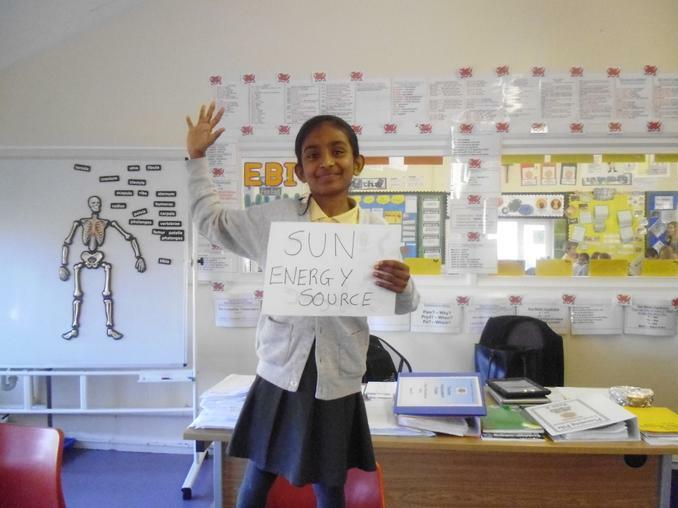 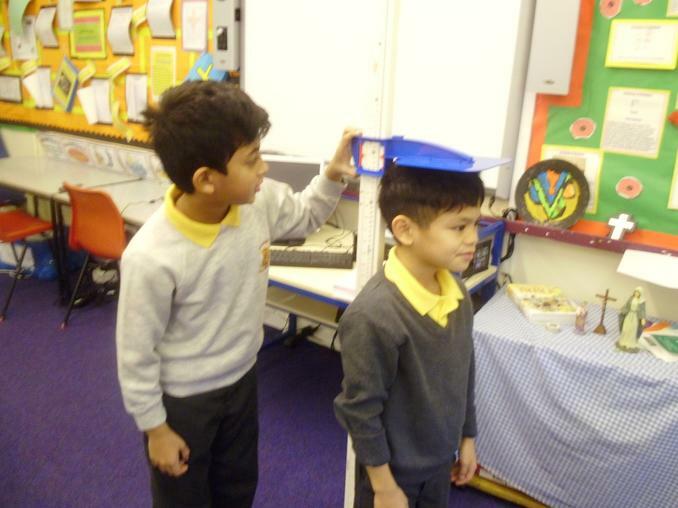 We have learnt how to construct food chains and have learnt new scientific vocabulary – energy source, producer, primary consumer, consumer, prey, predator, omnivore, carnivore and herbivore. 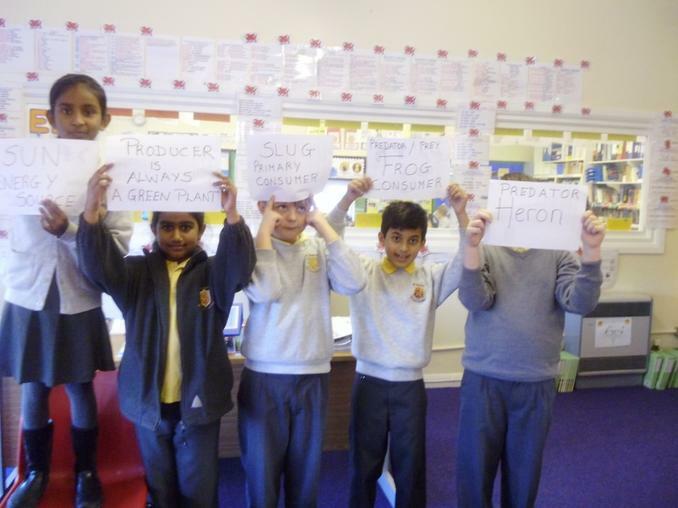 We worked in groups to make our own food chains. 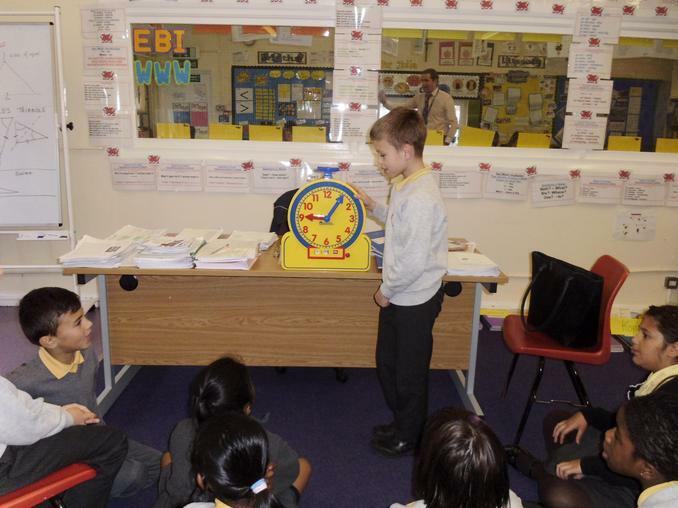 Angle: Mrs Houston's mathematics class have being learning that angle is a measurement of turn. 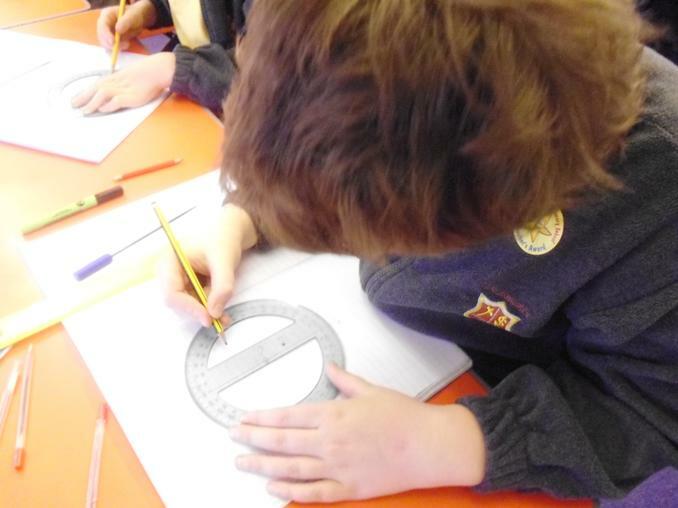 We have used a protractor to measure acute and obtuse angles. 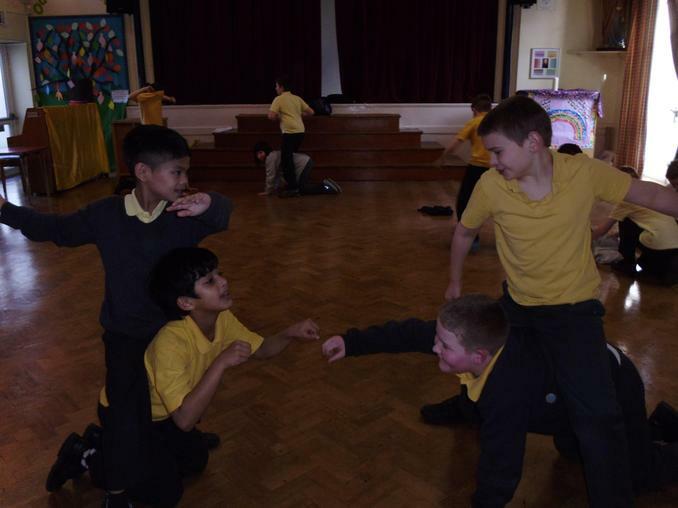 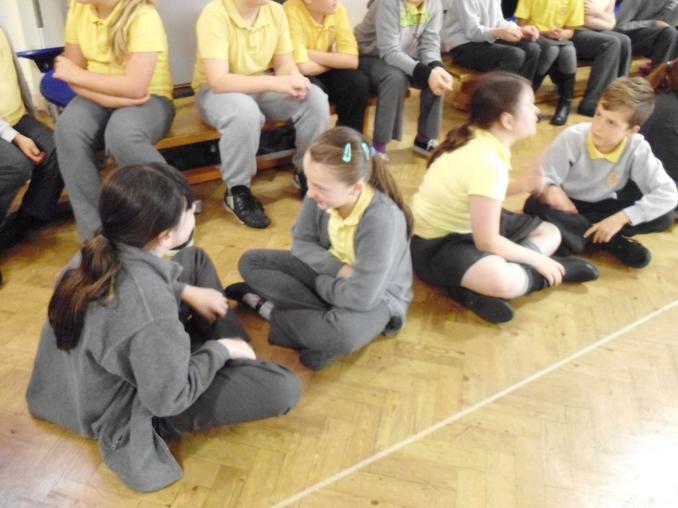 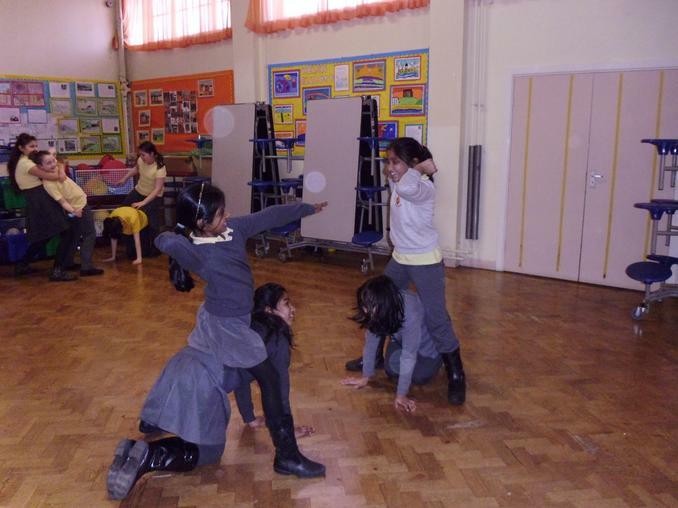 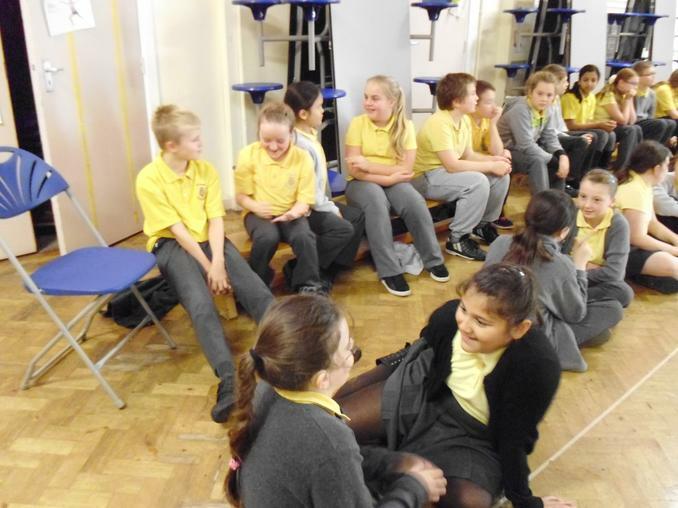 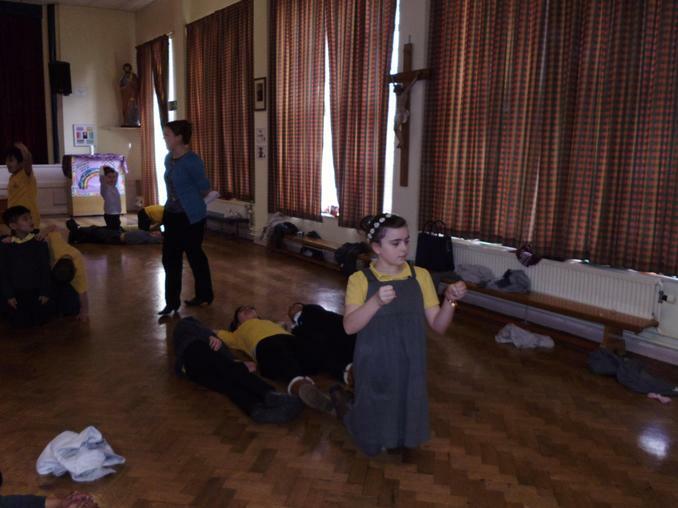 Anti Bullying Week: Th children have focused on the effect of 'ganging up on people' by acting out dramas on the woman the mob wanted to stone to death and the behaviour of the bullying servant. 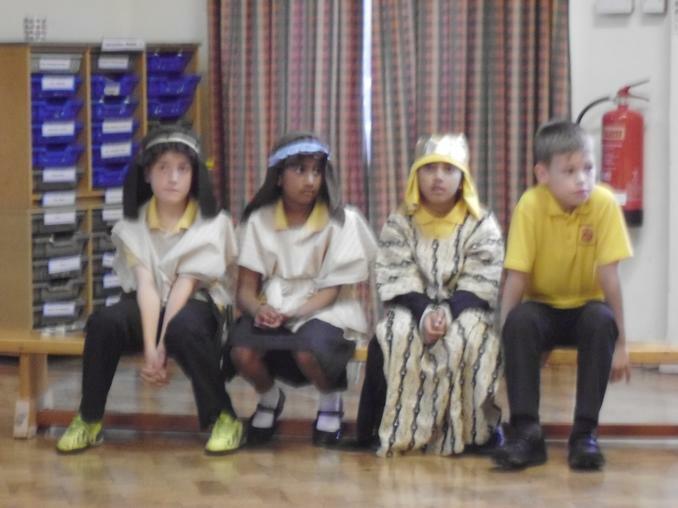 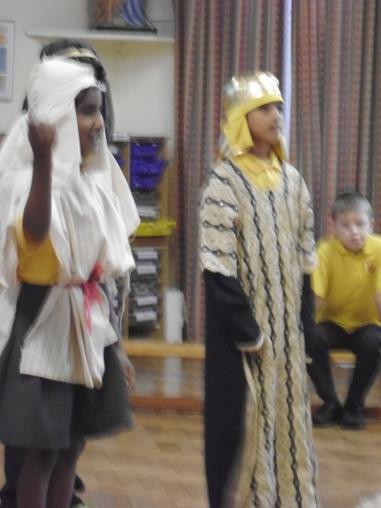 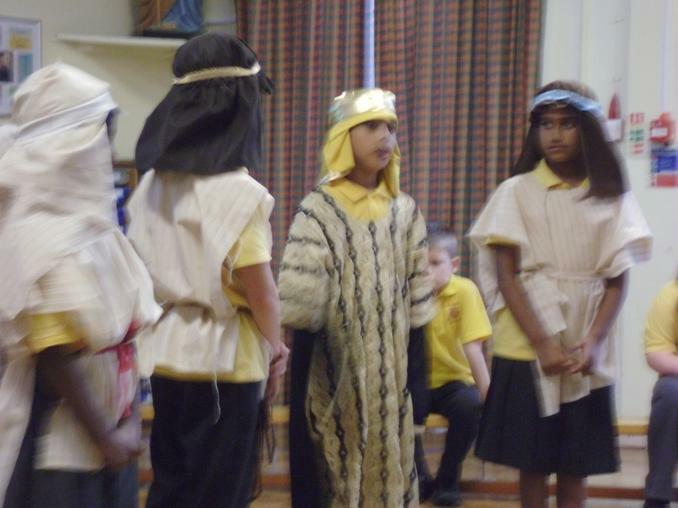 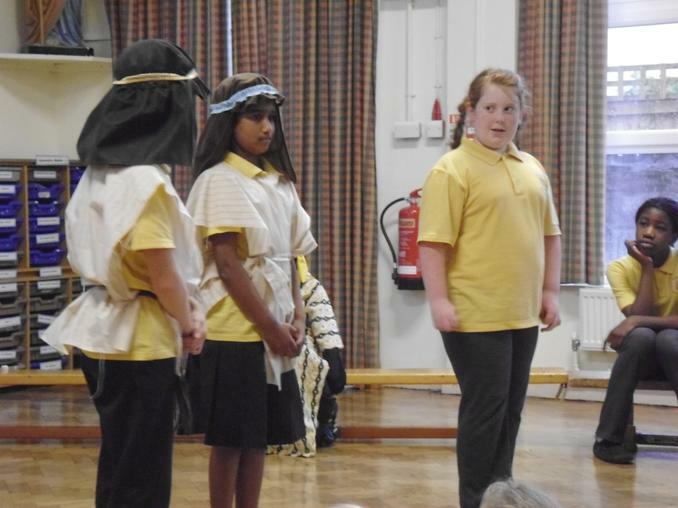 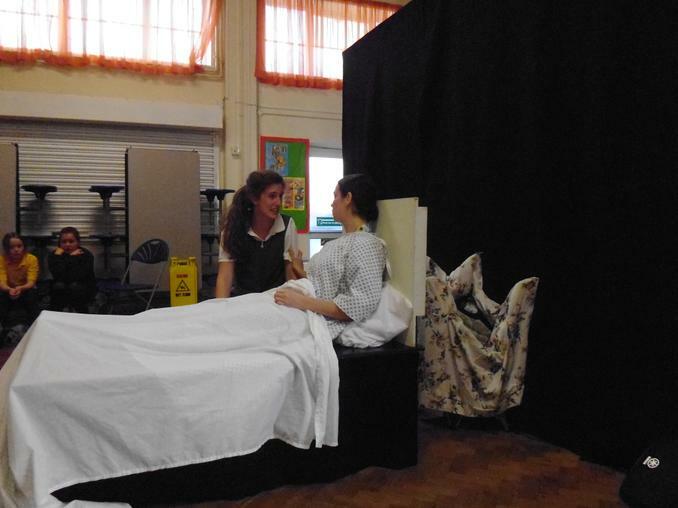 The children used these dramas in a presentation to the whole school and then performed a song based on Jesus' teachings - 'One Golden Rule - love one another as I have loved you'. 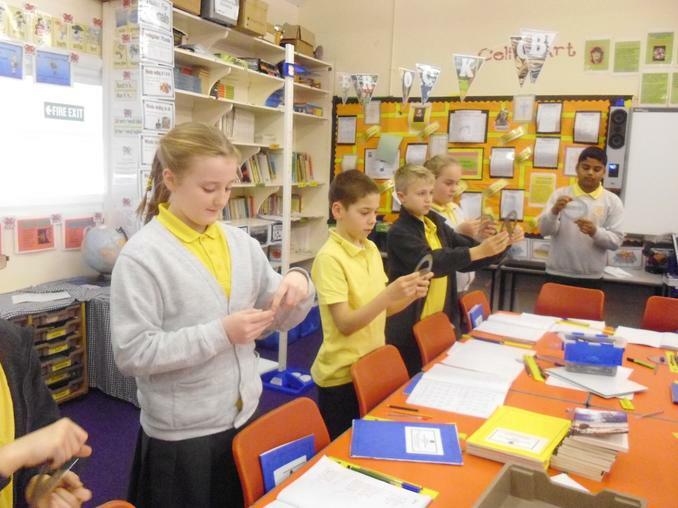 Science> We have been gathering data independently, learning to clalculate the mean / average of data, learning to record the 'range' of the data we gather, to plot information in line graphs and block graphs and indicating the average on to our graphs. 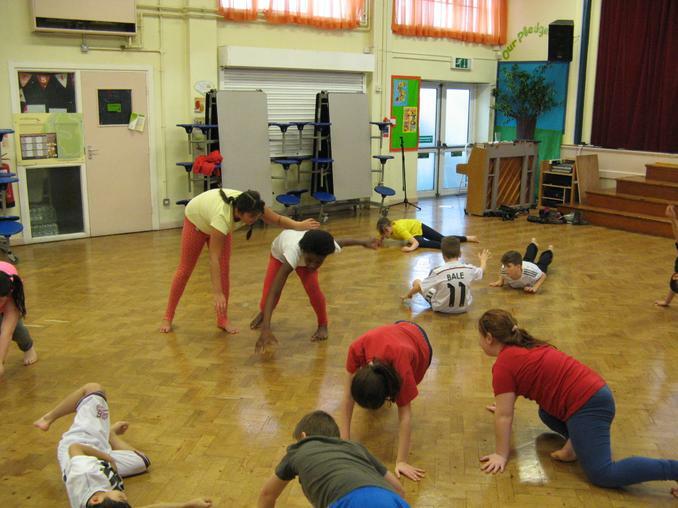 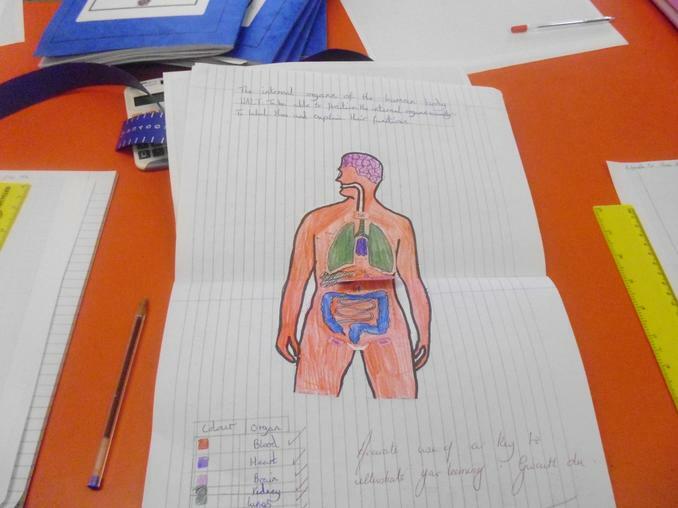 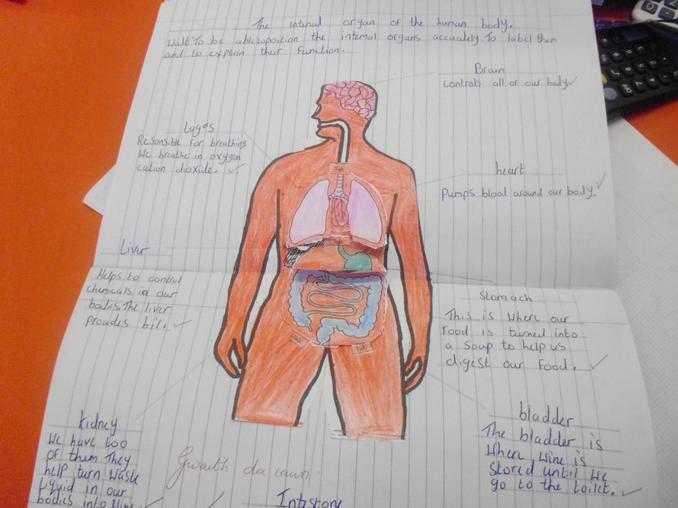 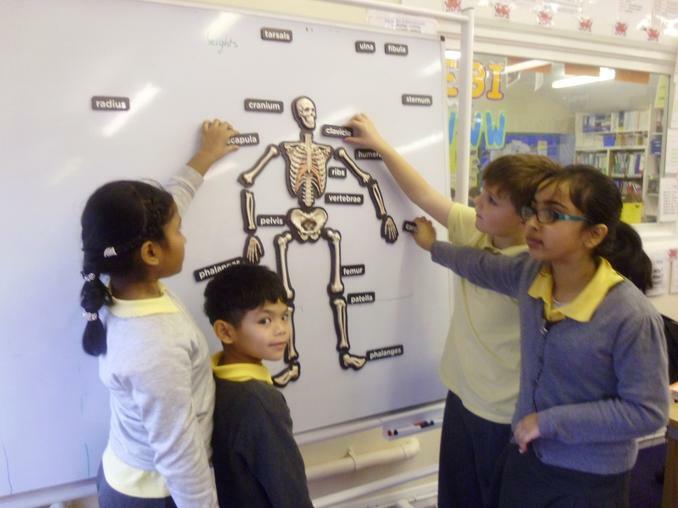 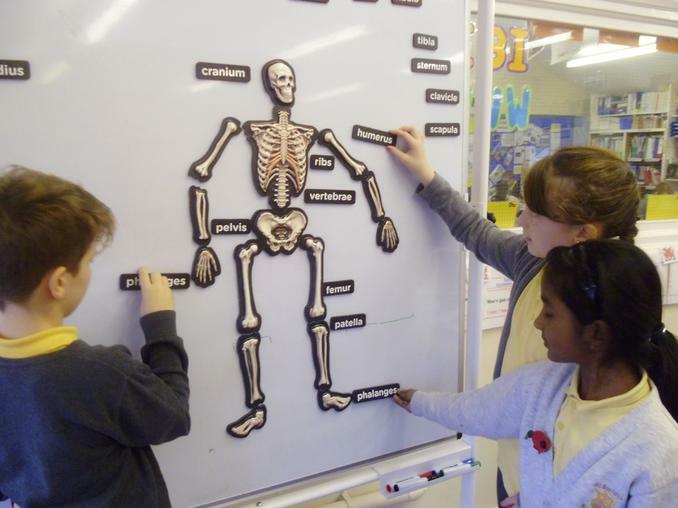 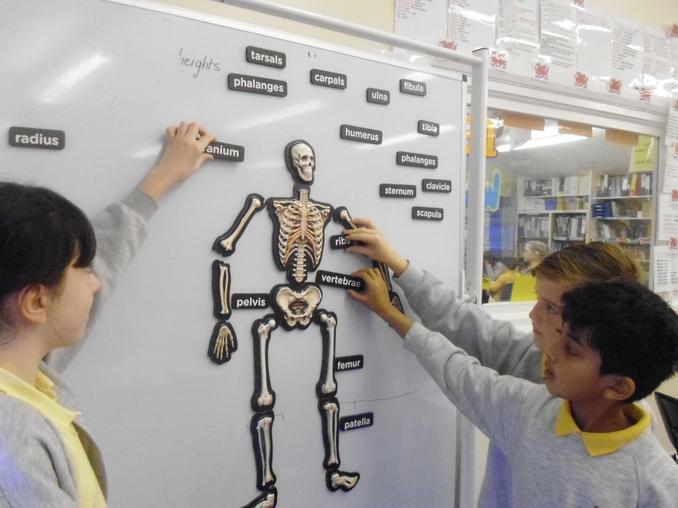 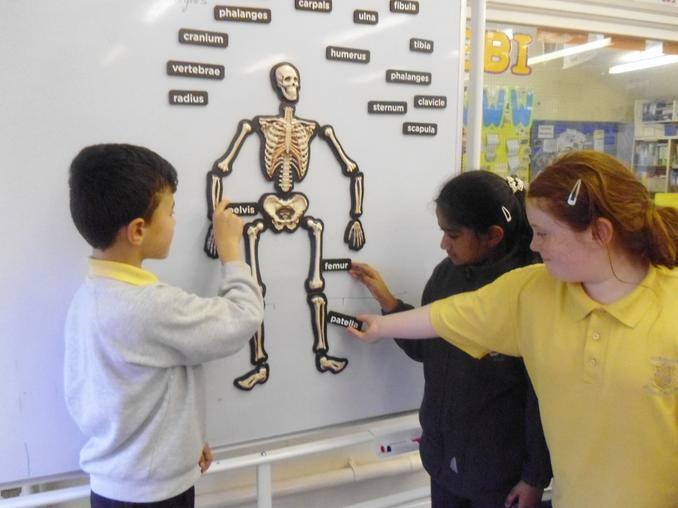 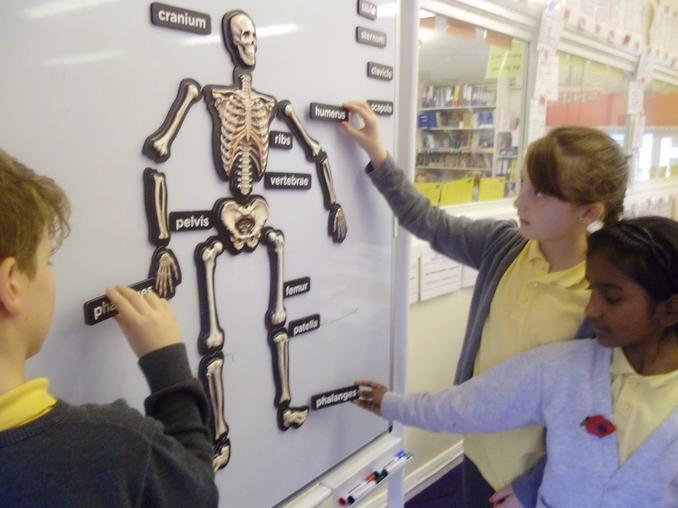 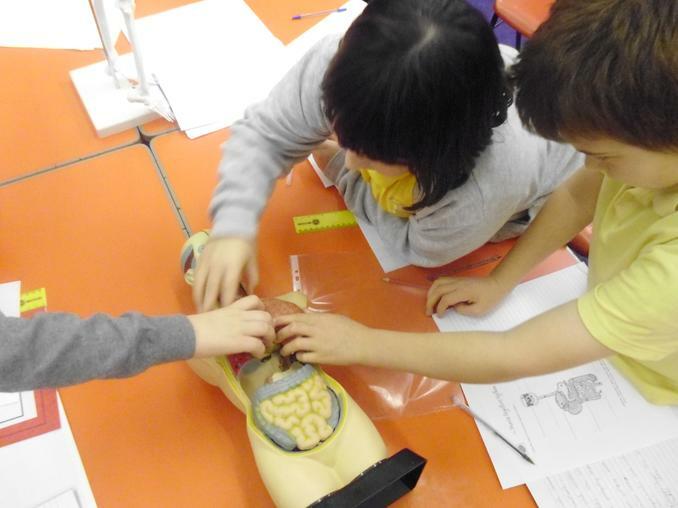 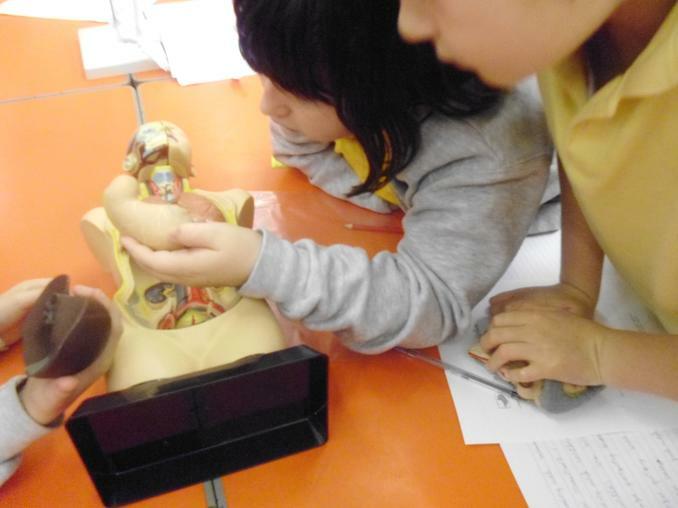 In addition we have been learning about the skeleton and the position and function of the internal organs of the human body. 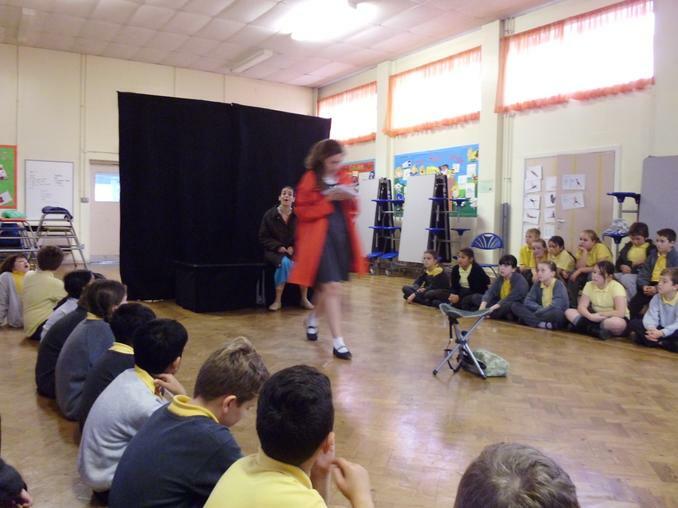 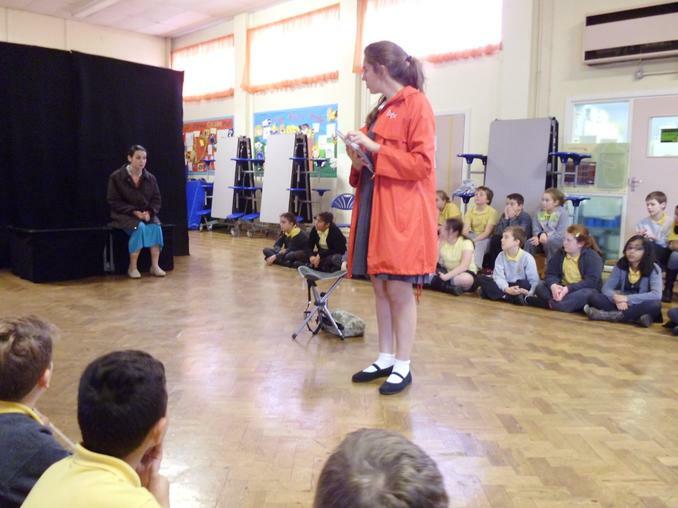 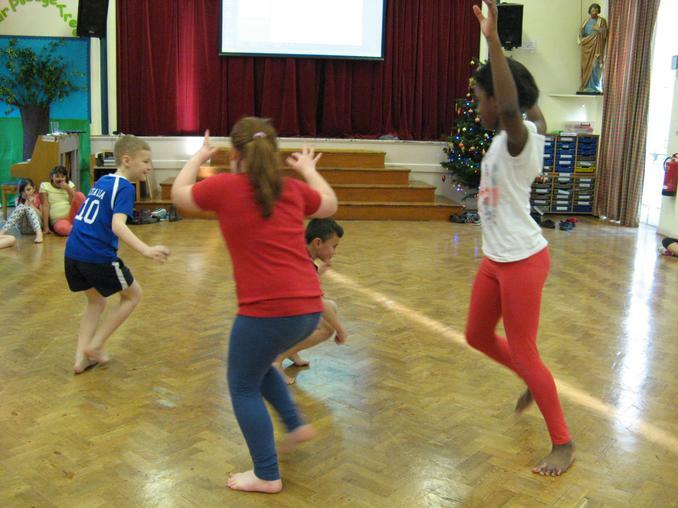 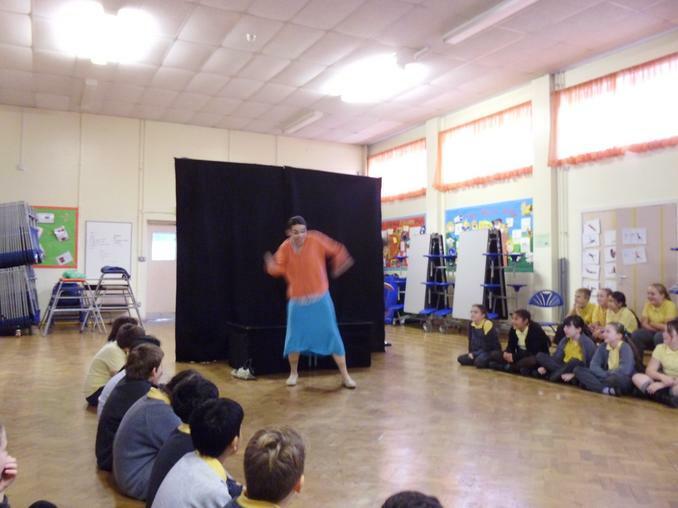 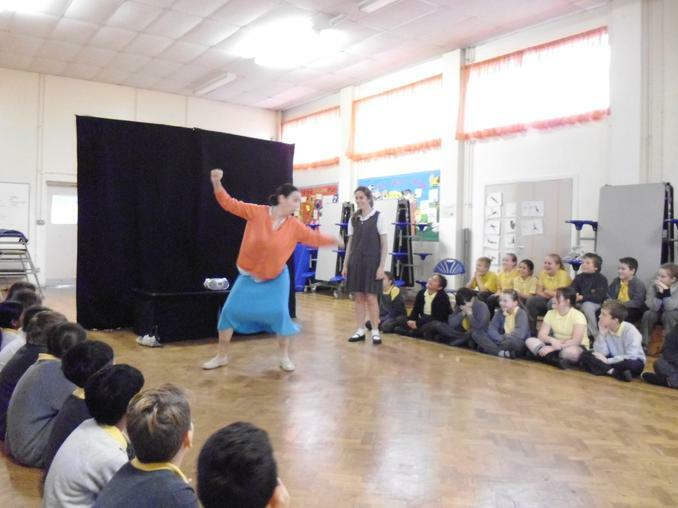 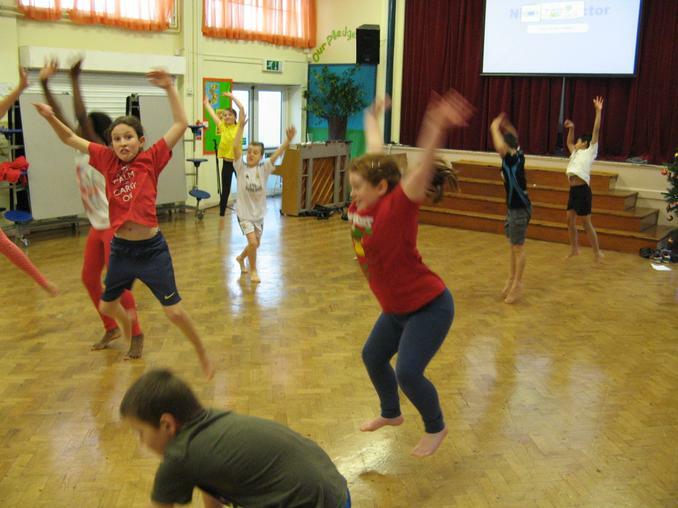 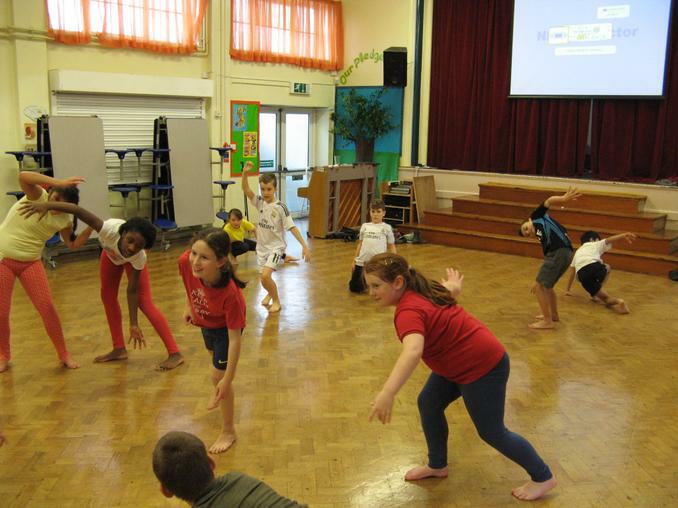 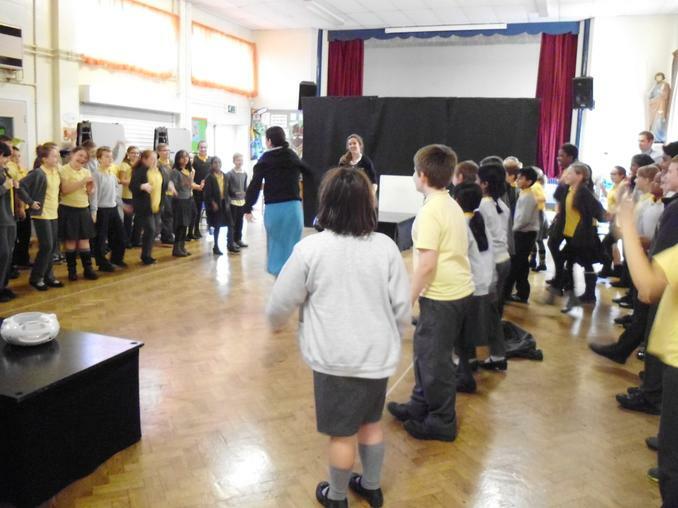 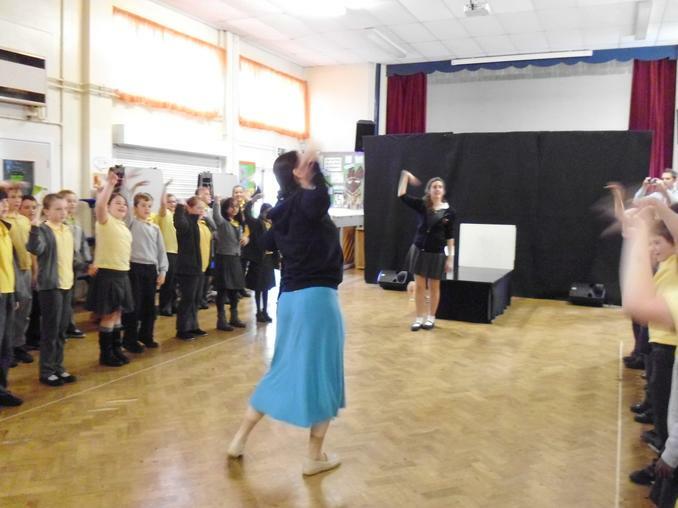 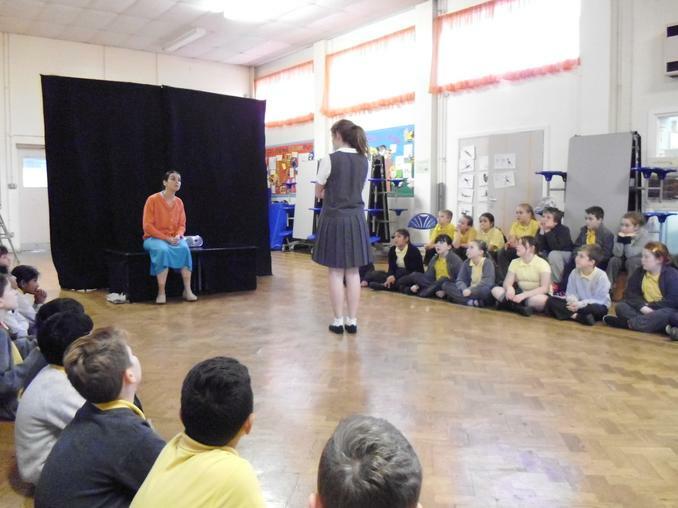 Ten Ten Theatre Visit: Year five watched a play that enabled the children to focus on predjudice, bullying and the consequences of not repsecting people's race , appearnace and religion. 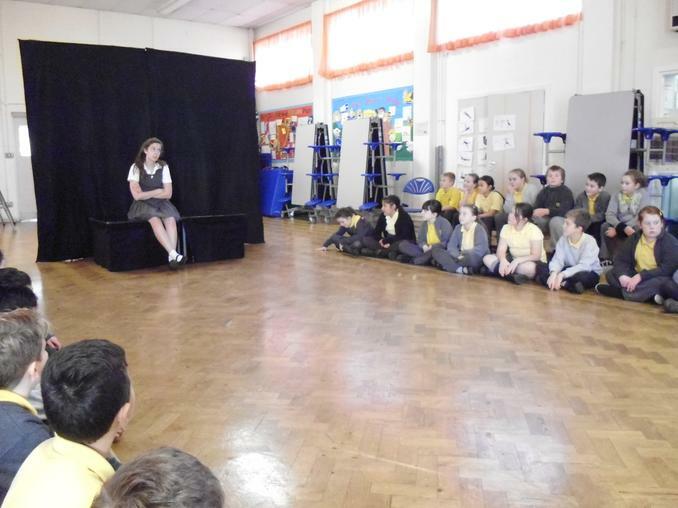 The children watched the play with sustained concentration and participated in the question and answer session that ensued the performance with enthusiasm that showed that they had reflected on the content of the play with maturity and interest. 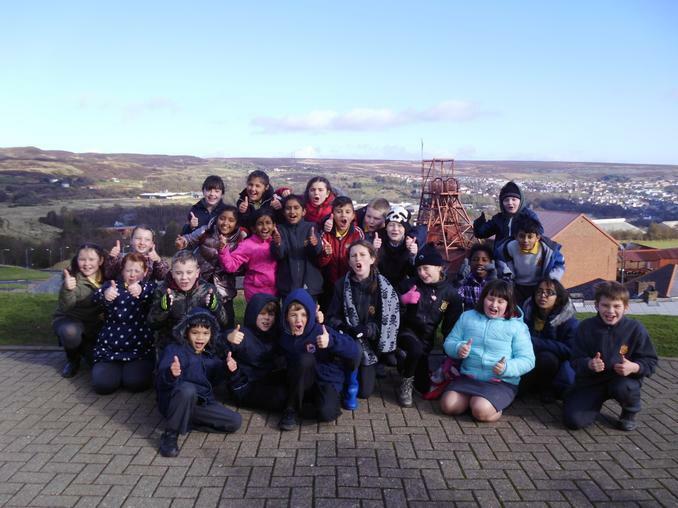 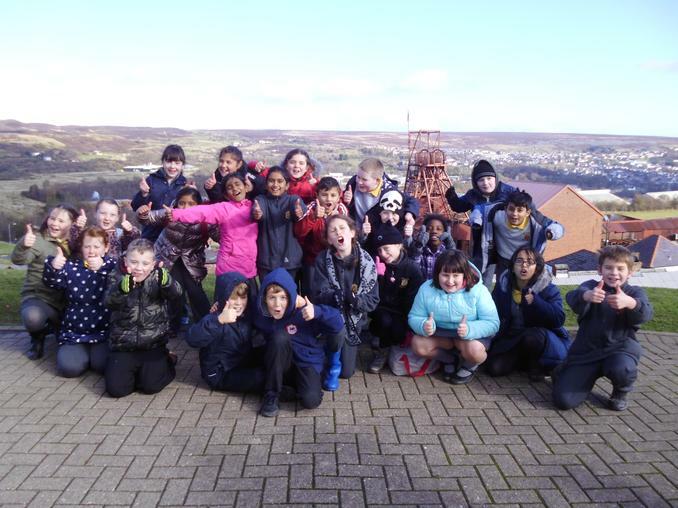 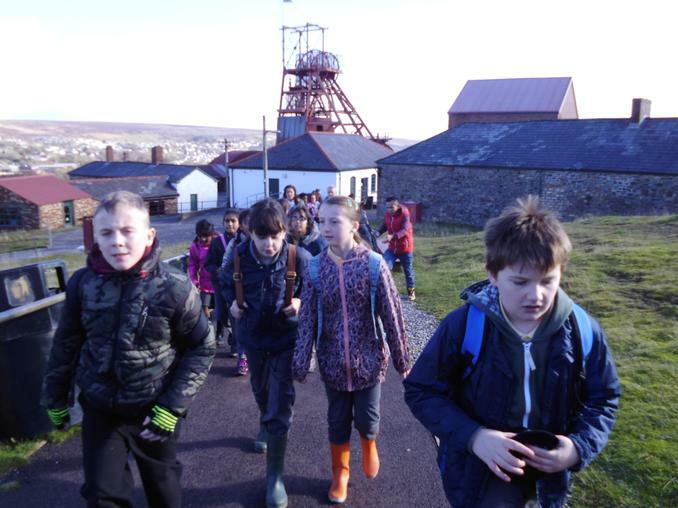 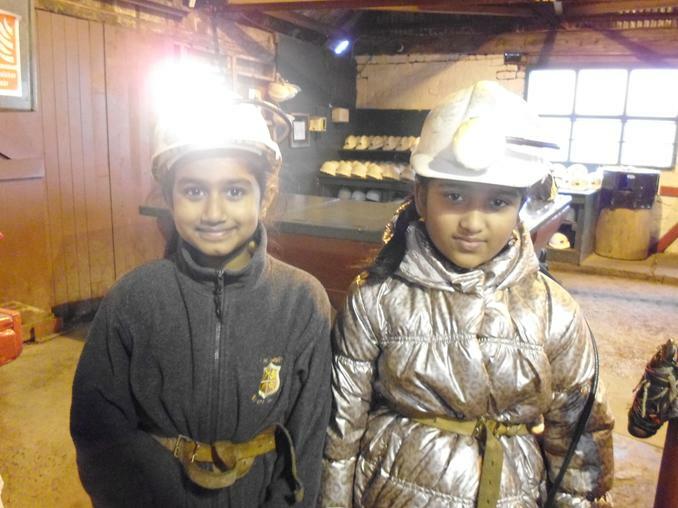 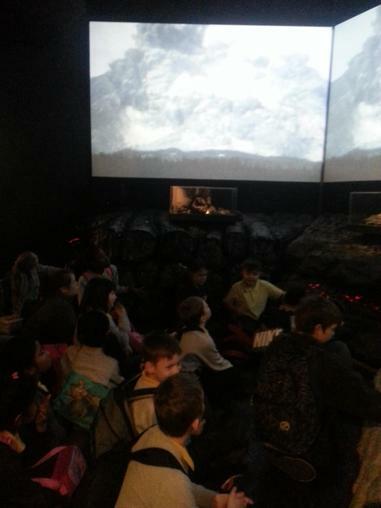 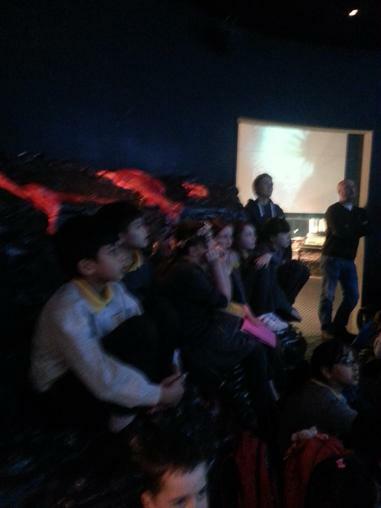 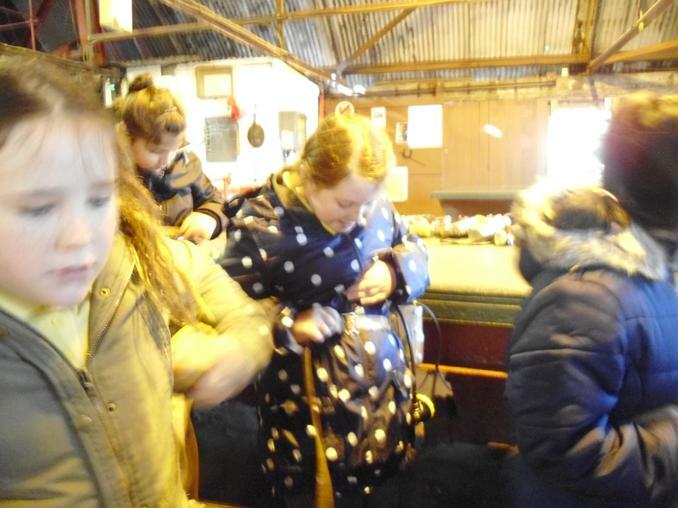 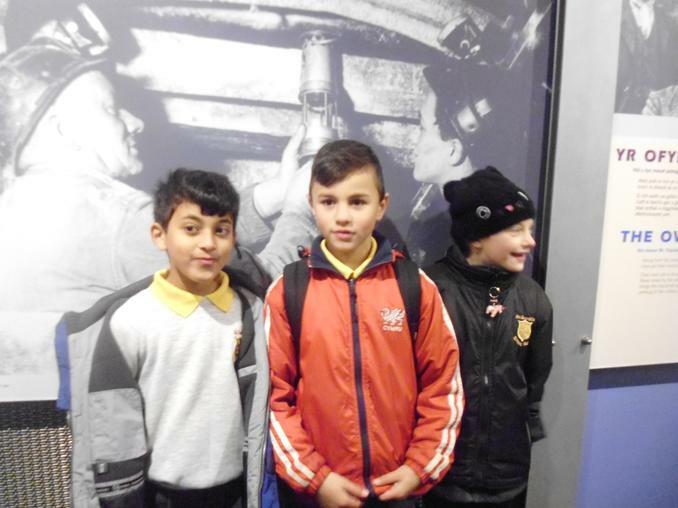 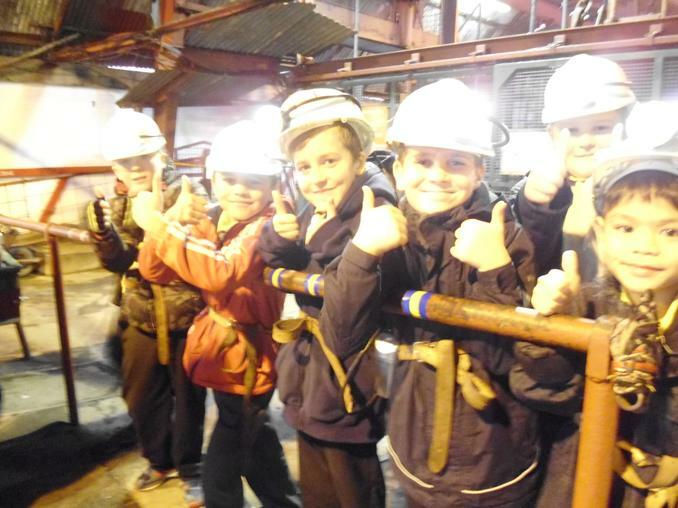 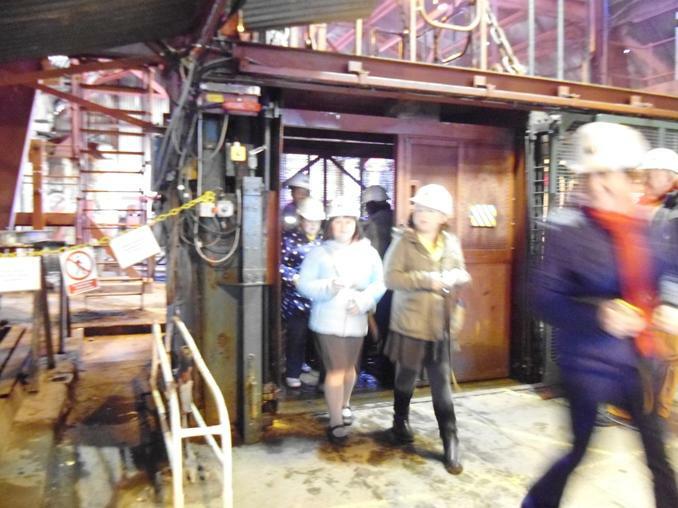 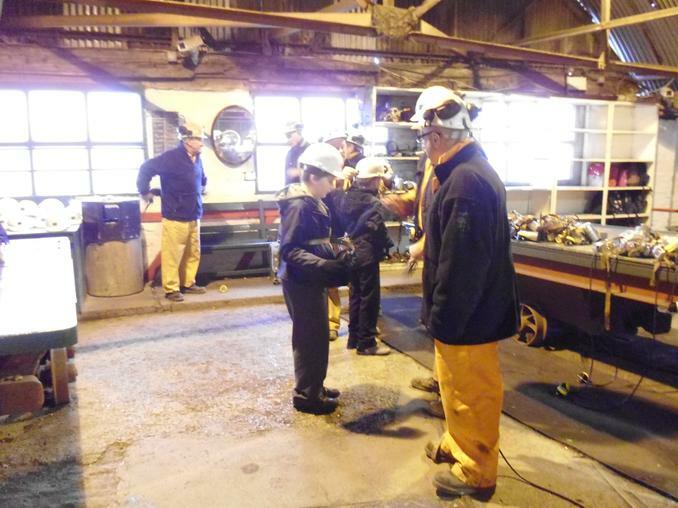 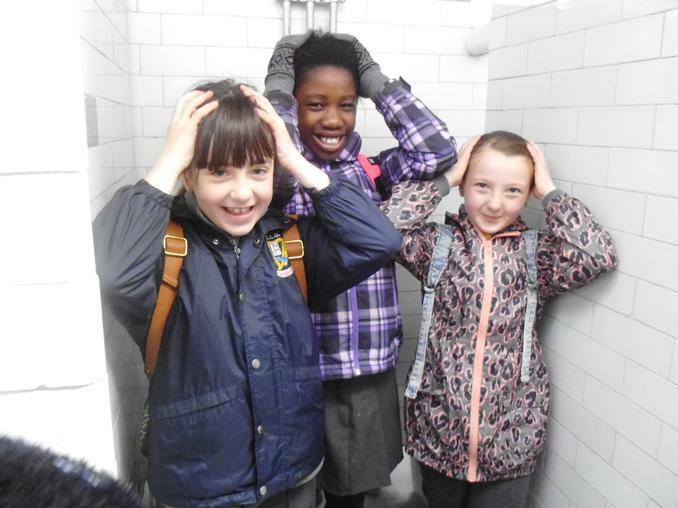 Year Five visit to Big Pit to learn about life in Wales during the Victorian period. 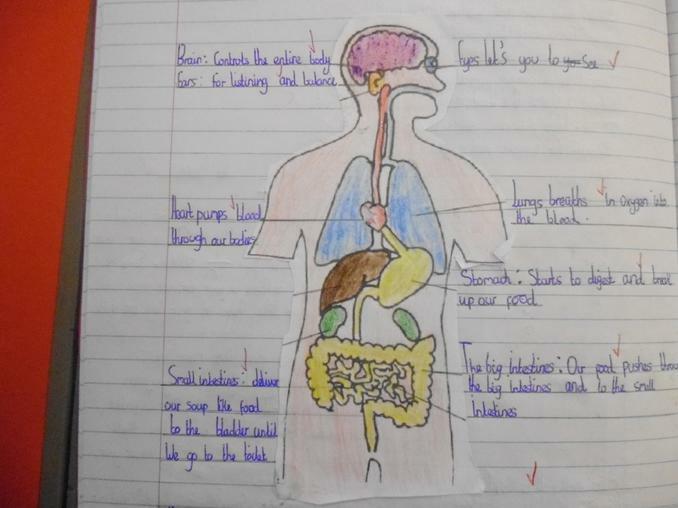 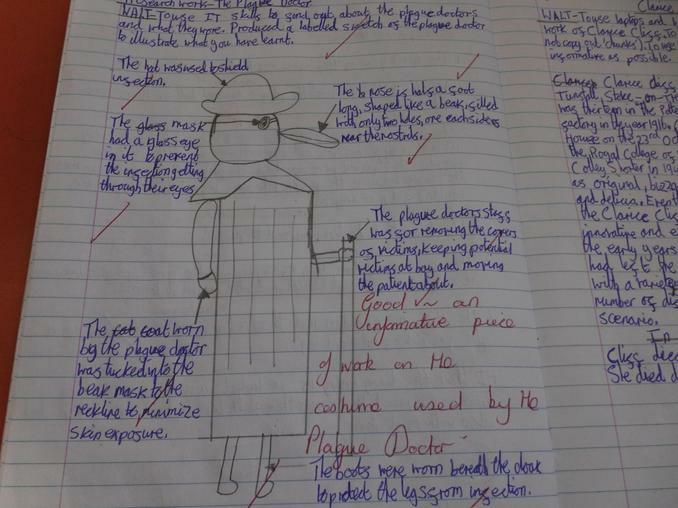 Potions - Here are some of the samples of work produced as part of our context for learning on the topic of 'Potions'. 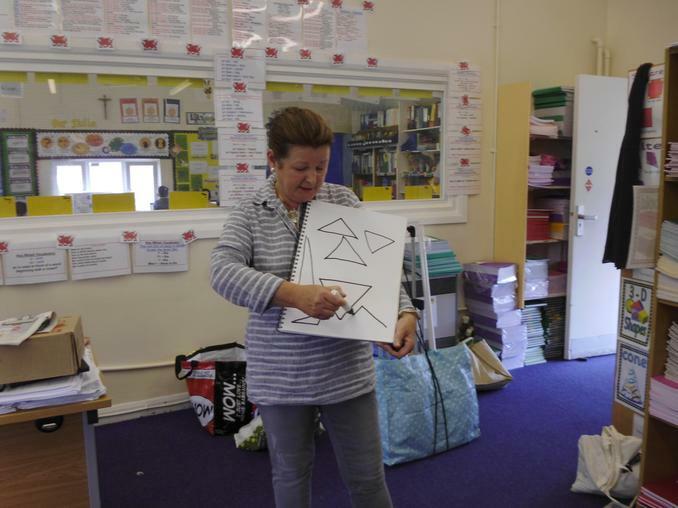 ANGLE: Information for parents to help you support your child with the new shape, data and measure project. 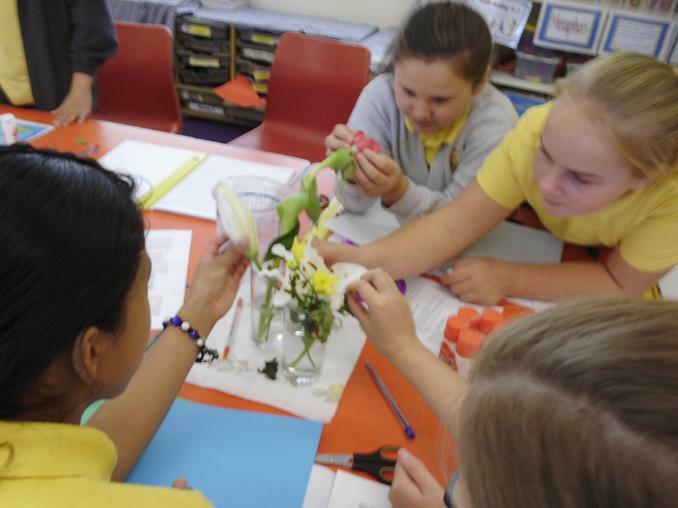 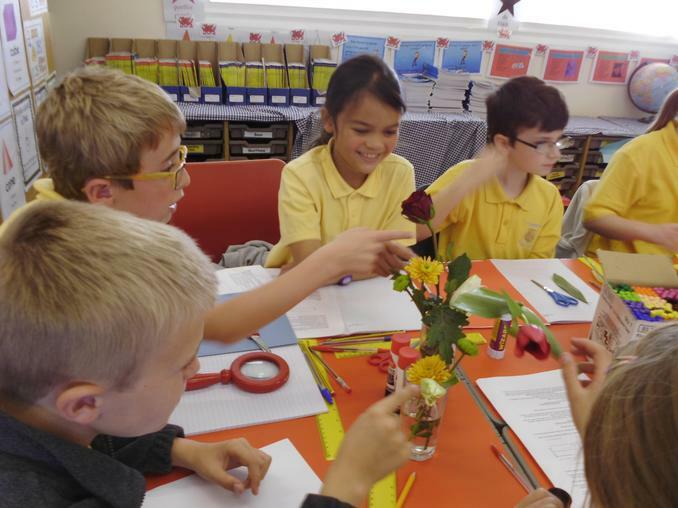 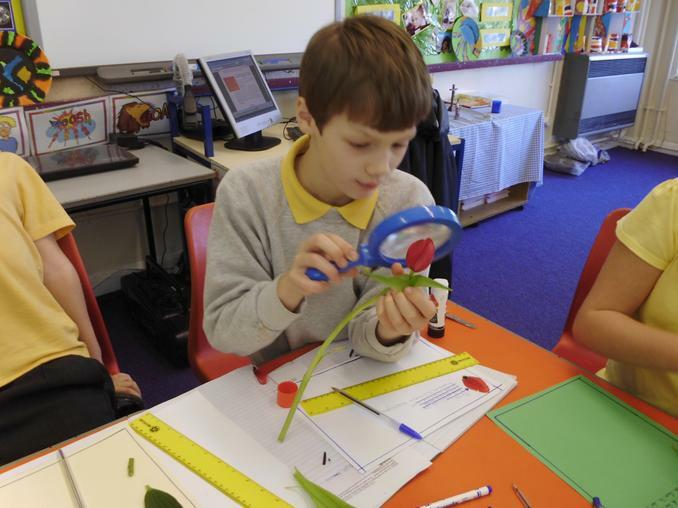 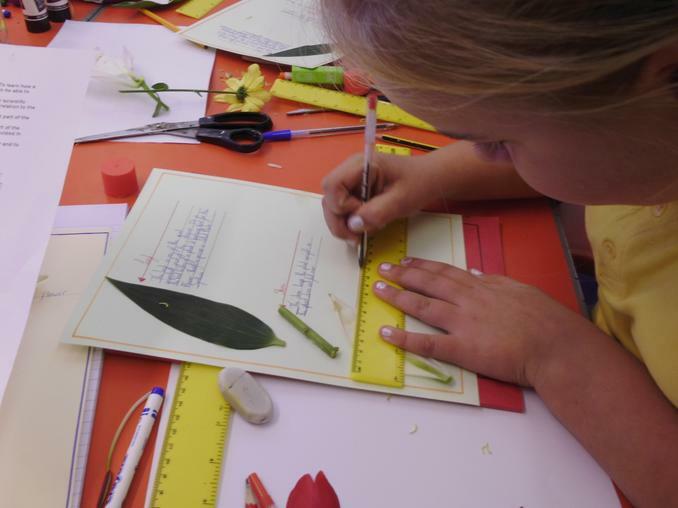 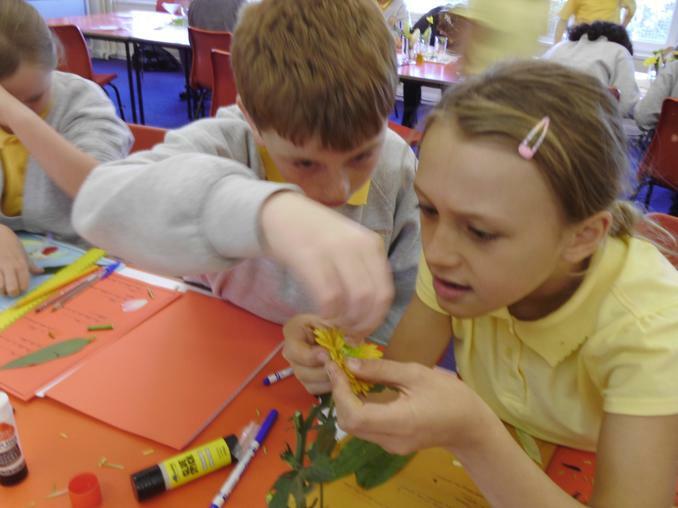 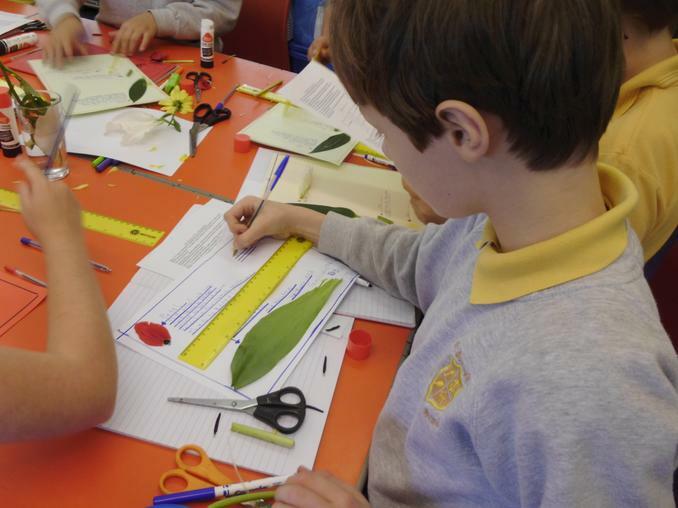 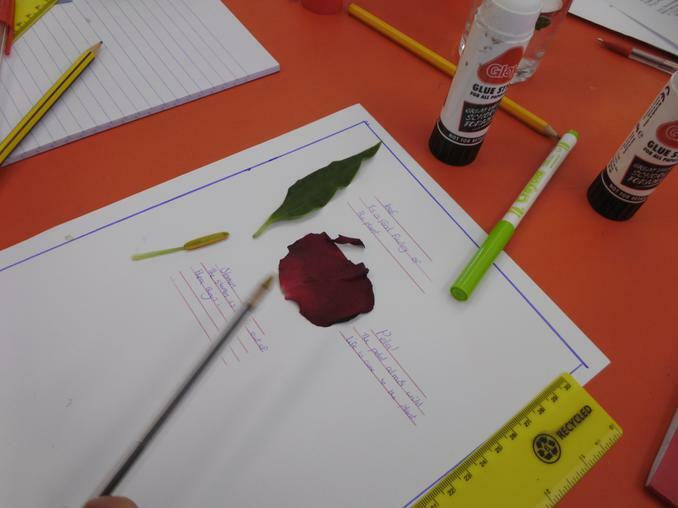 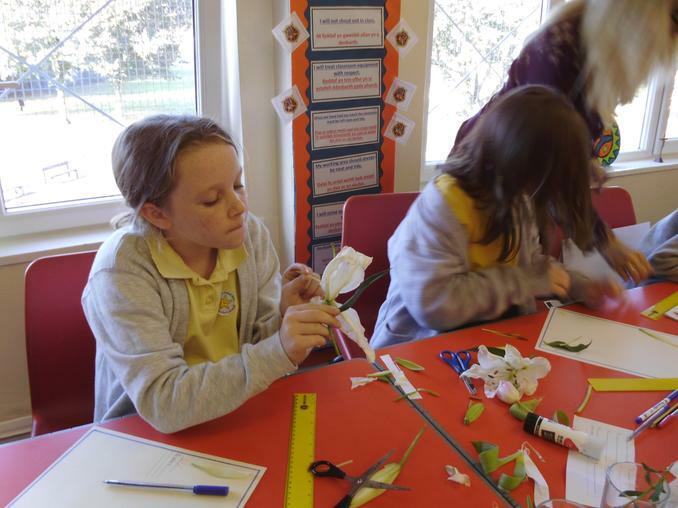 Reproduction of a flowering plant: The children in year six have been learninf about the different parts of the flowering plant including the anther, stamen, carperl stigma, sepal, ovary etc their position in the plant and the function of each in the process of reproduction. 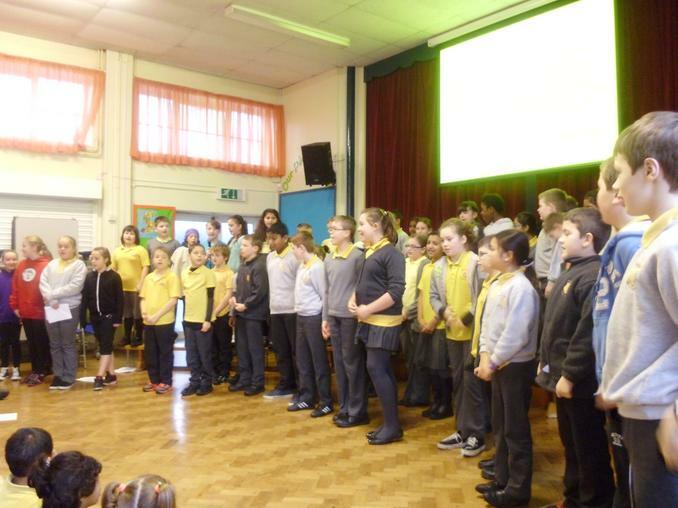 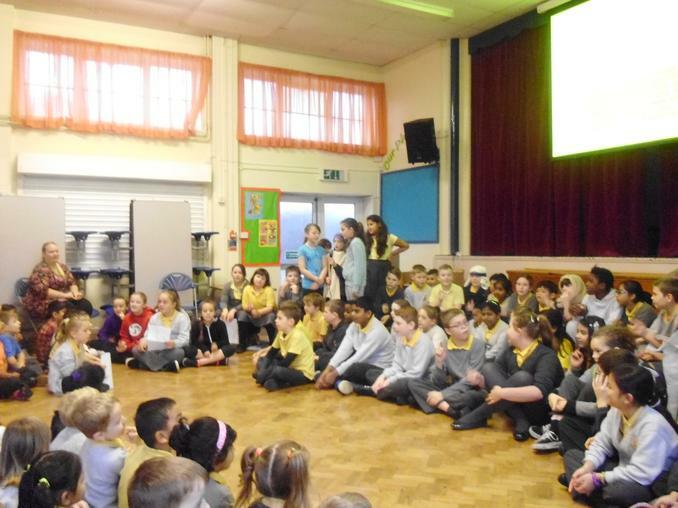 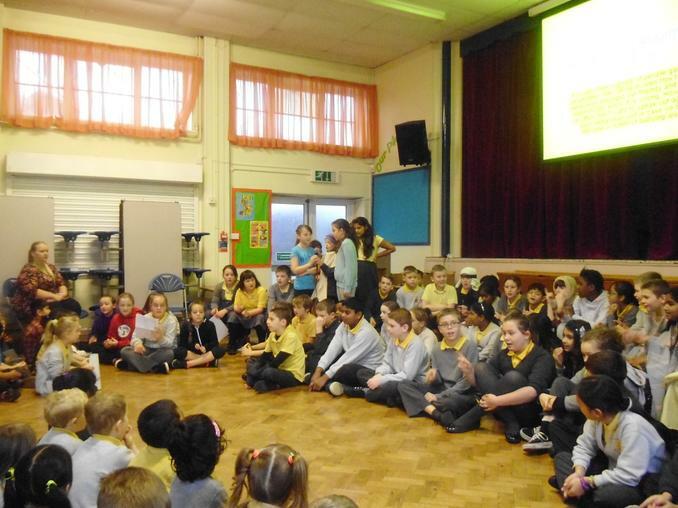 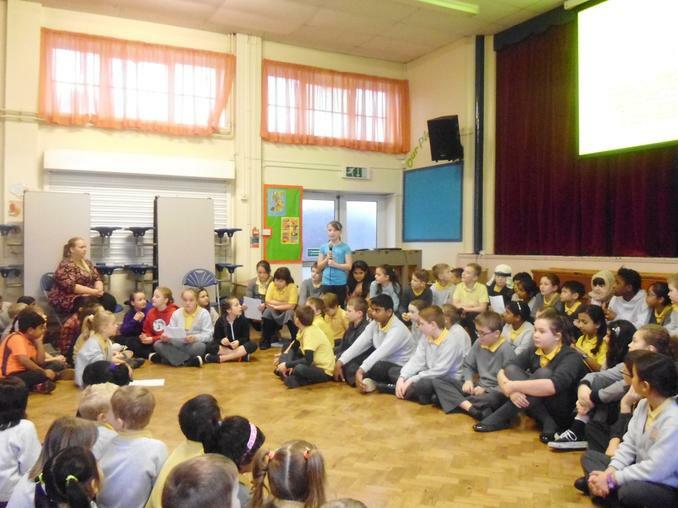 Class Seven's Class Assembly - October 8th - We are all made in the image of God. 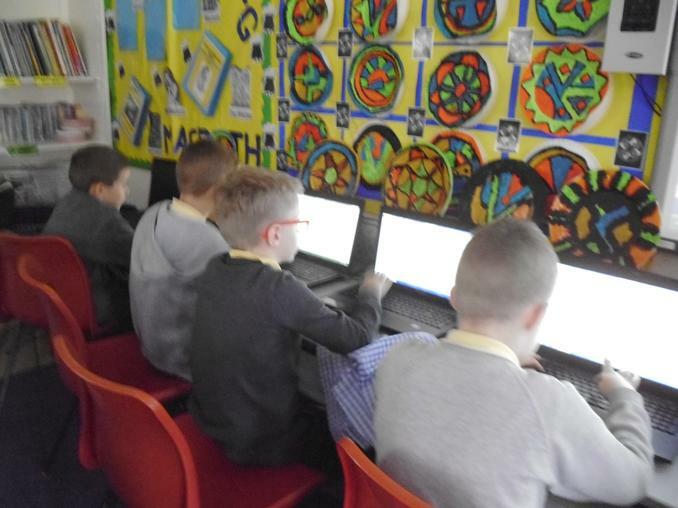 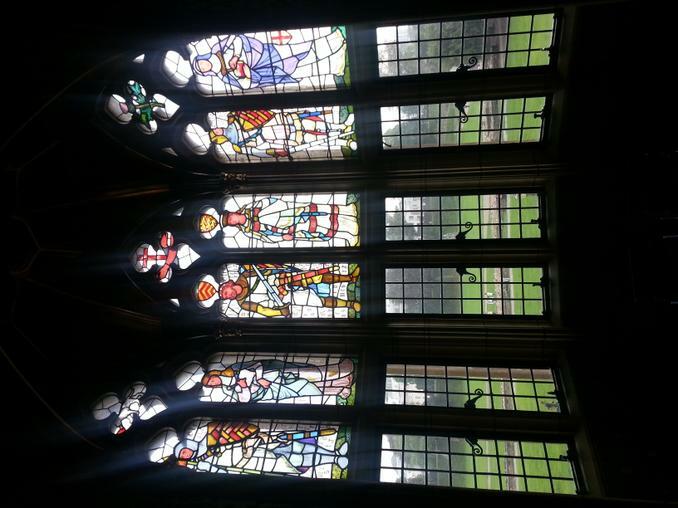 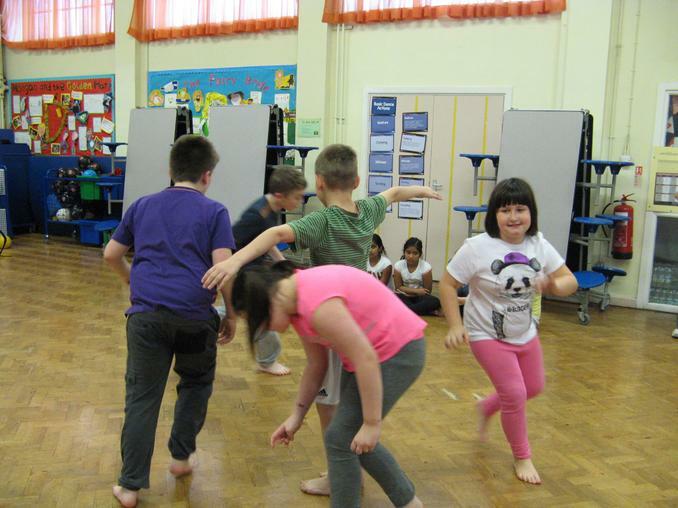 The children will be required to sit assessments in May 2015. 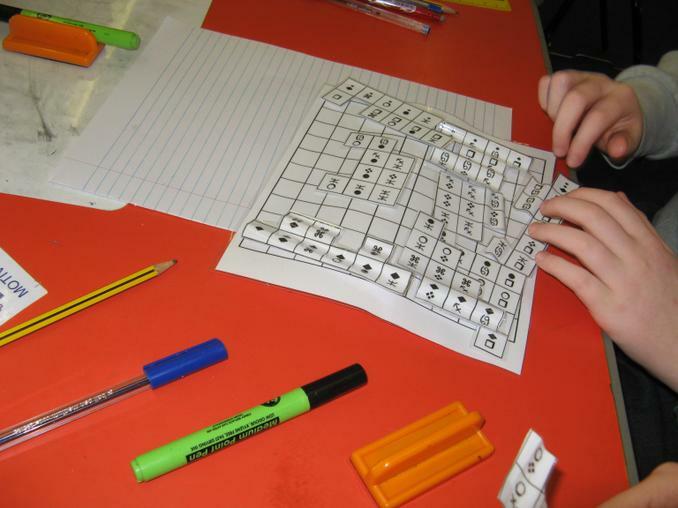 I have included examples of these tasks so that children 'can have a go' at these style of questions at home. 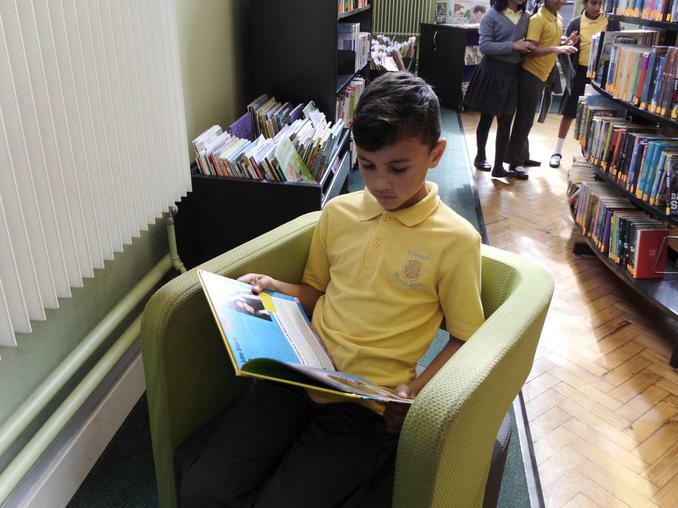 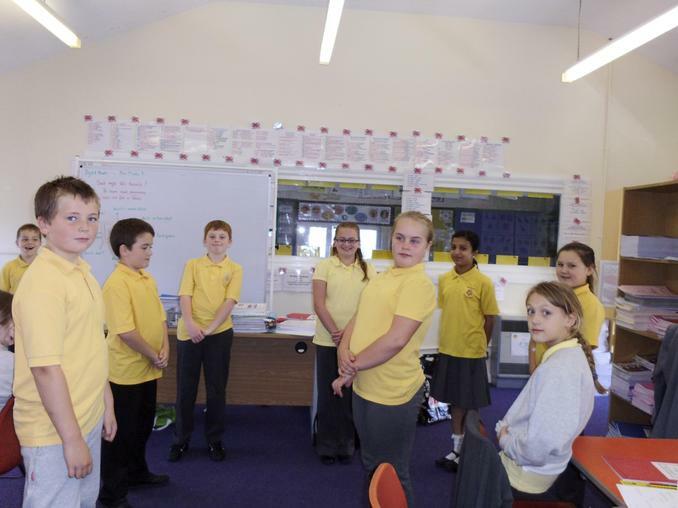 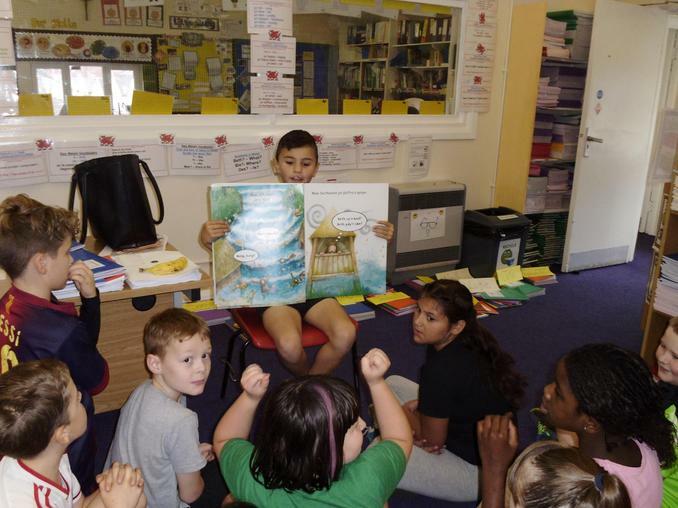 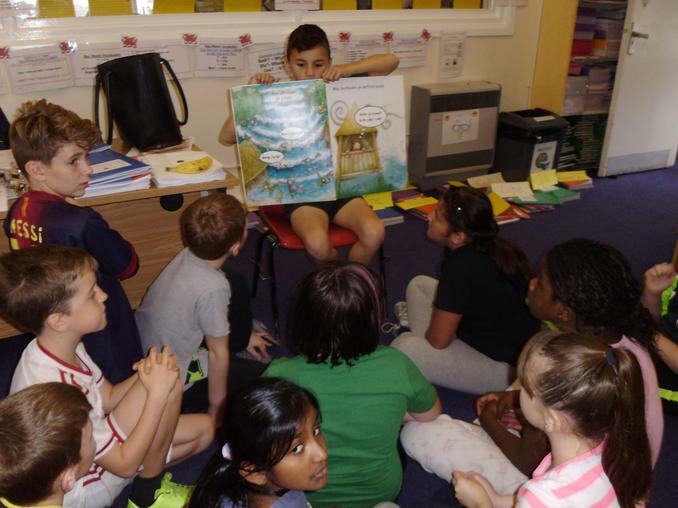 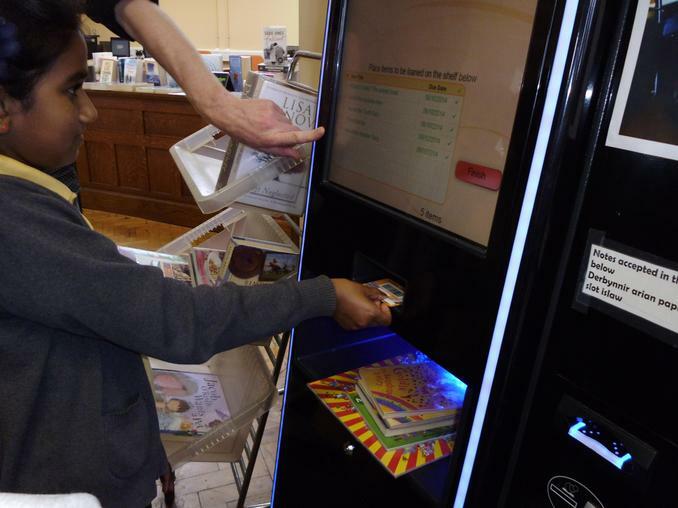 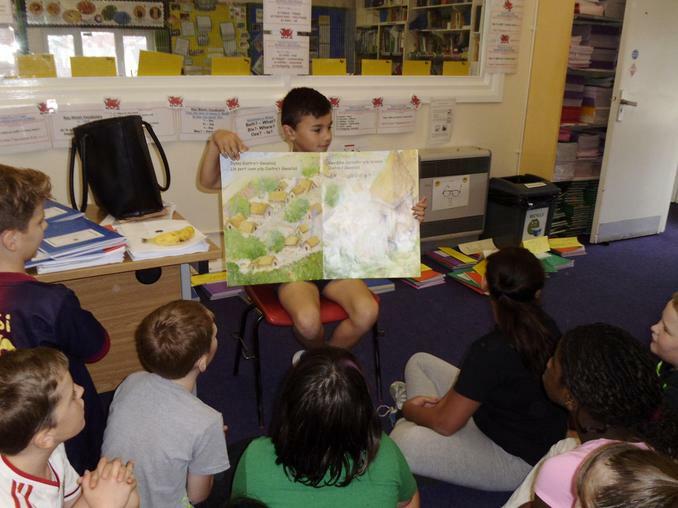 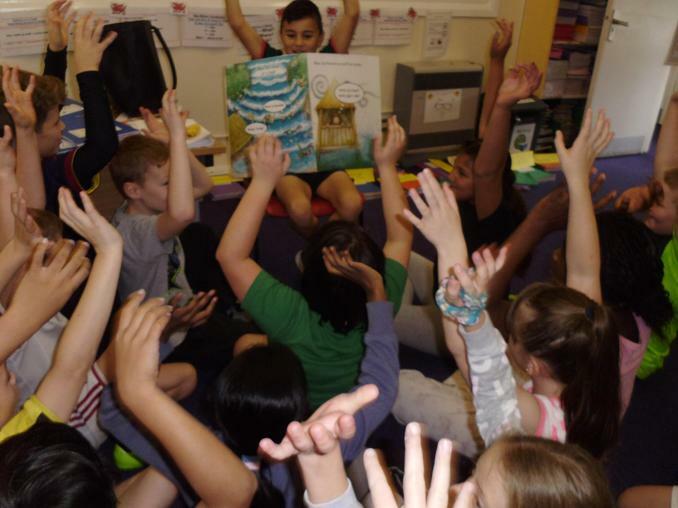 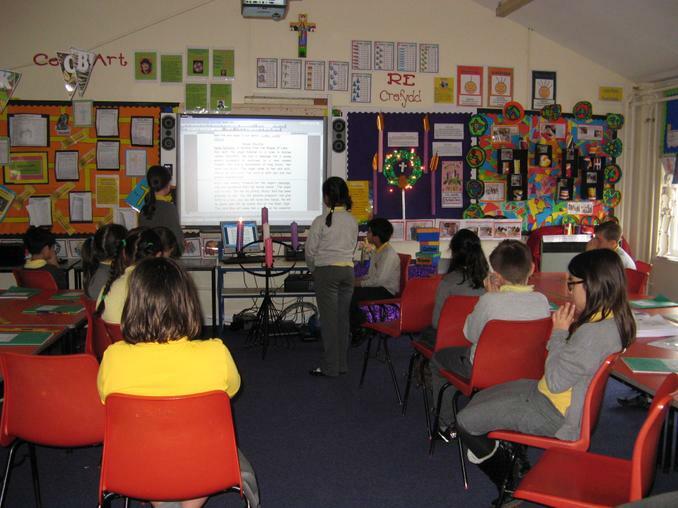 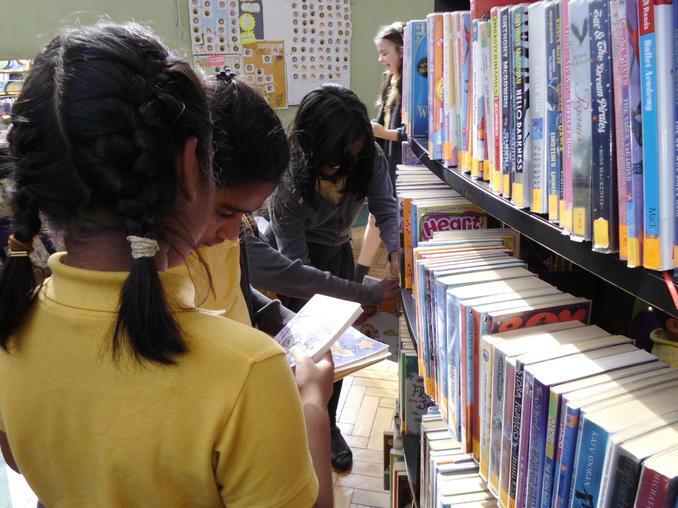 As part of an initiative to encourage reading within Saint Joseph’s school, the children in year five visited Cathays Library in the 15th September. 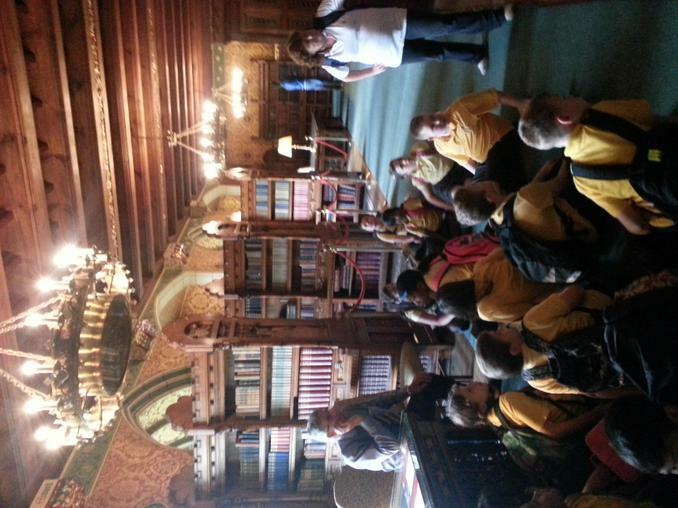 The children were able to browse and choose books and then use their library cards to borrow the books. 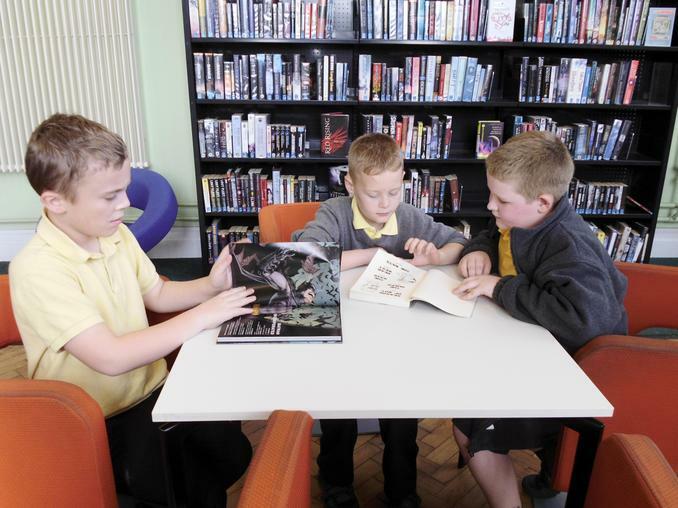 Parents are reminded that these books should be returned to any library in the Cardiff area within three weeks. 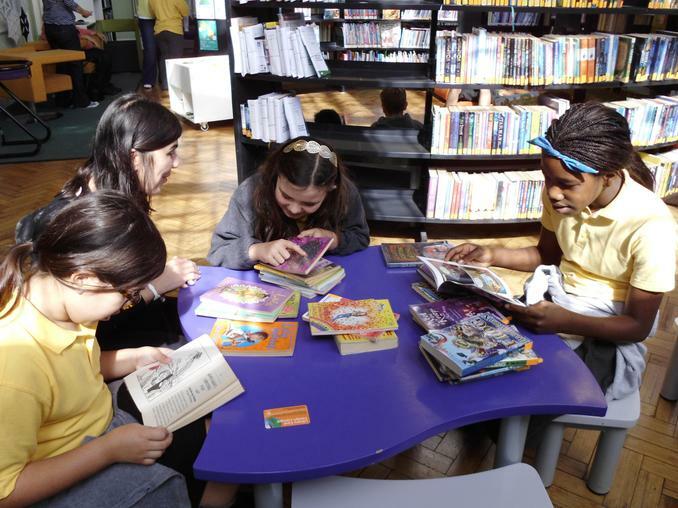 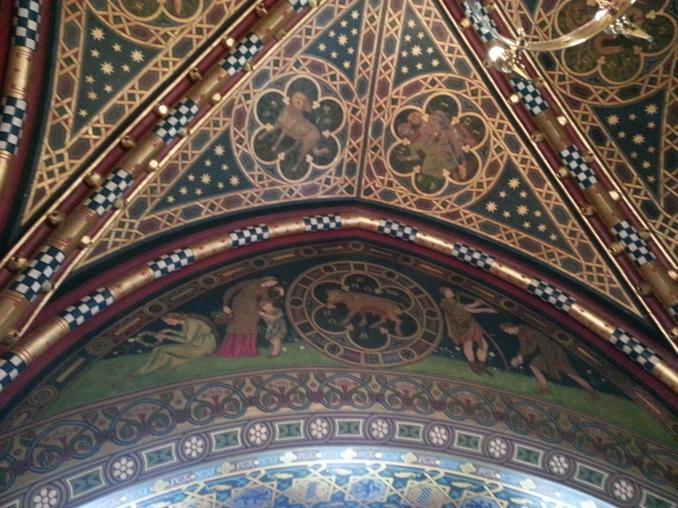 Many thanks to those parents who helped me supervise the children to Cathays Library, the children’s behaviour was exemplary. 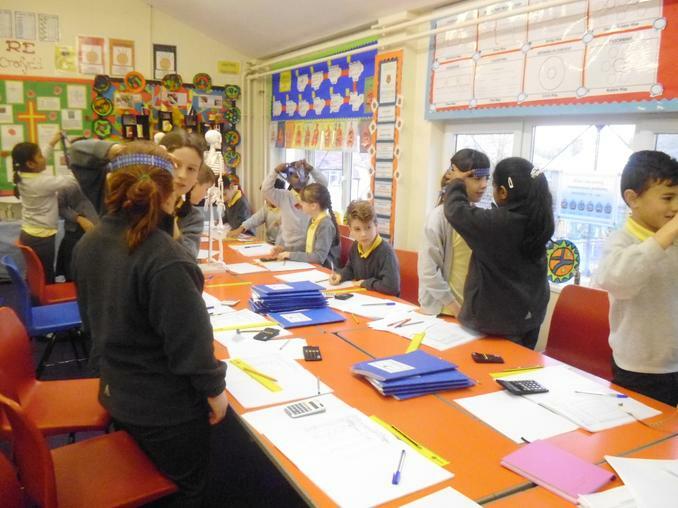 Year six wondered how we could make the particle theory easier to remember and more exciting. 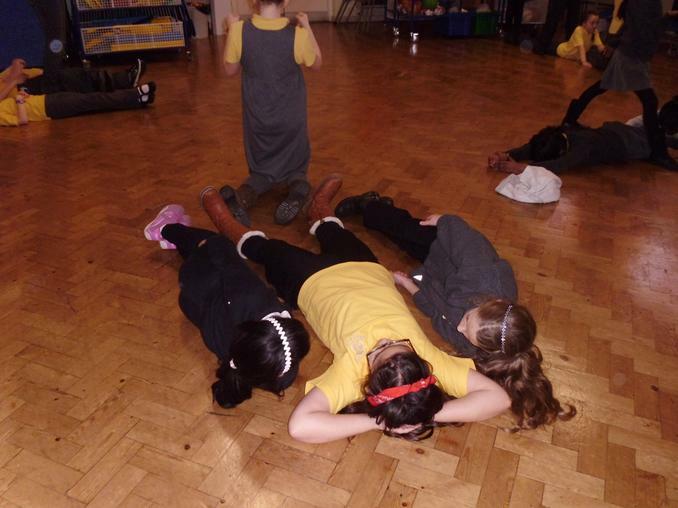 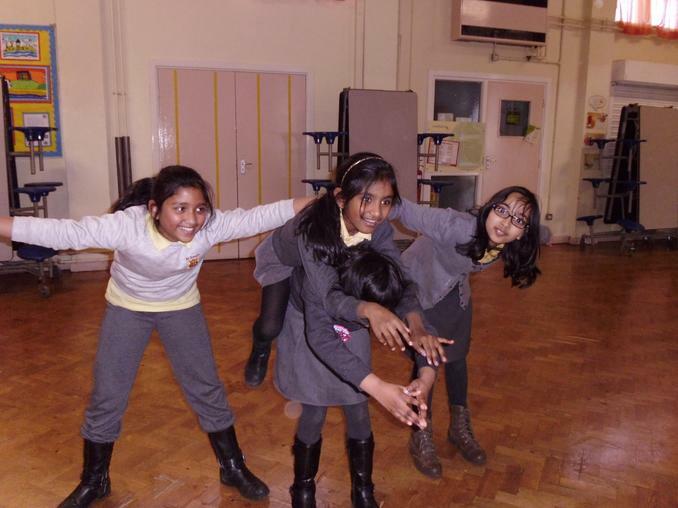 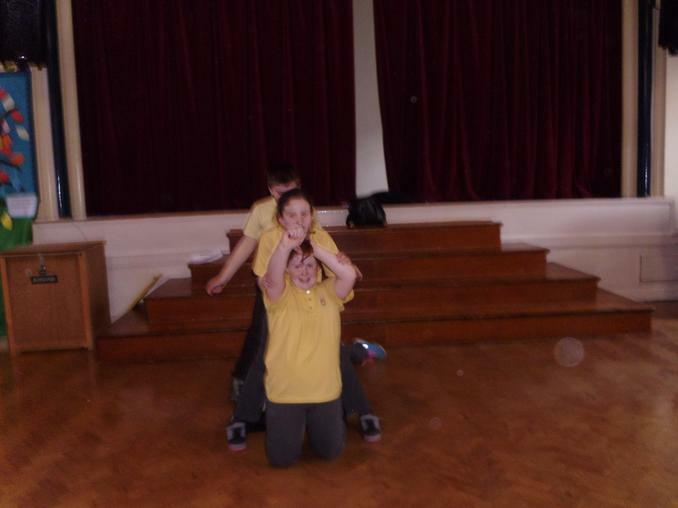 Therefore we decided that we would make human models of the particles contained in a solid, liquid and a gas. 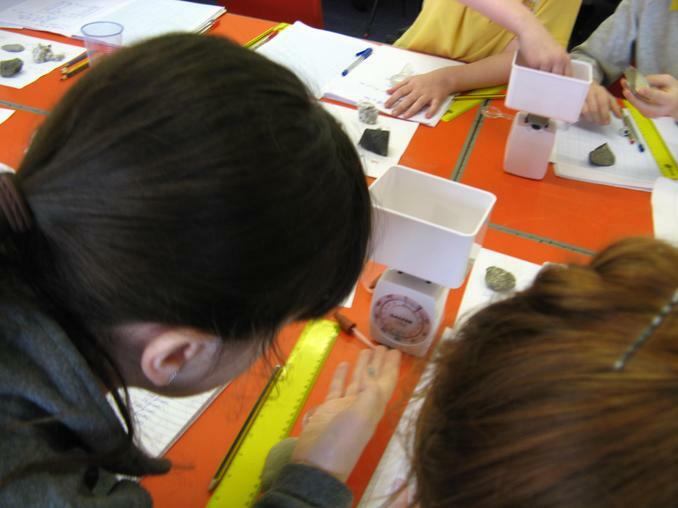 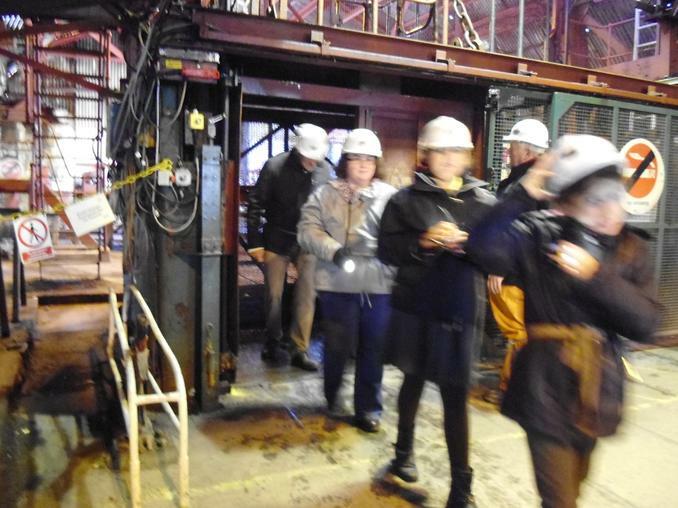 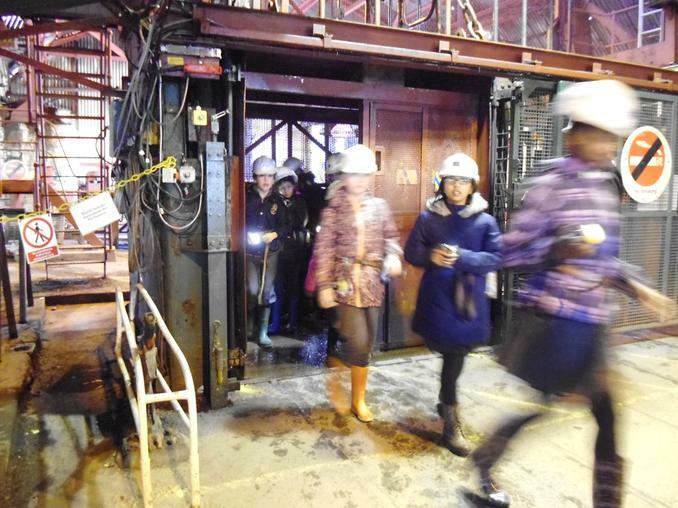 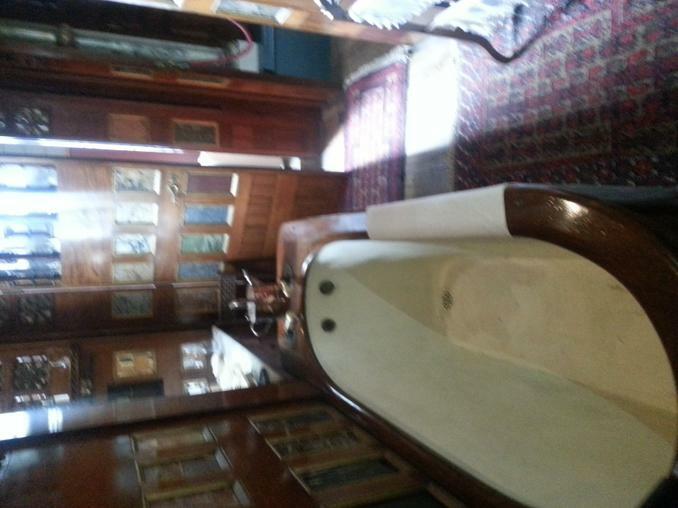 Steel, plastic and wood are solids at room temperature. 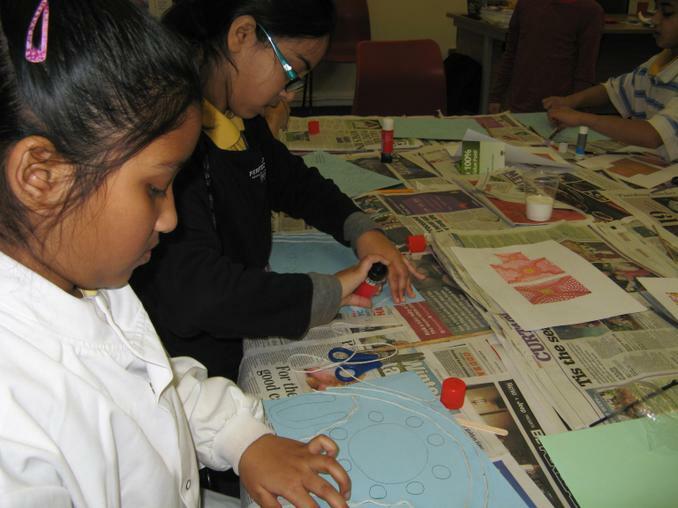 Ice is solid water. 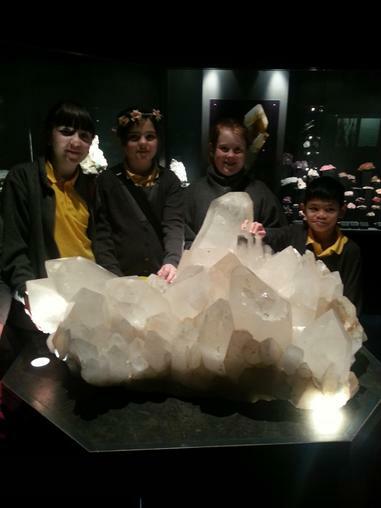 The particles in a solid have the following characteristics: They are close together. 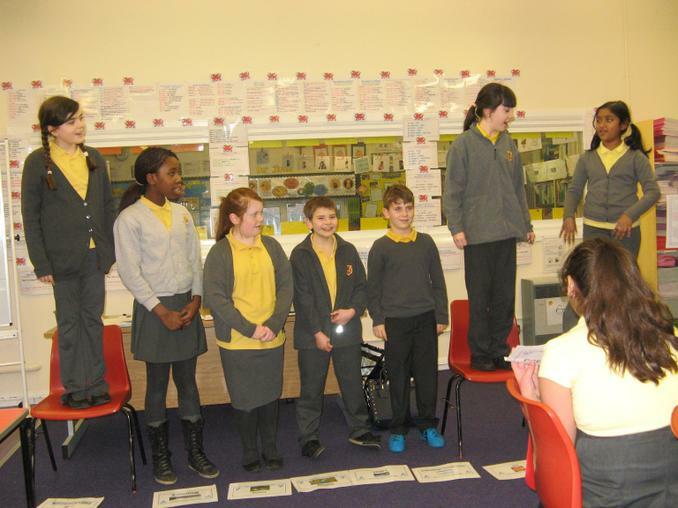 Human model of the particles in a solid. 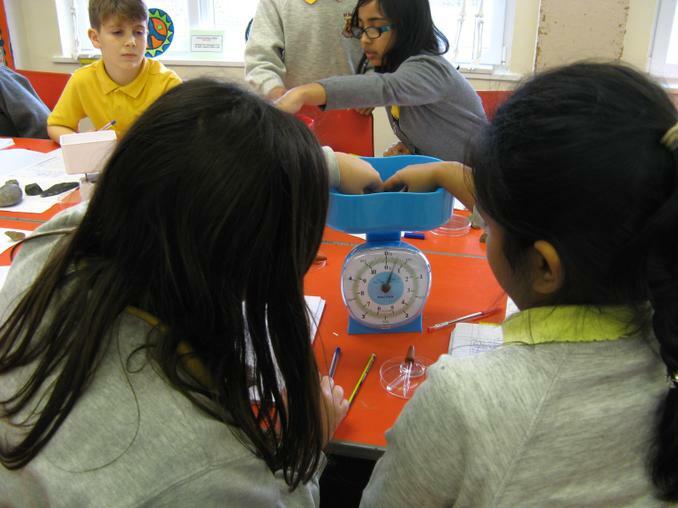 Mercury, lemonade and water are liquids at room temperature. 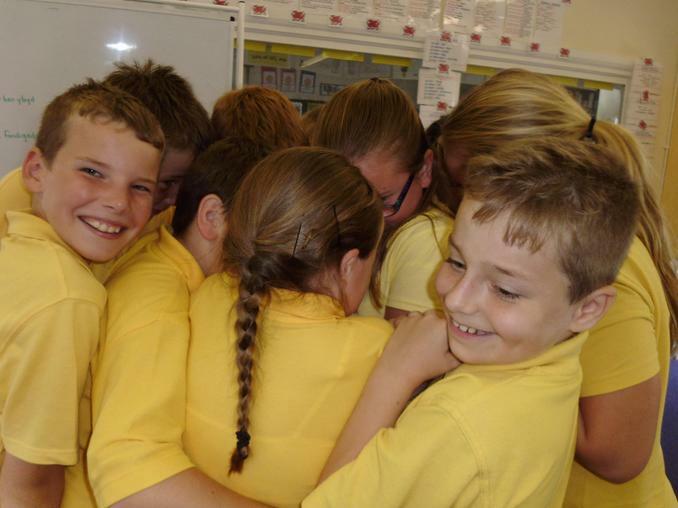 The particles in a liquid are: close together, arranged in a random way. 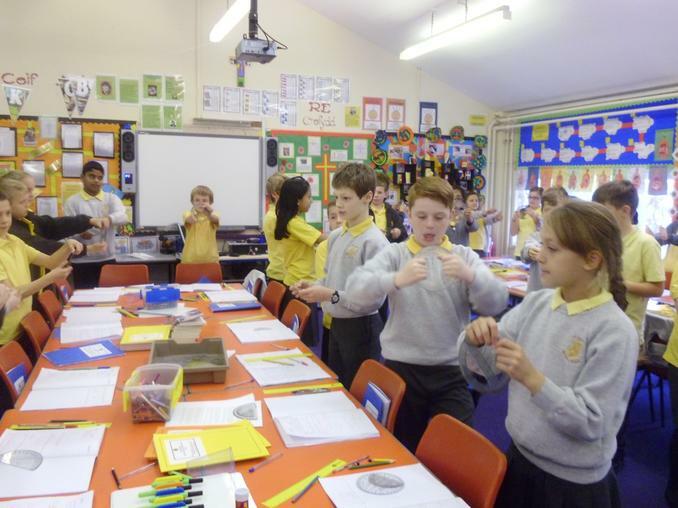 The particles in a liquid can: move around each other. 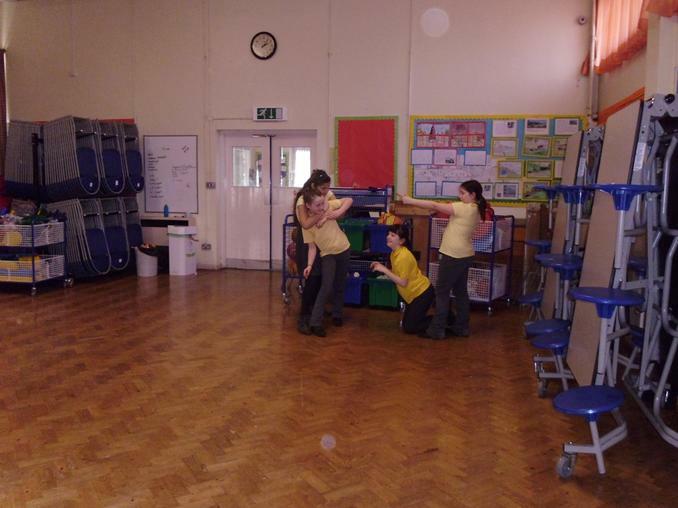 Human model of the particles in a liquid. 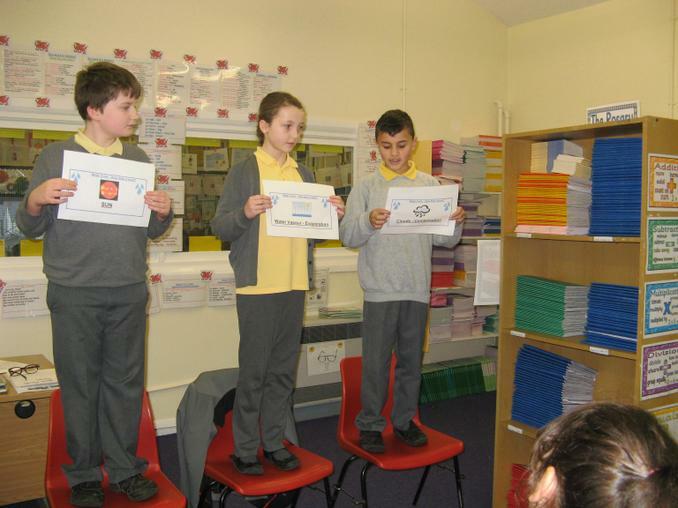 Air and helium are gases at room temperature. 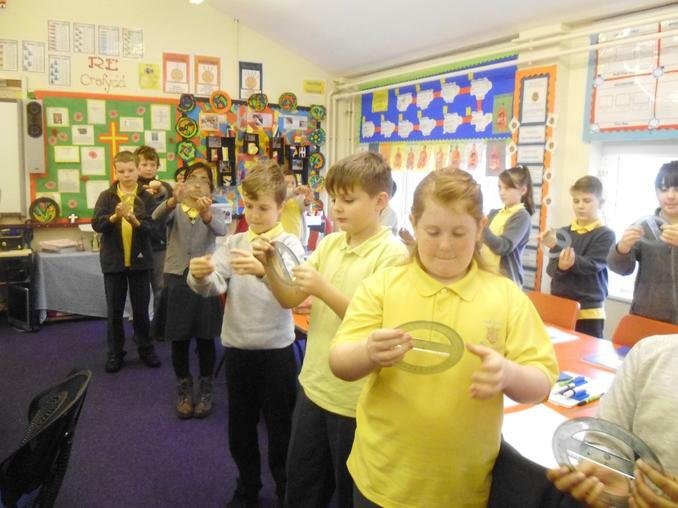 Water vapour is water as a gas. 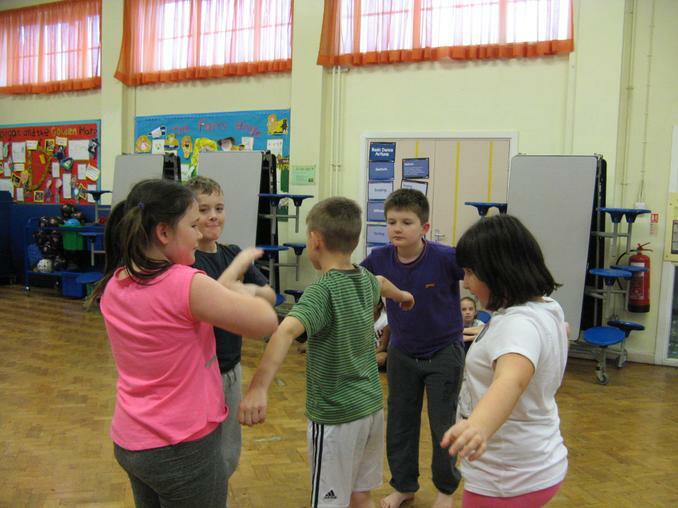 The particles in a gas are and arranged in a random way The particles in a gas can move quickly in all directions. 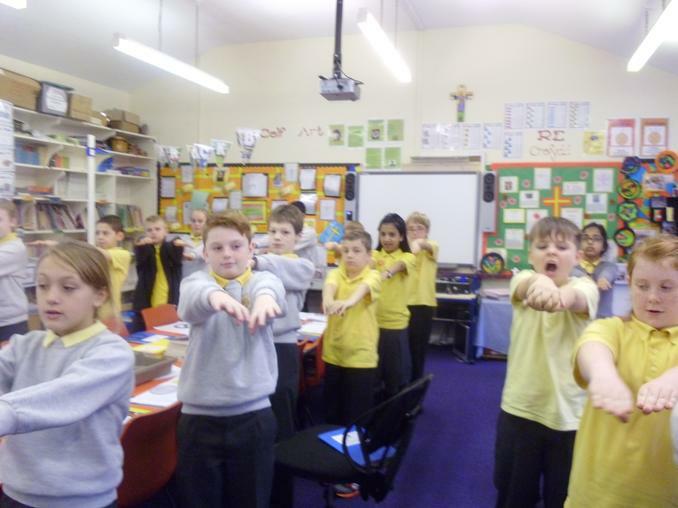 Human model of the particles in a gas.